The following 106 messages have been found. 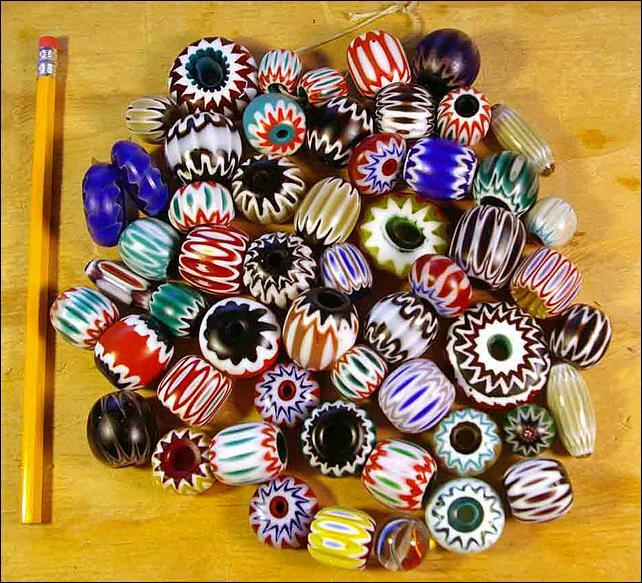 Does anybody still make glass beads one- by- one? While we certainly love the old - it's been a while since we've seen anything new being made out of glass. Been thinking about breaking out the torches? For new members, the drawing works like gift drawings that big families used to do... I keep everyone's name/email address in a file. When we do the drawing, I print out this list and cut everyone's name into it's own little piece of paper. We then literally toss these all into a hat, the old fashioned way. I sit with the list of everyone's name, and for each person, Colin draws a name from the hat. Then I notify everyone with the contact info for their swap recipient. So, every person mails one gift. And every person receives one gift from someone else. The bead gift should have a retail value of 25.00 or thereabouts. Value is so subjective and variable anyway, depending upon the circumstances of acquisition. Bead Santas are welcome to contact their recipient if you'd like to find out more about their tastes….or, you may wish to remain a totally anonymous Secret Santa, the choice is yours! What to give? 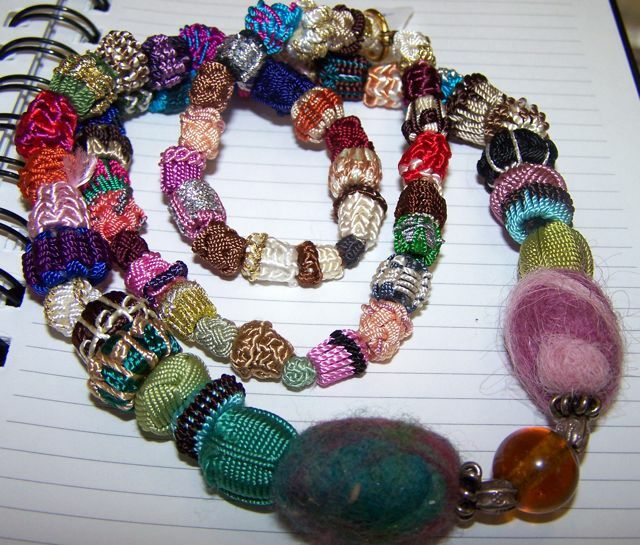 Anything bead related..…a bead or multiples, bead books or calendars, finished jewelry using beads, or art using beads. Please feel free to post here, but also PLEASE email me with your full name and mailing address in order to join the swap. This makes it easy for me to promptly add you to the list. Especially new people! There is no way for me to include you without your mailing address! The deadline to enter will be Midnight Pacific time Saturday night, November 26, then we'll do the drawing and get the emails out through the day on Sunday. This gives everyone about two weeks to "get on board". For international shipment, I strongly suggest getting your package in the mail by December 6. For domestic U.S. shipment, I'll suggest a shipping deadline of December 15. Priority is generally 3 days, but with the holiday season delays can happen. First Class mail is a good deal cheaper for packages under 13 ounces, but slower, too. 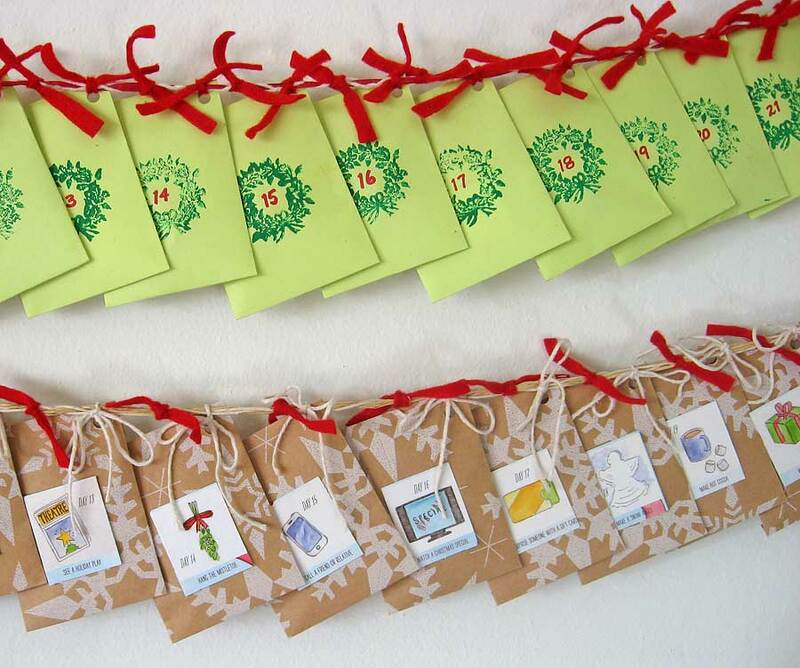 This is a wonderful holiday ritual about community and sharing in the fun of our common passion. The internet has enabled us to evolve as a global collector community; many international bead friendships have started here on BCN. Our record in 2012 was 47 participants from approximately 11 countries and multiple U.S. states. Generally, we are about 40. The more the merrier! Please remember: what unifies the whole "event" is your follow-through with getting your gift in the mail in a timely manner. Please do not participate if you are so busy this time of year that the commitment you make when you enter could be forgotten. I can’t emphasize this enough. You are making ME worry when you don’t follow through with your commitment in a timely manner. And that takes away from MY fun (not to mention the fun of your recipient, who probably shipped in time), and I admit a part of my reason for doing this is that it’s FUN. Okay? Thanks to everyone for being part of BCN! We are celebrating 15 1/2 years of bead talk on the net. Thank you all for your participation! Re: It's time! The 11th Annual BCN Holiday Bead Swap! Join up by November 26... -- Joyce Post Reply Edit Forum Where am I? Re: Happy Birthday, Tasart! :) -- Joyce Post Reply Edit Forum Where am I? Please post images of some your favorite but badly beaten beads. Re: Please post images of some your favorite but badly beaten beads. -- Frederick II Post Reply Edit Forum Where am I? on the face, this bead is in perfect condition, underneath is where the "badly beaten" wear is plain to see, one can also assume from the care in making this bead a wearable bead again with the metal repair, it was a very loved bead! One of my favorites! 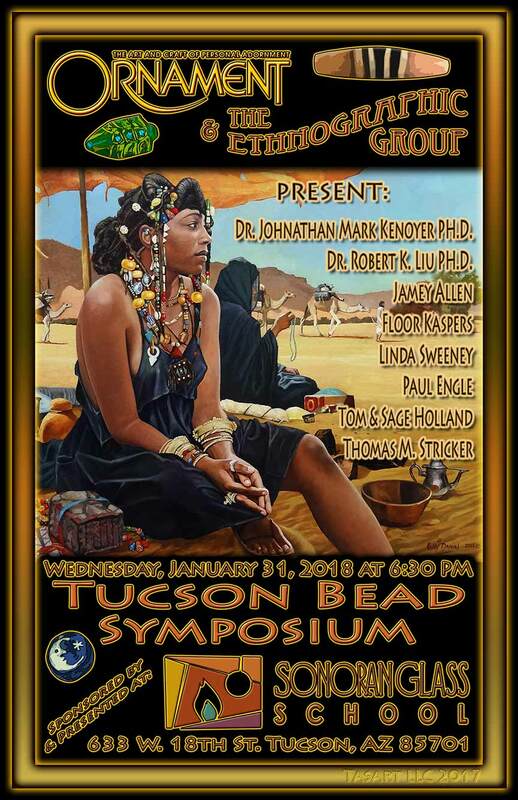 Come visit in Tucson and attend our symposium!!!! Building on my article Nubian Mosaic Face Beads. 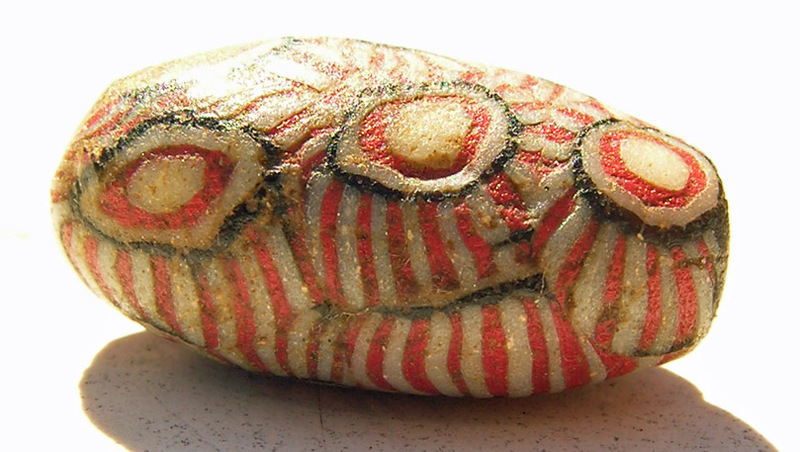 The Enigma of Variations, Ornament 37/5, 2014, I hope to determine if all mosaic face beads excavated by George Reisner in Nubia were locally modified or not, and if so, were mosaic face beads of Medusa as a Gorgon with stylized snake hair the basis of all early face beads. This would mean that all mosaic face beads of Medusa as a woman with long hair, bust and necklace are the result of altering the basic face cane by secondary hotworking. Floor Kaspers / Glass artist and independent researcher from the Netherlands. 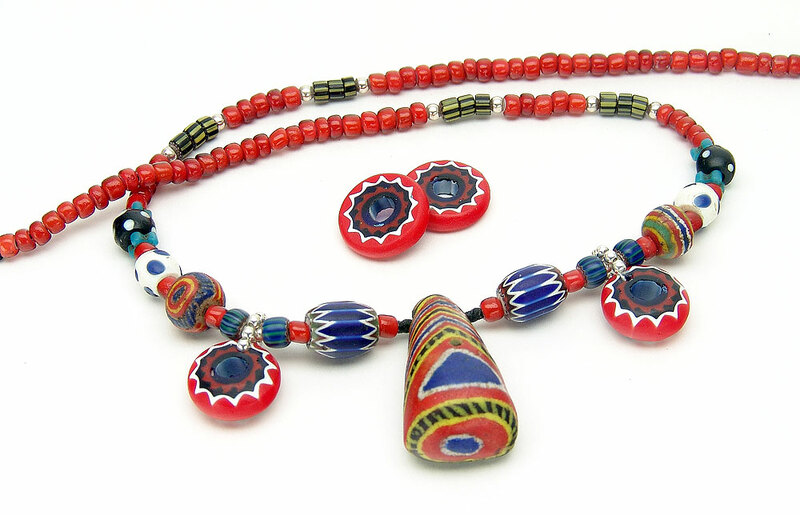 The beadmakers in the Czech region of Jablonec have been masters at a great variety of glass beads to match artefacts and materials that were popular around the world in the 19th and early20th century . Talhakimts, prayer beads, shells, coral, lion’s teeth, amber, all made in glass, were only some of their products. 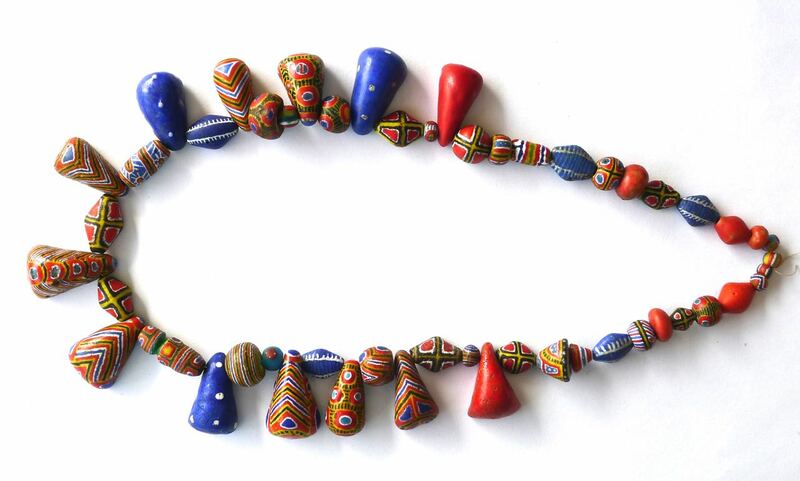 The presentation will focus on the way the Czechs created a demand for their beads in parts of Africa and Asia, and will show a variety of examples. 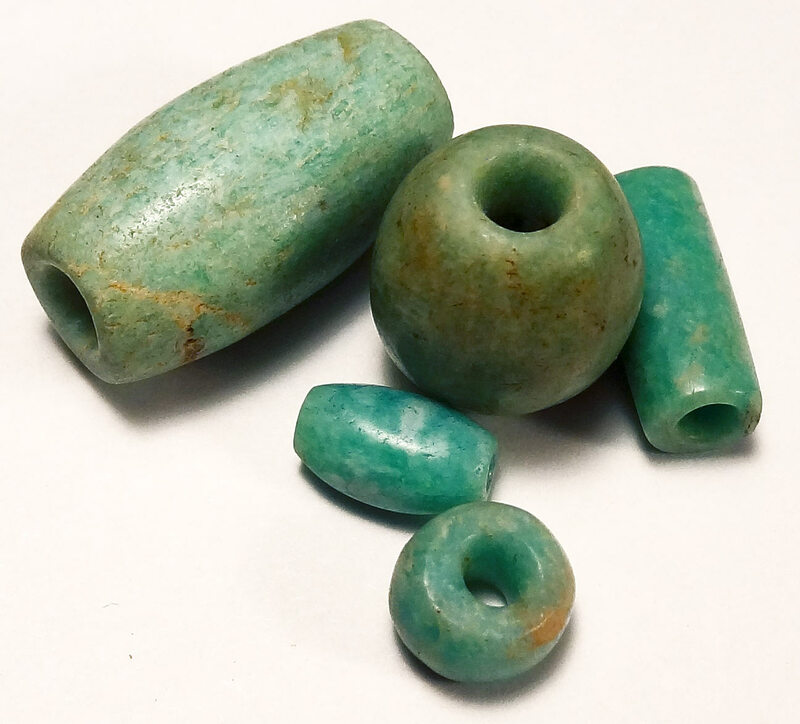 This presentation will provide an overview of recent approaches to the study ancient stone beads in Asia, with a focus on the Indus Valley Civilization, 2600-1900 BCE. 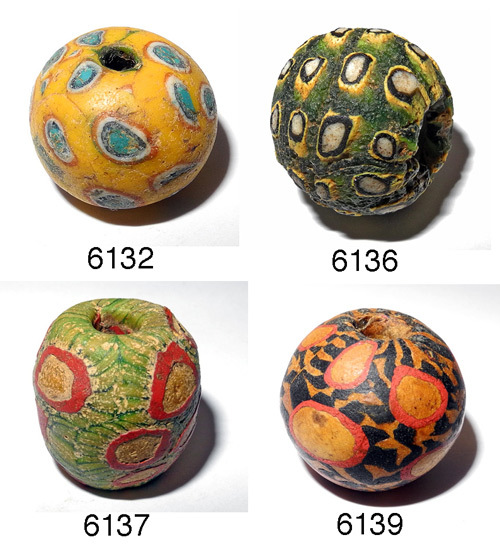 Systematic studies of beads from excavated contexts in the Indus region have made it possible to define specific aspects of ancient bead styles and production techniques. 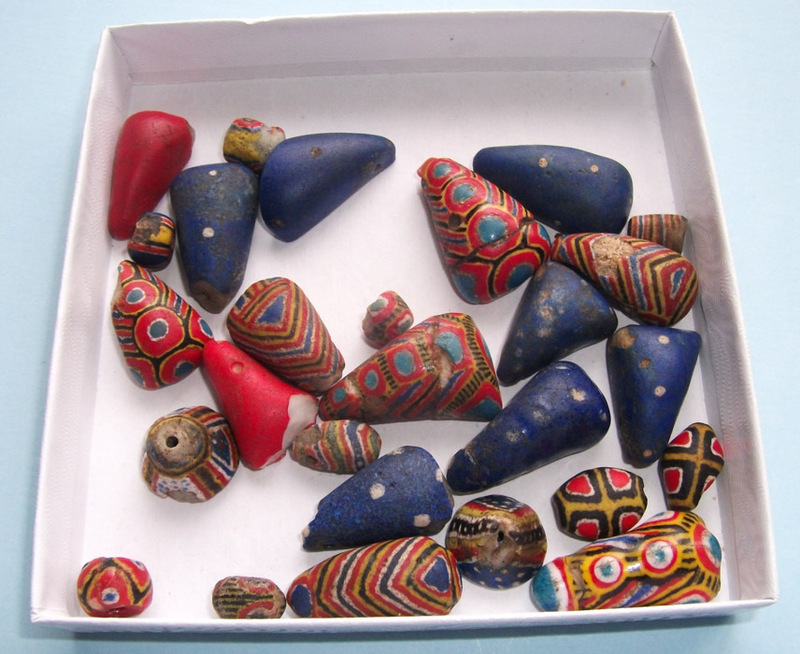 This approach has made it possible to determine the trade of beads from workshops in South Asia to distant regions in West Asia and Central Asia. 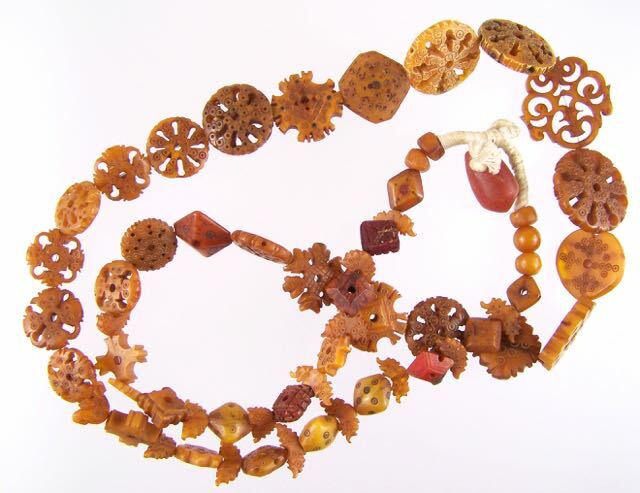 Beads made with Indus technology and raw materials were also produced outside of the Indus region, and this can be determined using both stylistic analysis and the geological sourcing of carnelian. Various sourcing techniques will be discussed and preliminary results presented. 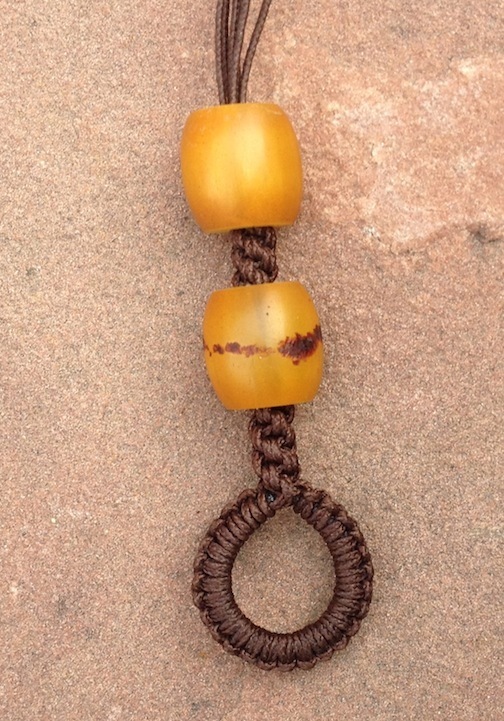 Join Tom in an exploration of the human relationship with the knotted string and the bead. 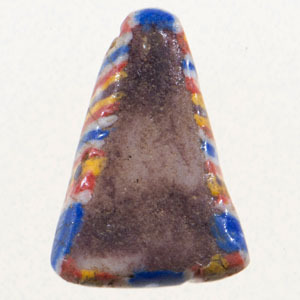 This presentation will show images of some of the earliest beads, then advance through time to the invention of glass. 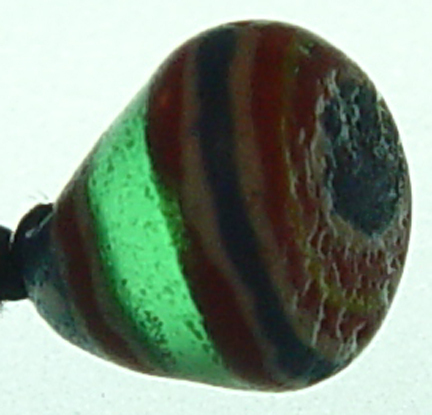 Along with highlighting the use of glass stringer work in glass bead history. Paul Engle / Award winning writer and independent researcher Exploring glass coloring in Renaissance Europe for beads and ornaments . 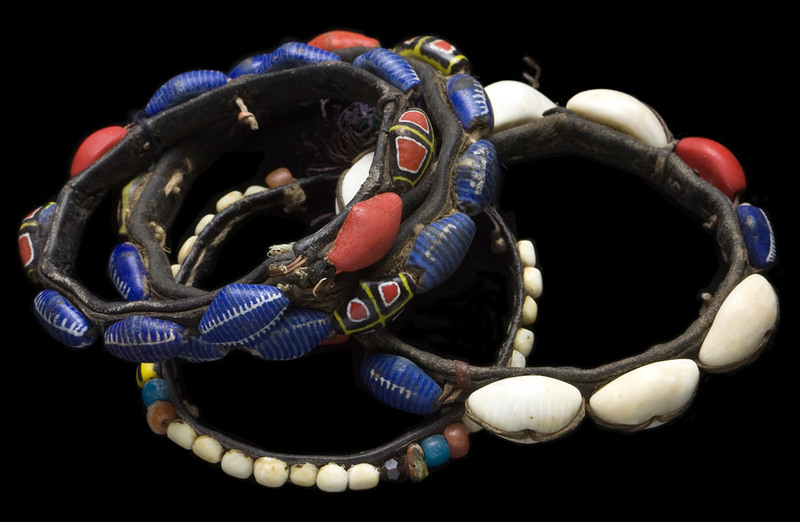 Kiffa (Muraqat), Bodom and akoso, plus a brief introduction of Billy Steinberg's new book, "Wild Beads of Africa"
Re: kiffa bead -- Dog Bone Crazy Post Reply Edit Forum Where am I? This year, I did not do a lot of buying in Tucson. Mostly selling (at the Sonoran Glass Art show) and meeting people. Thank you everyone for making it once again a memorable experience. Some of these were bought, others were gifts and some were trades. A mixed bunch..
Fist is an Idar-Oberstein talhakimt which drew my attention because it has been repaired with, I think, lead. 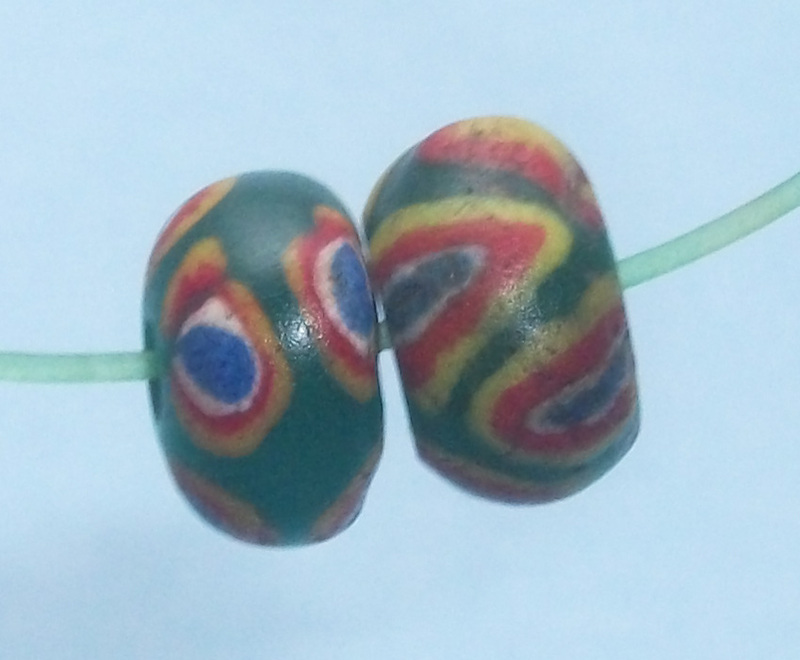 Second are two large Bohemian glass beads. They are a similar size (picture is misleading) but one weighs a lot less than the other. Re: My Tucson finds -- floorkasp Post Reply Edit Forum Where am I? 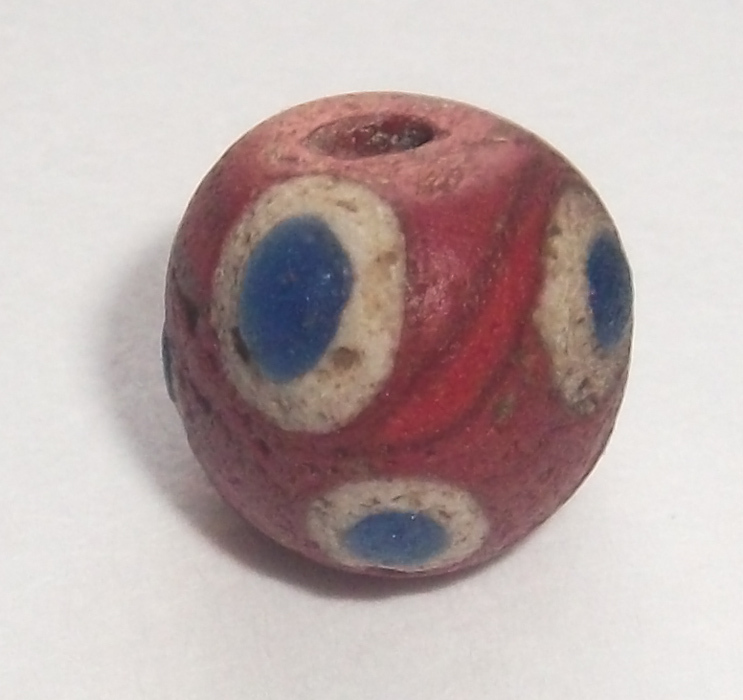 The blue bead is a very rare Briare Prosser bead, courtesy of Thomas. Some time ago somebody posted a sweet little necklace with tiny Muraqat. I said, back then, that I would own such beads in an even smaller size. Seems I have been wrong! Mine, the ones you see on the attached photos, are possibly of same small size and not as tiny as I falsely remembered. Those (small) beads I was refering too, had not been in my possession at the time. Since I am back from Tucson, this beads - and others - are with me again (that's why I can post some of them today). The smallest bead on the attached photos is 2.6 mm diamter. All others on the strand are slightly bigger - up to ca. 5mm diameter, what makes them more or less the same size than the those of the previous poster. Still - this beads (the one of this poster and mine) are surprisingly tiny. 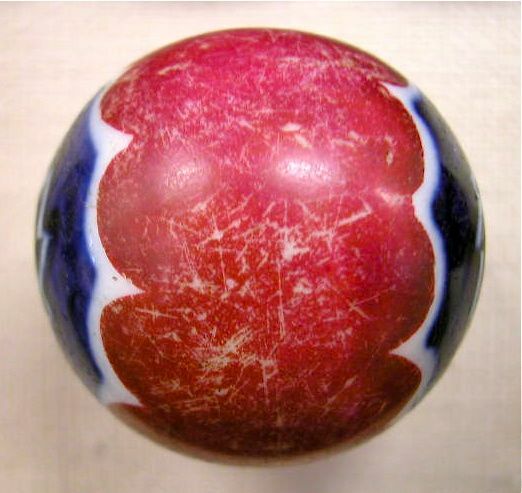 It is truely amazing that the Mauretanian craftswoman are able to apply such intricate designs onto such tiny cores, and that leaves unconsidered their very basic tools. In order to demonstrate the tiny size of certain Muraqat, I photographed one such strand of tiny specimen (2.6 - 5 mm diamter) together with a few pieces of avarage size. Re: MURAQAT - small size vs. avarage size -- Timbuk-2 Post Reply Edit Forum Where am I? 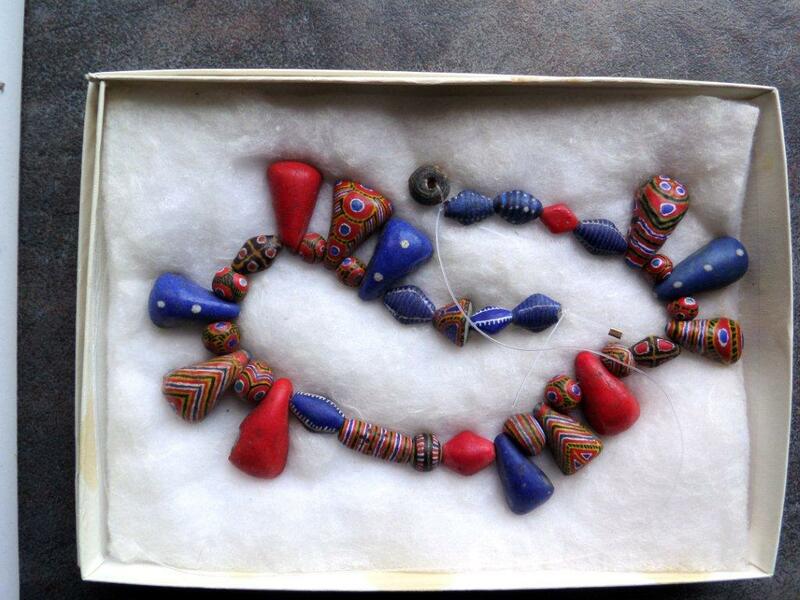 I finally found the photo of a complete necklace, made 2012 in a camp south of Kiffa - southern Mauritania! Re: MURAQAT vs. Kiffa Beads -- Timbuk-2 Post Reply Edit Forum Where am I? An unusual strand, to say the least! As a lover of tiny and intricate little things of art (like Netsuke, for example) it's nice to see what others do with liliput things. 1.) The beads - leave alone no size or reference was delivered - might belong to the smaller versions within the Muraqat-family, but there are certainly (much) smaller pieces then the ones presented here. I can deliver proof only after Tucson-2017, but will then show you a whole strand of old micro-Kiffas in great shape and intricate designs. 2.) 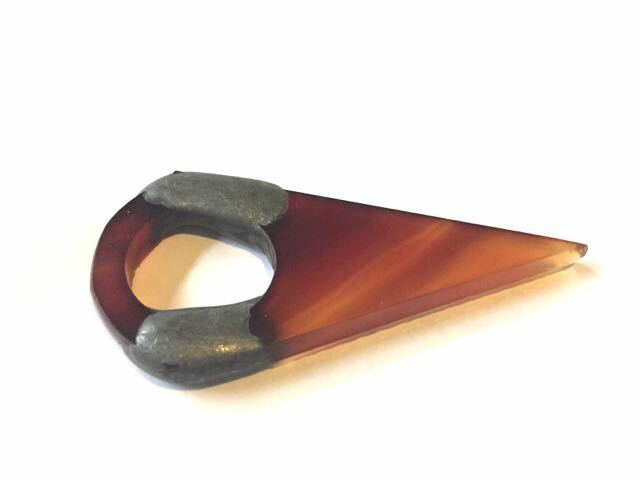 The nice little "amber-pieces" appear to be phenolic resin or "African amber", if you like to call them such. Those pieces are of a more recent manufacture, though it must be said that (old) "age" alone is not the only factor for beauty or value. Had been nice to see them being worn, though I bet that looks cute! Re: See Also Here -- Beadman Post Reply Edit Forum Where am I? Re: And Here -- Beadman Post Reply Edit Forum Where am I? “Right, Kirk insisted - that was a few years ago, when he returned from a trip to Mauritania - the correct Hassaniya name for ‘Kiffa Beads’ is ‘MURACAD’. True is [sic] is further, that I disagreed an [sic] said ‘NURACAD’ was the correct spelling an pronounciation [sic]. With an ‘N’ and not an ‘M’ in the front, I said! Kirk said the opposite! The difference was the difference between an ‘M’ and an ‘N’. “I propose we change old habbits and call the beads Muraqat (‘The Colorful’)- their real name ..., in Mauritania, their place of origin." “Locally called ‘HAMBLIYA’, this ca. 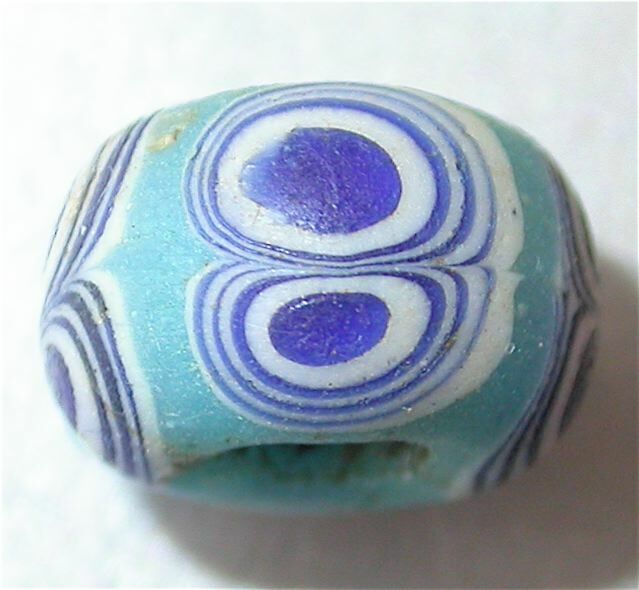 1000 year old drawn bead from Fustat (Cairo) - being of the same period than ‘MORFIA’..."
“I agree that Islamic Period glass beads are ‘ancient’ beads—and I have never said otherwise. In fact, I am the PRIME motivator in the recognition of the contribution of beadmaking from this period. 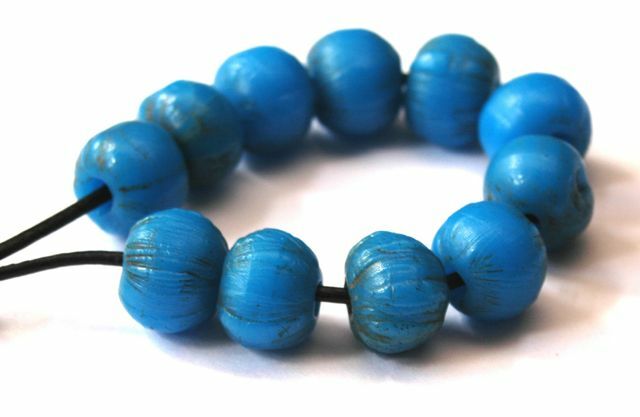 Prior to my personal work in this arena, the typical presentation of these beads suggested they were ‘Roman’—making them about 1,000 year's too early. I have worked for twenty-three years to change this perception and misrepresentation, beginning with what I still regard as the correct timeframe for beads from West Africa that I maintain are Islamic, but that are still routinely misrepresented as ‘Roman’ (that began in the mid-1980s). There can be no doubt that the tradition of Islamic beadmaking extends back into Roman times, and no doubt that this is an ancient tradition. However, it is much less than accurate to call it a ‘Roman tradition’—because this region is the HOME of glassworking, and it's the Romans who merely exploited it rather than devised it. 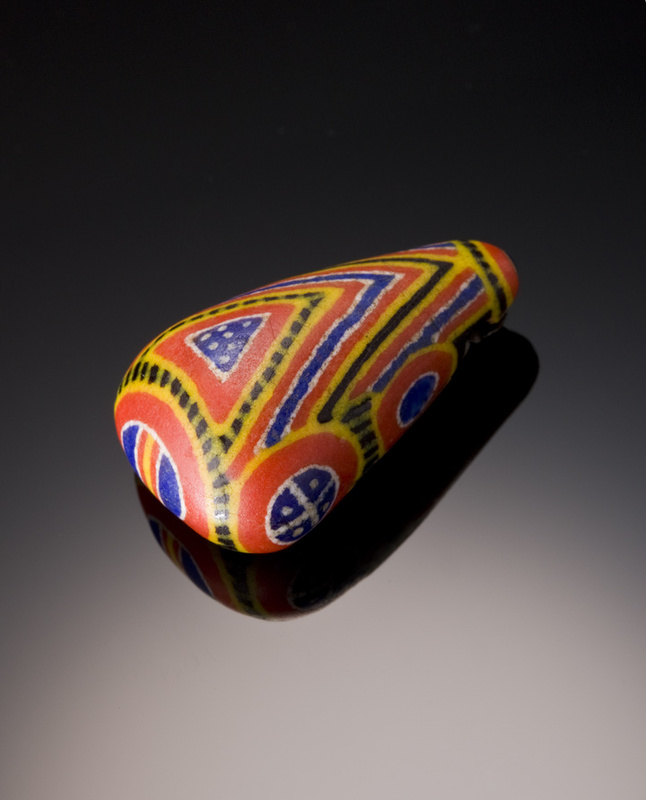 “This is a rolled-pad glass bead, made from a millefiori plaque. As such it cannot be Venetian, because they never made beads this way. 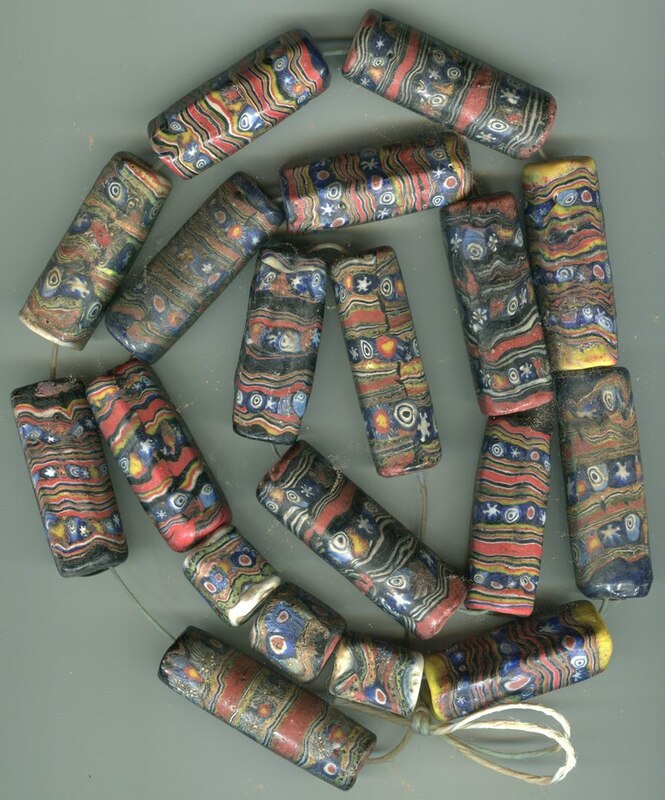 Rolled-pad beads date from Roman through Islamic times, and are practically no longer made (even by most fakers--which is how you can tell a bead is a fake). 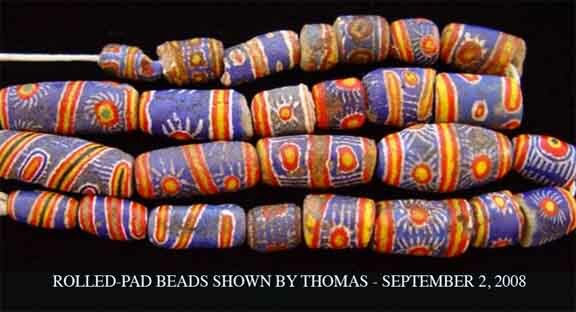 Your bead is somewhat similar to a bunch Thomas Stricker showed a while back, though from simpler canes. 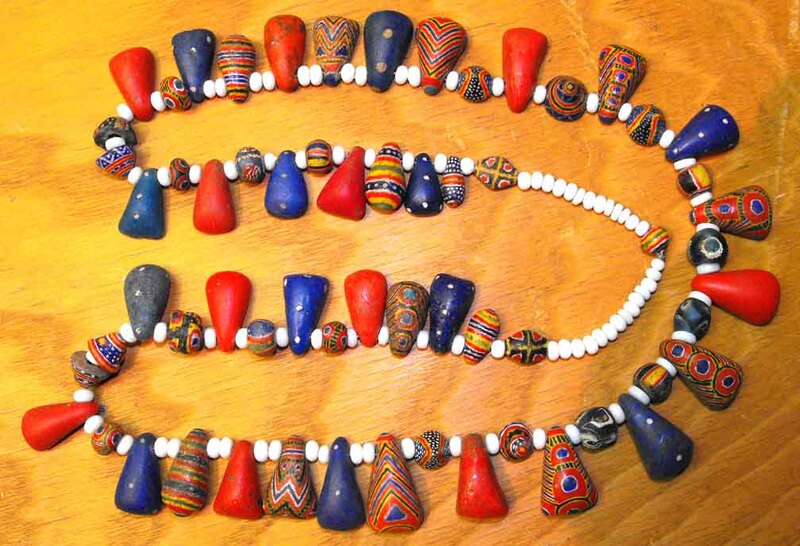 These are Islamic Period beads that inspired certain beads from Mauritania in the Kiffa (muracad) family. 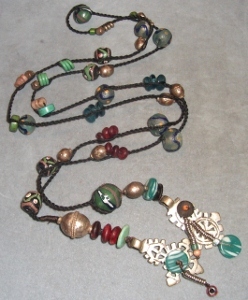 They are fairly rare beads--so enjoy. “You are wrong on several counts. You are wrong initially because you jump into a judgement about these beads without offering any adequate justification for your opinion. You say, at one point, that the right-hand bead is a fake made in Indonesia. 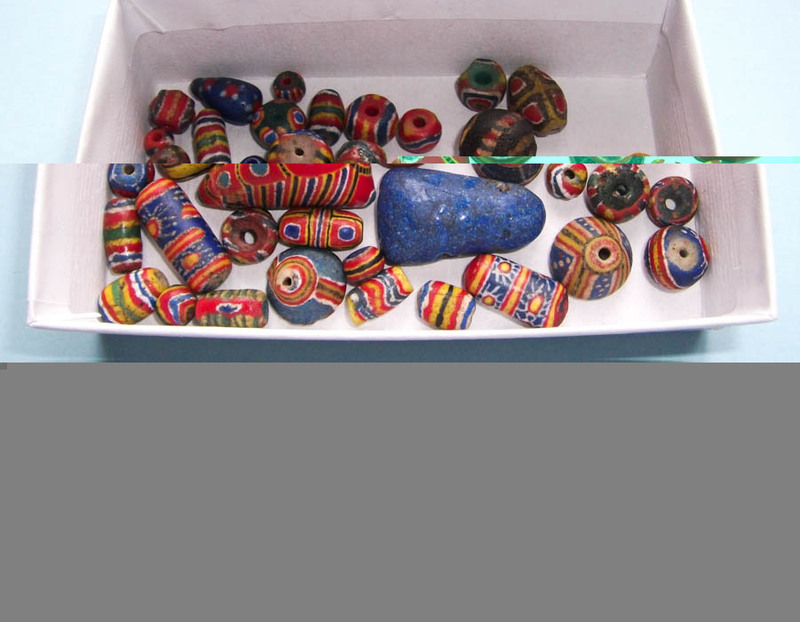 In fact, it is nothing like the Indonesian fakes of Warring States beads. Then, elsewhere, you say that you have seen a lot of these beads in Peshawar. I know Peshawar quite well, too, and I very much doubt that assertion, or rather I would bet that you didn't look closely enough at the beads you saw there to notice how different they were from the beads that Steve posted here. What I am saying is that you need to back up your assertions with something more concrete, something called evidence, and you haven't in fact done that with any of the beads whose authenticity you have recently called into question on this forum. So that makes you wrong, not just on this particular count, but habitually. It is quite simply irresponsible to start challenging things merely because you ‘feel there is something wrong with them.’ Why should I trust your feelings? I want to hear your reasons. 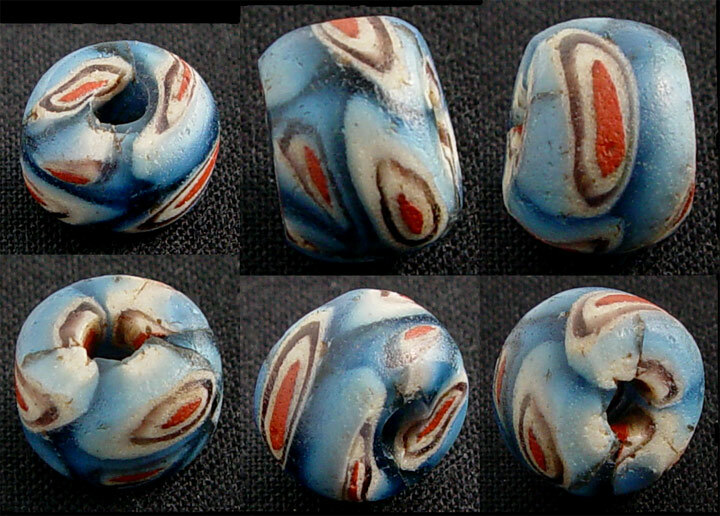 TASARTS bead is among the most fascinating "Islamic" specimen I peersonally know and have seen. There are other fascinating and possibly more striking Islamic beads around, still, this one is a bead to-die-for, as far as I am concerned. It is one of various Islamic precursors (to Muraqat). 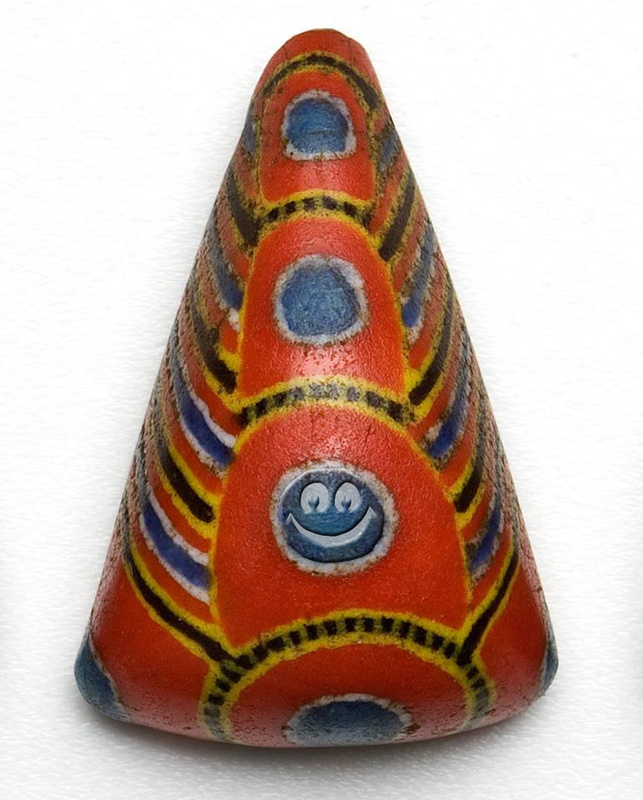 Nishedhas bead is likely striking - definitely for the "Kiffa" collector. 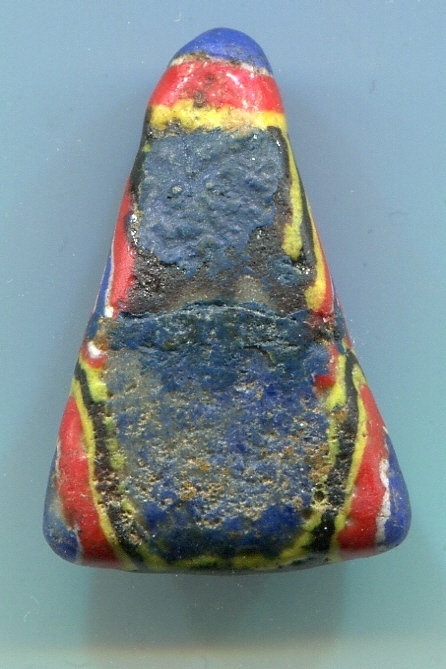 His bead is NOT "Islamic", but a super rare powderglass specimen. One I have never seen before - neither in design nor colors. A fantastic piece in the right context and that, the context, is the main point here. Actually you, Nishedha, should consider to sell the piece to TASART or me, because both of us have extensive "Kiffa" collections. For you - unless you too are an avid collector of Mauritanian powderglass beads - the bead is of lesser value in my opinion, though you might not like to hear that. If the piece is just "another bead" for you, is what I mean. A piece without a personal story - just one of many beads without a family, so to speak. 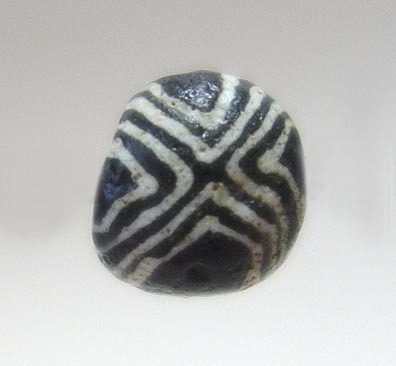 Your bead, Nishedha, is most probably a Mauritanian powderglass bead belonging to the "Kiffa family" - though it is one of their truely distant-distant relatives! Where and when did you find it? "Stunning Dunning (and the half strand)"
Another photo I copied and re-posted for the benefit - I hope - of the original poster and owner of the beads and maybe others interested in this outstanding beads from the Sahel zone! The photo was posted over a year ago, that's why I cannot be sure the question is still relevant. For sale as a whole or per piece, the poster asked! If keeping them is not an option, I would like to know that the price-idea for the complete (half) strand was or still is. From what I "learnt" from Ebay, I tend to say that selling "single" is more of a promising chance to turn them into cash. Still - my experience as seller is enough to count as best advice possible! If the beads are still available and the price were "beyond decent", I might be interest to be their next owner. Since it is more likely that they are already sold, I would very much like to know what you finally did with them and how much money you got - if this is not an intimate question to ask - for them where? The beads itself are OK. Better than most strands, mainly because I see only one chipped piece, but not really outstanding(-ly rare), regarding their designs. Still a nice strand - no doubt! 30 + YEARS OF COLLECTING AND STILL SOME SURPRIZES!! KIFFA!! Like many of you that have been collecting for years, i have poured over pictures of thousands of beads! 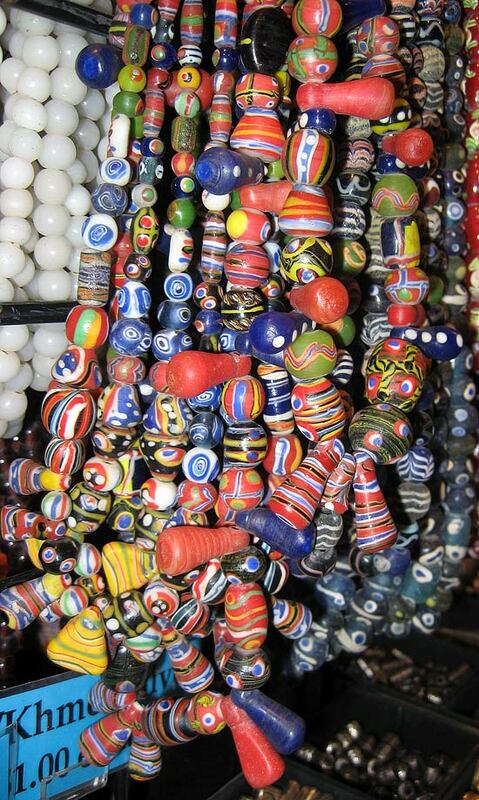 Having lived in Africa and friend to many bead dealers, i have handled and seen many beads! But, because, i am opening boxes of beads that have been in storage for years, i am discovering surprizes that i did know that i owned! A few days ago, i opened a box of Kiffas and this unusual, uncommon, rare kiffa was found! 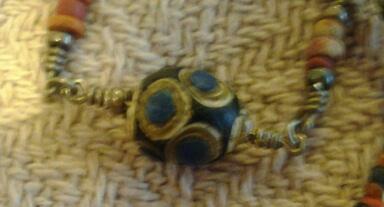 It was made to immitate an islamic bead and it even looks like the maker tried to make crude faces on it! It is a beaute! Our resident Kiffa king owns several and it would be great if, he could show them!I am thrilled to own at least one! Please show some of your bead SURPIZES! Thank you! More pictures in next post! Re: 30 + YEARS OF COLLECTING AND STILL SOME SURPRIZES!! KIFFA!! Re: 30 + YEARS OF COLLECTING AND STILL SOME SURPRIZES!! KIFFA!! -- adjichristine Post Reply Edit Forum Where am I? More pictures of my Kiffa surprize! Re: Re: 30 + YEARS OF COLLECTING AND STILL SOME SURPRIZES!! KIFFA!! -- adjichristine Post Reply Edit Forum Where am I? Pictured, your bead (2 views, center blurry beads) is a copy of the bead pictured in the 2 outside shots....I emailed you variations of the same types in many color varieties, unfortunately my schedule doesn't allow me to hunt for the exact bead you show......as far as a face design, I think that is dirt but it is too difficult to tell as your pictures are all out of focus, nice find though! Re: always surpriSed -- TASART Post Reply Edit Forum Where am I? Re: Re: comparisons -- Adjichristine Post Reply Edit Forum Where am I? 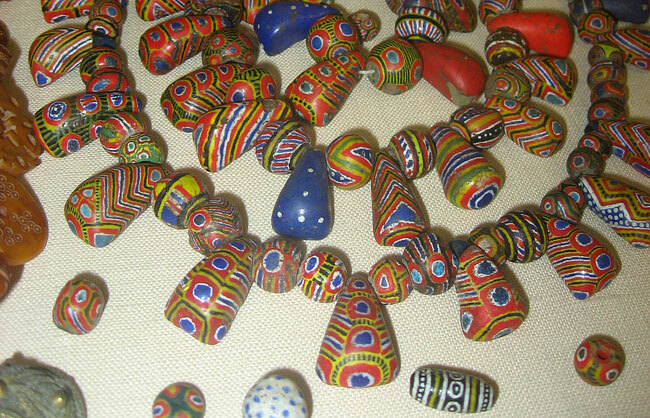 A good and clear photo of the area that you believe to be faces would be nice, if they are actually faces then you would certainly have an extremely rare bead, I have personally examined over 10,000 Kiffa beads and have never seen one with an intentional face.....seriously awaiting a good photograph that can show what you think you see!!! Re: clear photo needed -- TASART Post Reply Edit Forum Where am I? Re: Re: 30 + YEARS OF COLLECTING AND STILL SOME SURPRIZES!! KIFFA!! Re: Re: 30 + YEARS OF COLLECTING AND STILL SOME SURPRIZES!! KIFFA!! -- cod Post Reply Edit Forum Where am I? Re: Re: Re: 30 + YEARS OF COLLECTING AND STILL SOME SURPRIZES!! KIFFA!! -- TASART Post Reply Edit Forum Where am I? 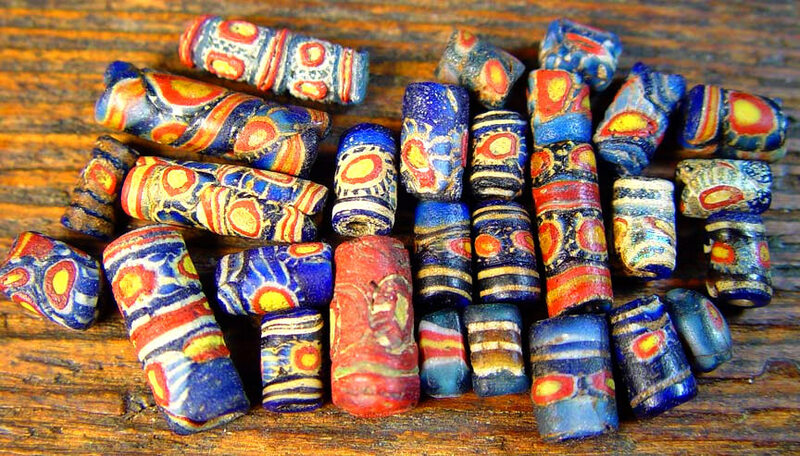 The photo TASART posted - copied from his post and reused by me to support my argument - belongs to the same family of so-called "EARLY ISLAMIC BEADS" than yours, Adjichristine! 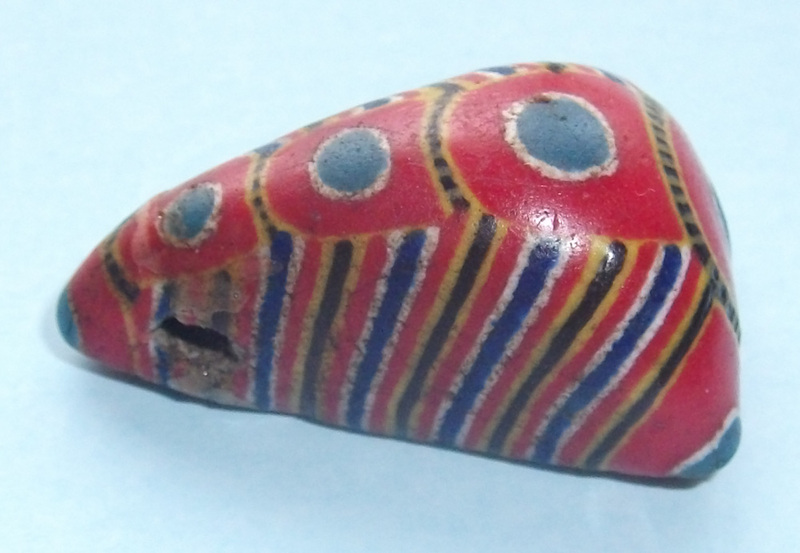 Though Mauritanian beadmakers copied many "Islamic" designs, this was not the case with your bead. Another thing is noteworthy, though. Have another look at the two photos Adjichristine had posted. It is a weird bead indeed and though the quality and sharpness of both photos make is somewhat tricky to issue an ultimate statement, I believe I figured out, what's WRONG (!) with AC's bead. 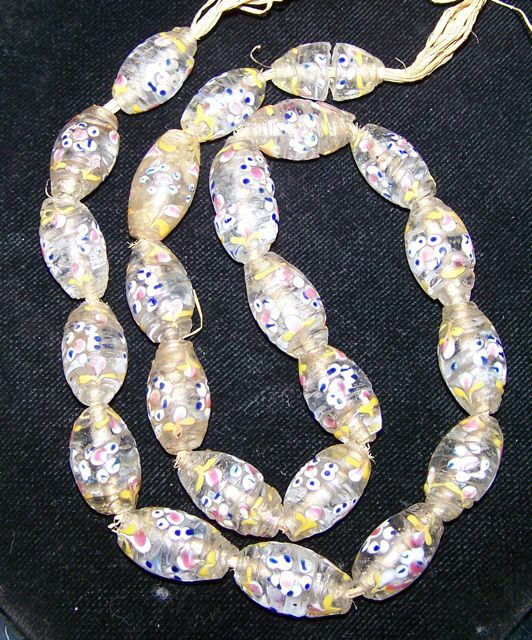 Again - I have not a shred of a doubt the bead is "Islamic", not Mauritanian powderglass. The cane visible when looking inside the aperture is proof of that. 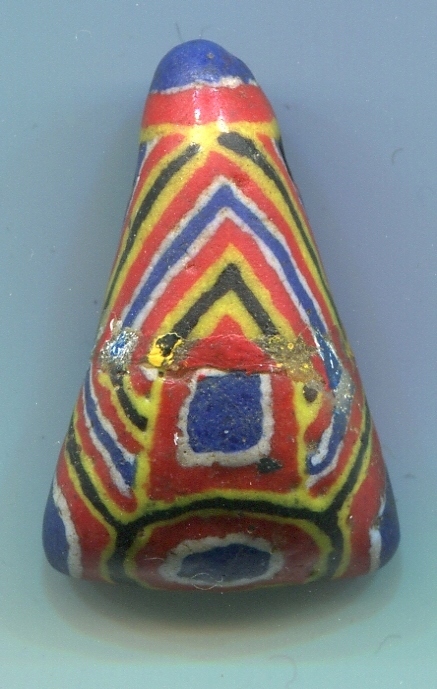 It were not only technically impossible, but also completely sense-, and useless for "Kiffa Beadmakers" to copy, to "paint" (with glass) a cane into the beadhole. But what about the white stripes at the top of the bead? They should be part of a black'n'white composite cane, were the bead an authentic "Islamic" specimen. Yet this white stripes appear to be faked. 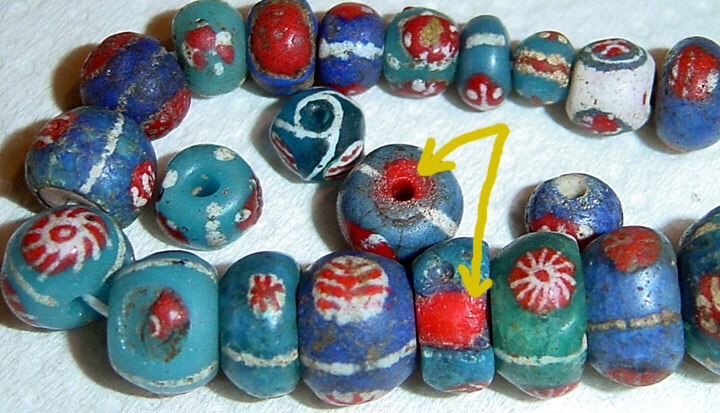 They appear to be painted (with color - not glass) onto the bead, obviously to make it look more authentic, or, what I believe more, to turn it into a "Muraqat". 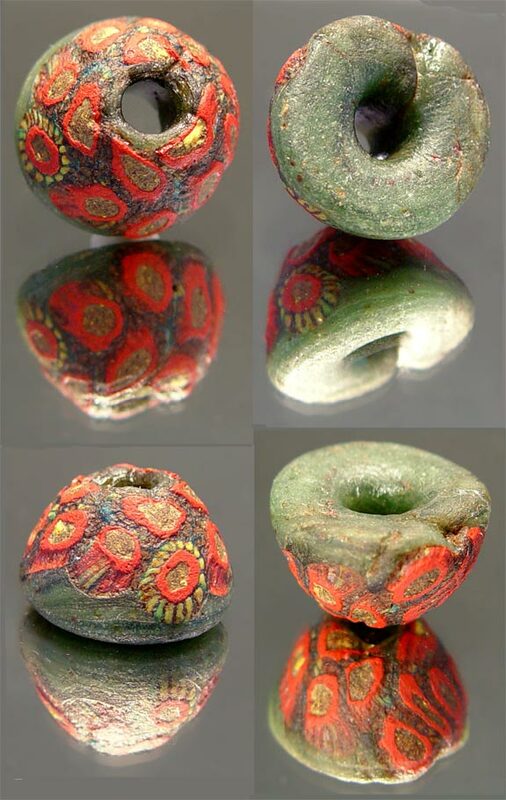 - The bead came into existance as an Islamic product, something being made 1000-1300 years ago in MIddle East, possibly Syria. 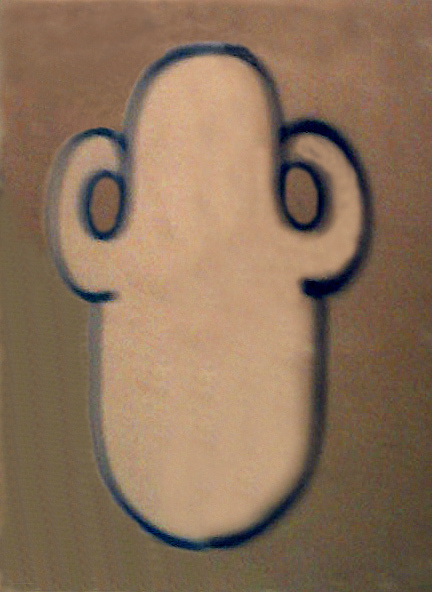 It's whole appearance, the general lack of various kiffa-typical features and the cane visible in the beadhole confirm my assumption. - The white stripes do not belong to a cane (leave alone this beadtype usually shows black and white stripes, as TASART's specimen (and many others of this type) proofs. 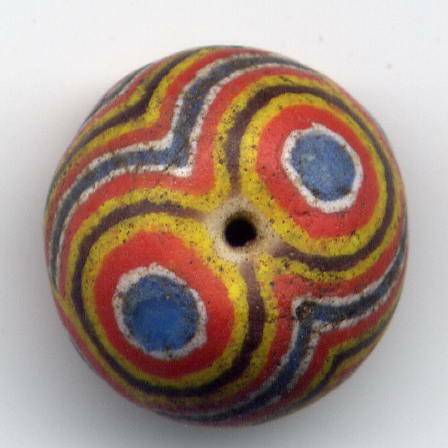 - These white stripes appear to be "painted" onto the surface of the bead. I would bet not with glass, not through a prefabed cane, but some sort of oil-color. Not an unusual observation on "Kiffas" coming out of Mauritania. We have here and Islamic Bead with white stripes that do not belong here. 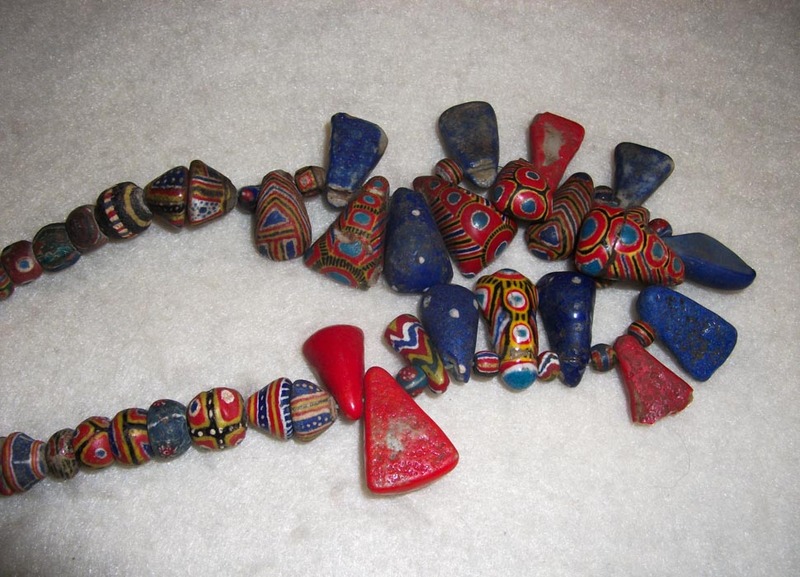 The bead, I assume, has been found in either Mauritania, Mali or the Senegal - the latter two states being close to Mauritania, where "Muraqat" originate from. The bead - as far as the photos to allow me this statement - is a hybrid. 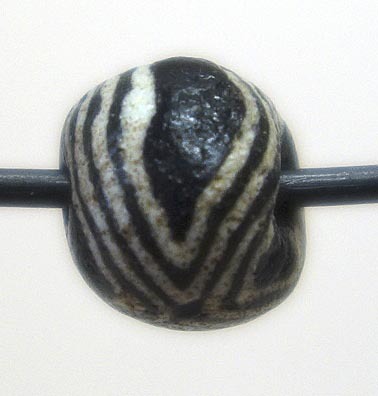 The bead is an authentic "Islamic" specimen with white stripes added to give it more credibility. Either as "Islamic bead" or as "Muraqat" aka "Kiffa Bead. I had to be proven wrong with hard facts to believe otherwise. 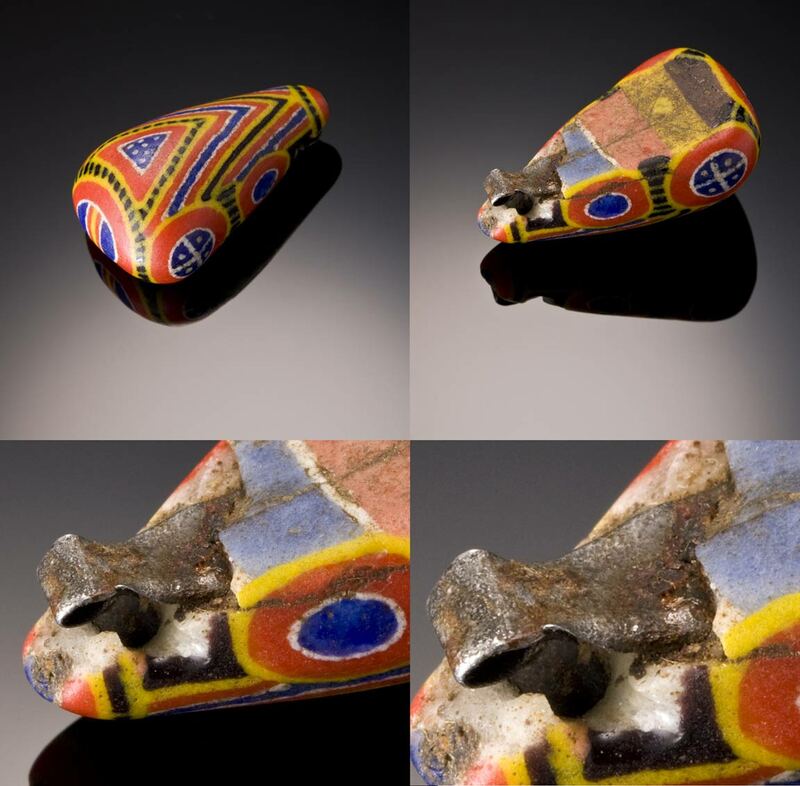 ...the blue Kiffa could almost be mistaken for a piece of lapis were it not for the white dots. Those awesome carved phenolic beads...some information...thank you, Sarah! "I have some history on these mysterious beads! Made by one nomadic family in Mauritania called Lmalem . 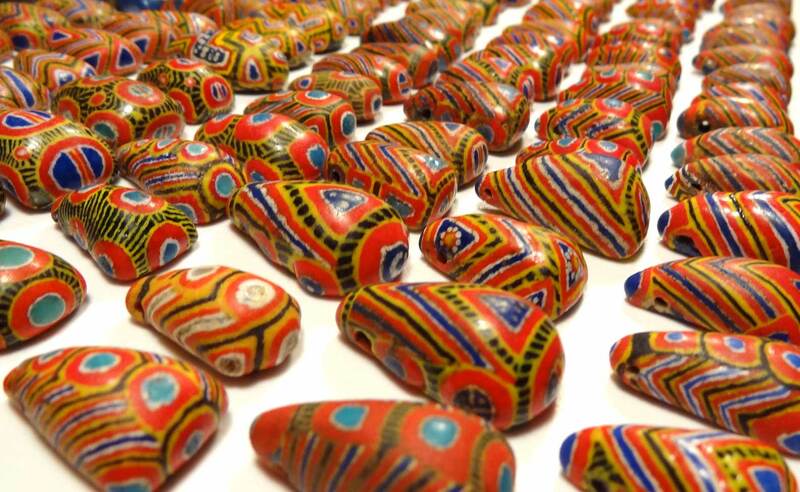 They travelled between Boutelamin, Kiffa and Nouakchott making these carved beads for the weddings of high status B'than Maure families. The family would supply the beads and have them carved. 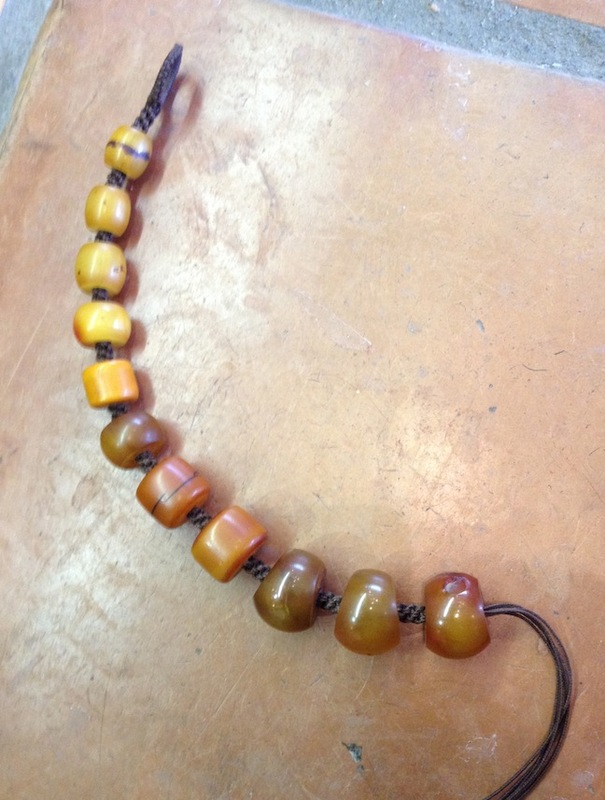 Originally done with Amber beads, but those would break, so since 1940 only French Amber ( Bakelite) was used. Name in Mauritania is Muhafen Luban. Meaning improved Amber. (source of the information is a Mauritanian friend from the region)"
and her image copied below. 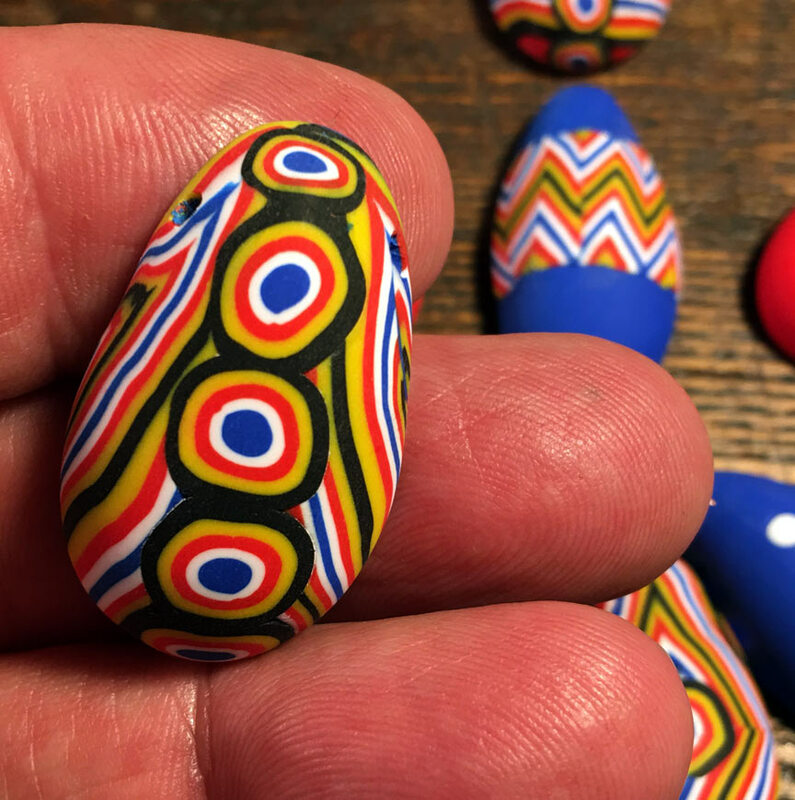 if I ever get to write about Kiffa beads, his creations will be listed among them! The heartfelt note that accompanied his creations really warmed the soul! Thank you again Cody!!! 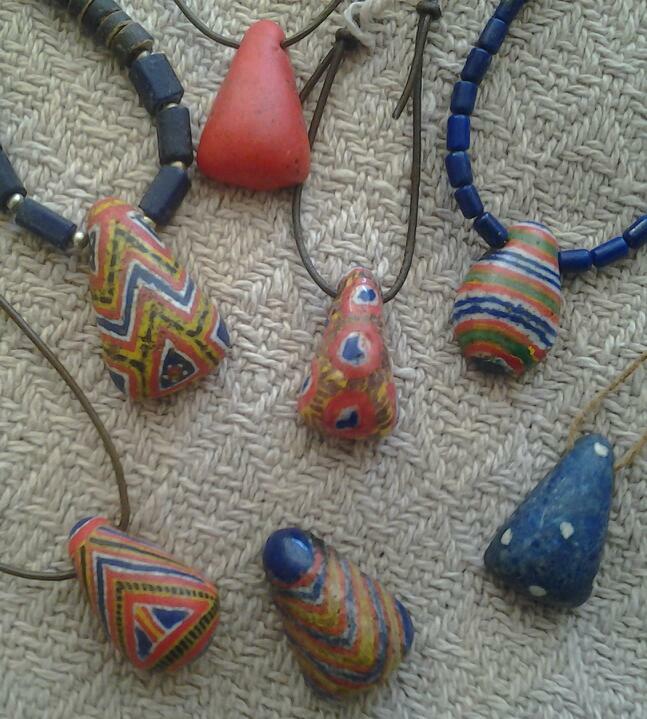 Just wondering about newer African made Kiffa beads. When did they start to hit the market and are these older new Kiffa? New to the forum but looking to collect beads can someone help me identfy these?? 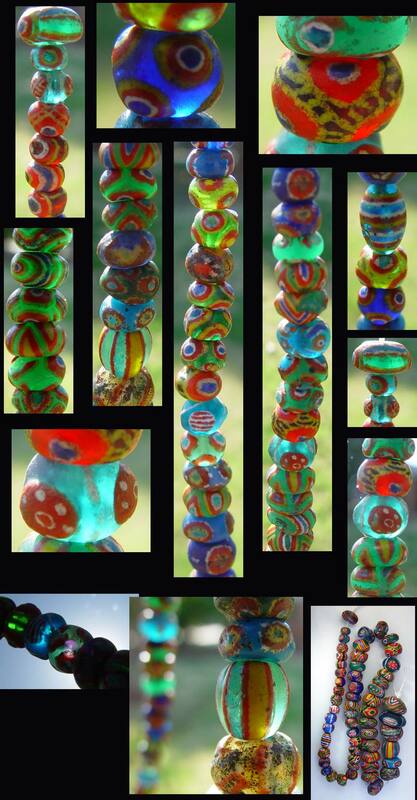 Just been browsing ebay and found some of the largest beads I have ever seen!!! I've attached a link below but the seller appears to have many. Just want to know there origins and what they might be worth so I don't bid too much. They look really nice and I've got a use for them but just wanted a second opinion. Re: New to the forum but looking to collect beads can someone help me identfy these?? -- calumw789 Post Reply Edit Forum Where am I? 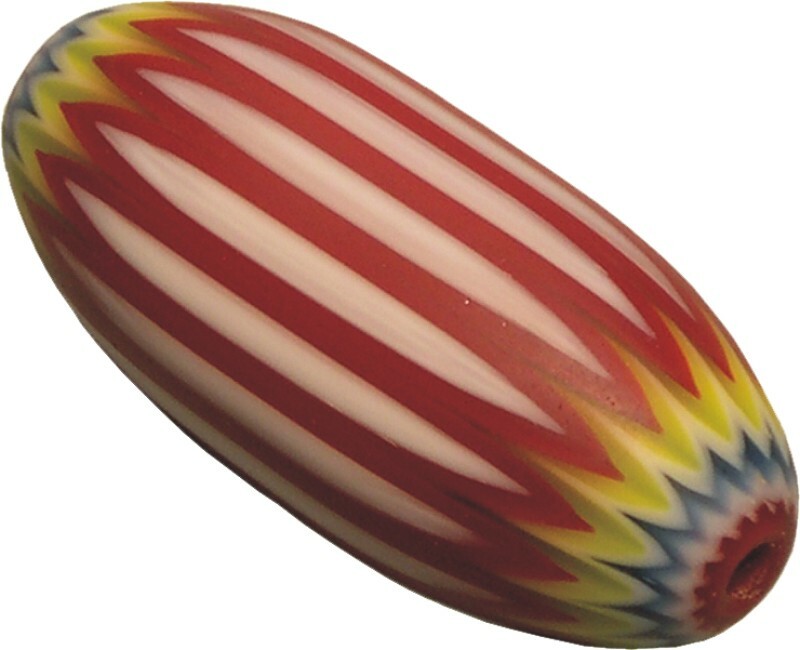 I've been doing an investigation on old phenolic resin (Bakelite) beads and I'm also interested in amber-imitations made from other plastics. I'm a retired polymer scientist as it turns out. I reviewed all the huge beads being offered by this seller. My opinion is that these are recently made by melting together scrap plastic, mostly amber colored, of some sort. 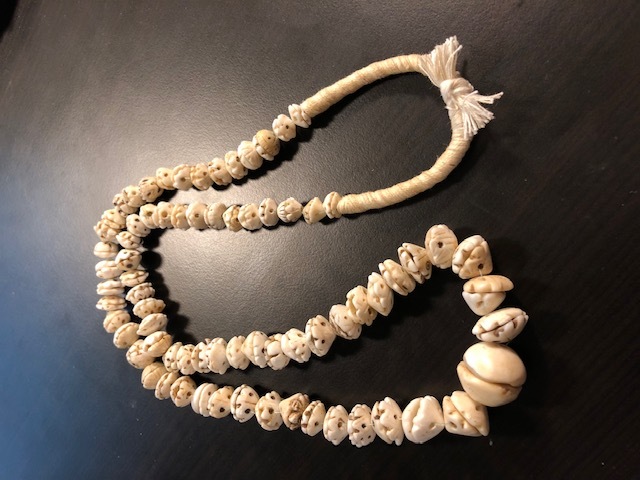 My reasons for thinking this are as follows: Many of the beads appear to contain large inclusions with sharp edges, that look suspiciously like chunks of unmelted plastic stock. If you look at the holes - on most of them, the holes look like one or two irregular sticks or rods were used to create a hole while the material was being melted. Then, the "flash" or excess material around the hole was ground off. One of the beads has a very ugly metal (probably aluminum) strap embedded into the side to mimic the repairs sometime seen on old amber beads. Strand of amber-colored beads with these crude metal strap "repairs" have recently been on eBay and advertised as "old". See for example eBay 261924341949. 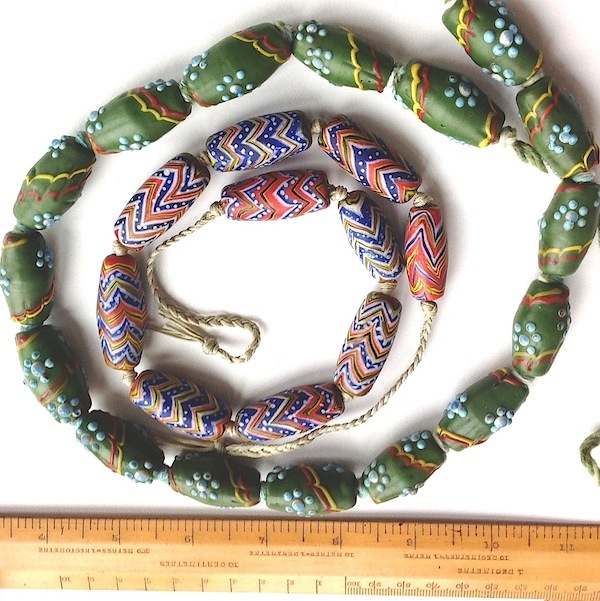 The real joke about this particular auction is that the beads are said to be 19th century - impossible since the beads are clearly plastic and Bakelite was not commercialized until 1910, and these beads are not even phenolic resin but something newer. I think they started appearing in the last 2-5 years, so VERY new! 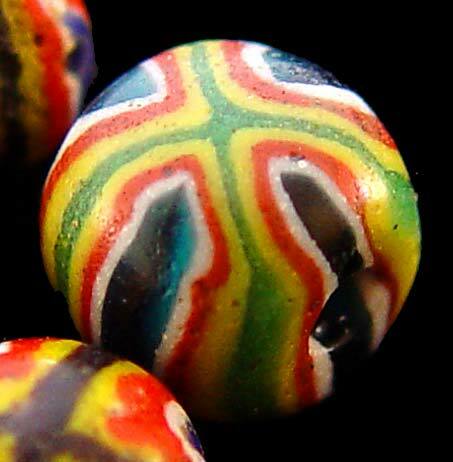 All this being said, I would love to have one of these beads so I can have the plastic identified. I recently had an "amber substitute" bead analyzed by a commercial lab and it was high impact polystyrene (also known as HIPS). However the minimum price + shipping to the US is 26 pounds for one of the beads, a steep price to pay for my curiosity. 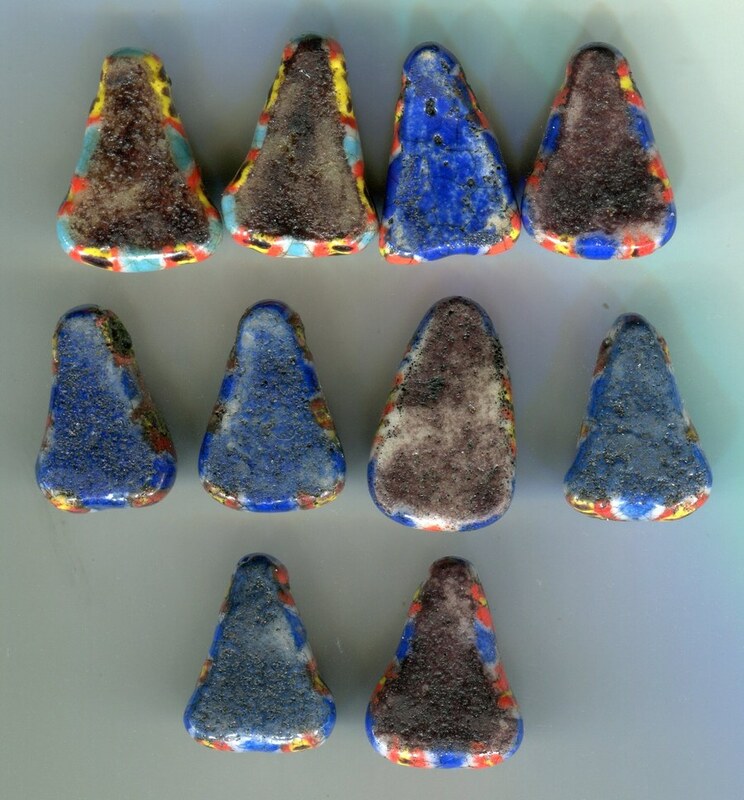 If you end up buying one of these beads and could spare a very small sliver from inside or near the hole - I will get the material analyzed. 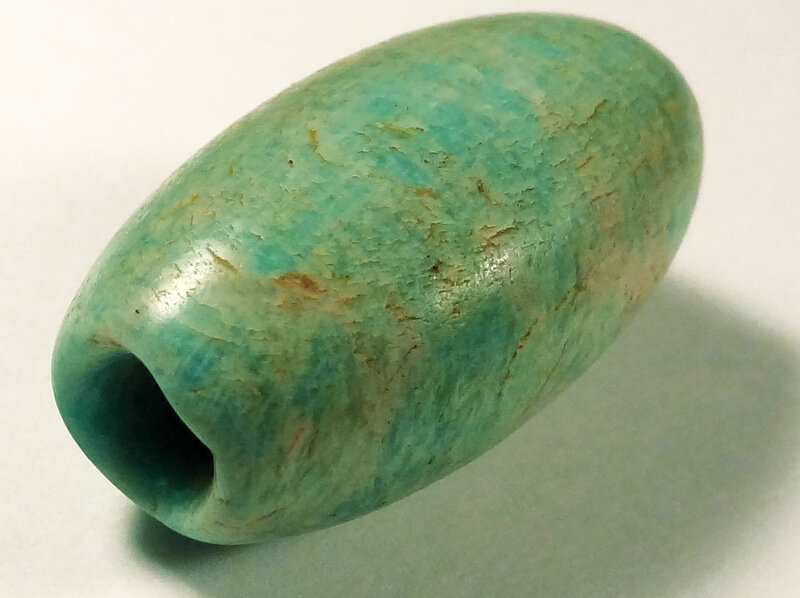 If you purchase one for a project - enjoy the bead for the color and design and NOT for any collectible or historical value. Re: Newly made from some kind of thermoplastic resin -- Rosanna Post Reply Edit Forum Where am I? Don't these beads look like they may be real amber? 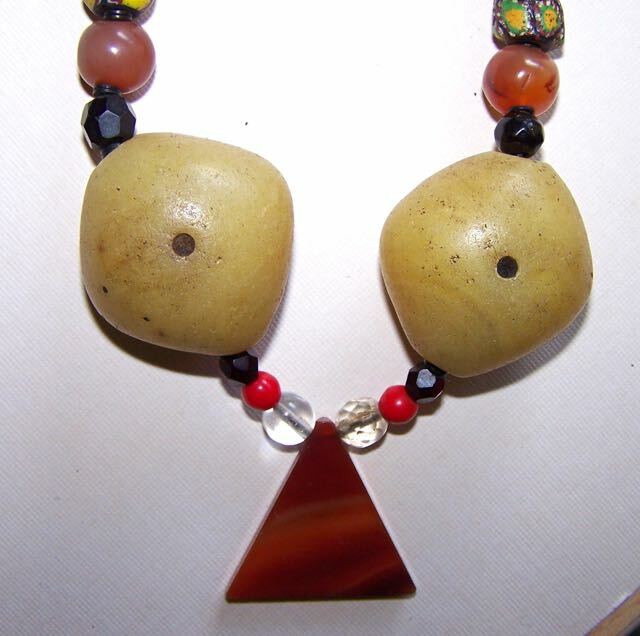 I purchased this necklace, which is made in a traditional Mauritanian style, to check out the large "amber" beads. 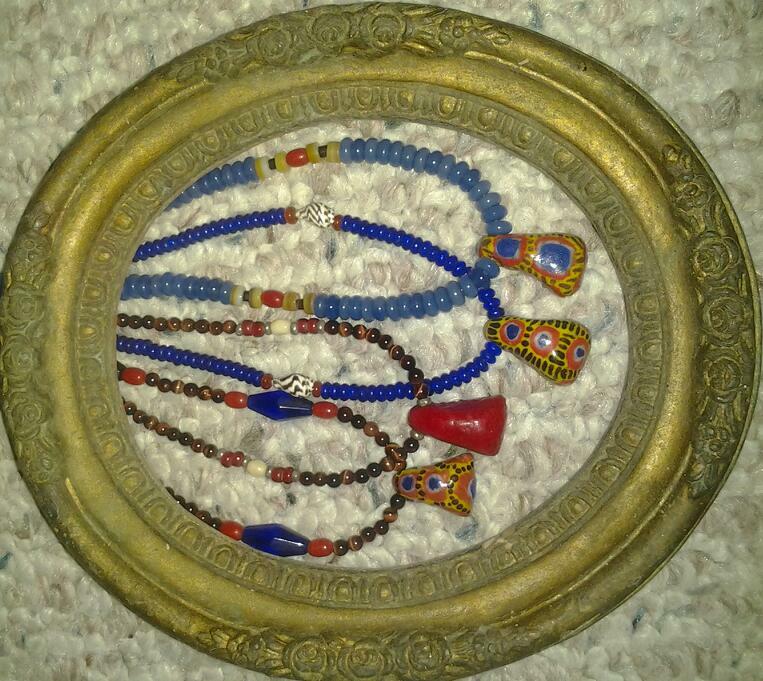 The rest of the beads are antique Czech, Venetian, carnelian, and include a nice Kiffa. 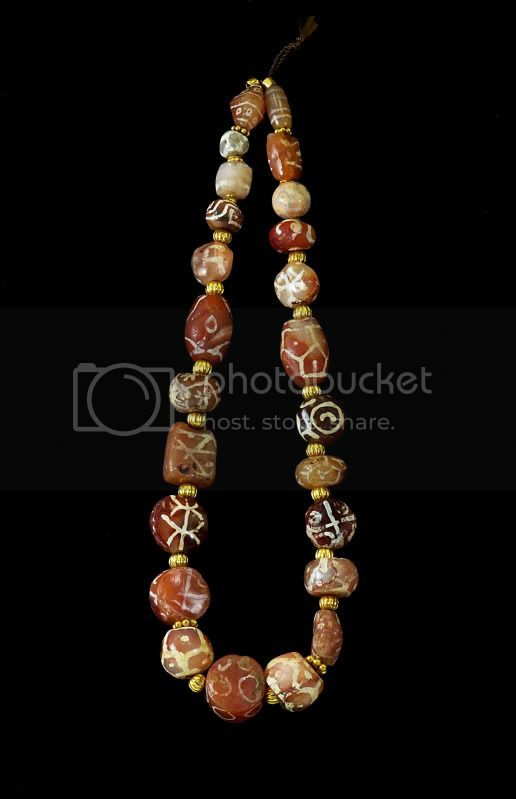 The seller, to her credit, did not make any claims about the "amber" beads, and the price for the necklace was modest. I sent one of the light yellow beads to a plastics lab for analysis and it tested as high impact polystyrene by FTIR. A hot needle test gave a distinct styrene odor, and the material was tacky when touched with acetone (my tests). 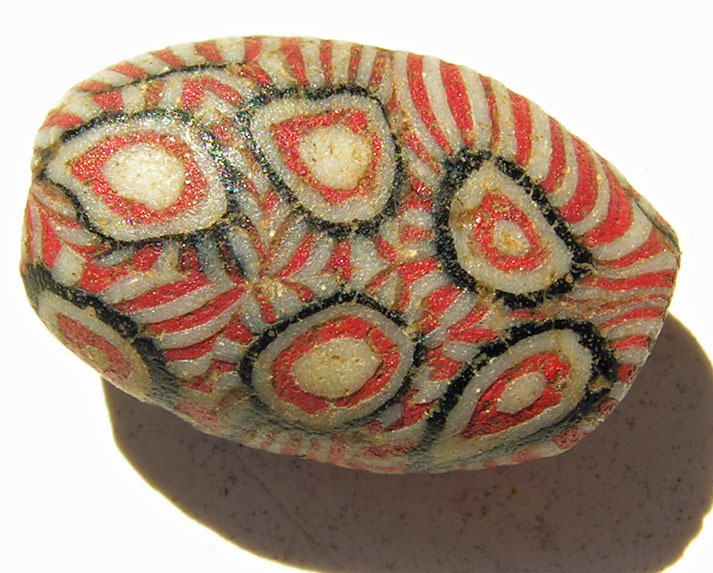 I would like to know when this material entered the West African bead trade - if anyone has an idea about this, I'd love to hear from you! I'm guessing post - WWII for sure, maybe around the 1980's. 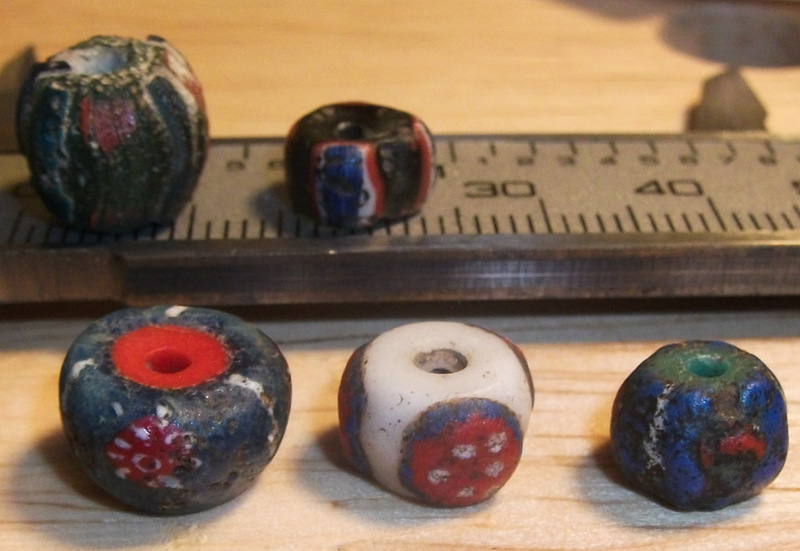 These beads appear to have some age on them, so I don't think they are really recent. Is hoarding beads an illness? Re: Is hoarding beads an illness? -- Frederick II Post Reply Edit Forum Where am I? 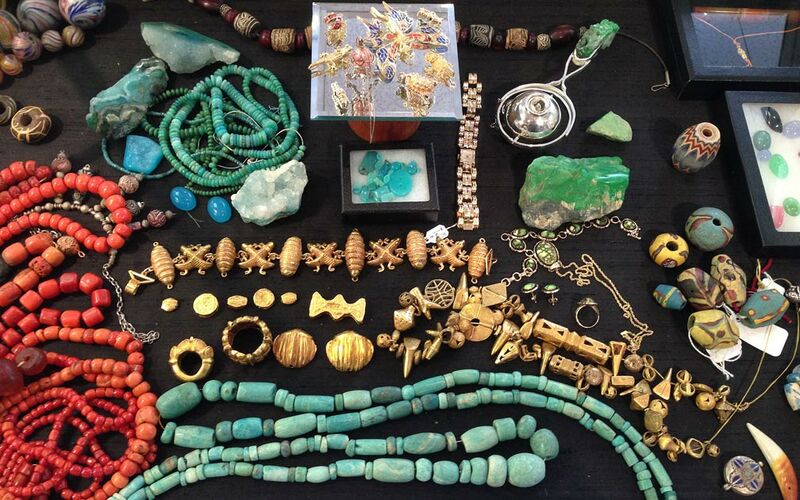 Historically, a hoard has been a concealed treasure. And etymologically, the word "hoard" is closely connected with the verb "to hide." Actually, I think there is something sick about accumulating wealth or beauty in order to hide it away. But collectors, generally, want to show their things to friends, to rivals, and where possible to the public. In the past, we could only show them to a relatively small group, but now, with the internet, our collections can be seen around the world. That's what's wonderful about this forum, with all of the work that Joyce and David have put into it, and all the other sites that are similar though seldom as good; they are places for sharing, not just the objects themselves but information and discussions about them. I think in fact that collecting groups like this are frequently the best places for interesting and beautiful objects to be displayed, even though collectors have come under so many attacks in recent years from the cultural property purists. In my experience the really unjustifiable hoards are in museum vaults and the storerooms of archaeology departments where a good 95% of the material will never be made public. 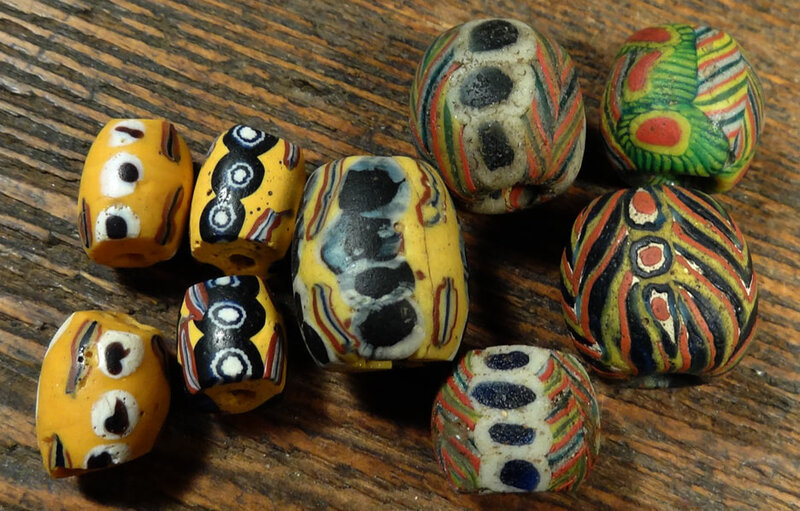 On a personal note, I’ve sometimes said that I don’t collect beads, I try to study them as an important element in the research I do into early patterns of trade in Asia. That’s why I came to this forum - to find out more about a group of Asian artefacts I knew almost nothing about. But as a result of hanging out here and learning so much from so many of you, I’ve come to appreciate beads in and for themselves - as a… collector. 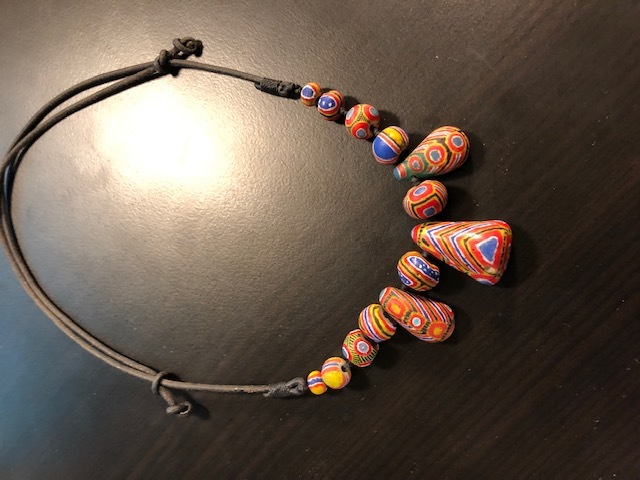 Without this experience, I wouldn’t have known about Thomas/TASART’s amazing collection of kiffas; I wouldn’t have bought my first kiffa from him; I wouldn’t have ended up with enough to make a necklace that I will never wear but will use constantly as an example of the genius of the women who made them. Imagine my gasp of surprise, finding these in an old cardboard box at the bottom of a wicker basket full of antique seed beads. They're from about 20 years ago, when Duangporn Dunning and I split a strand of Kiffas. So, definitely originals, not recent or copies. But do people still want these? They don't seem to be selling particularly well on eBay. So, asking a favor: would those in the know mind advising me (by private email if you don't want to post to the list) whether I should put the whole lot up as a group, or go through the trouble of selling each bead separately? I'm organizing my bead cabinet and some things just don't fit into a category or are "orphans," odds and ends - no matches for them. I found these various beads tucked into corners of boxes and bins, they've joined my family of beads somewhere along their journey and there are some mysteries here. Right now I'm placing them in the category called orphans, odds and ends. I vaguely remember picking up the kiffa bead out of a box of random beads at a mountain man rendezvous one year - an displaced orphan even then, far from home, waiting for adoption. 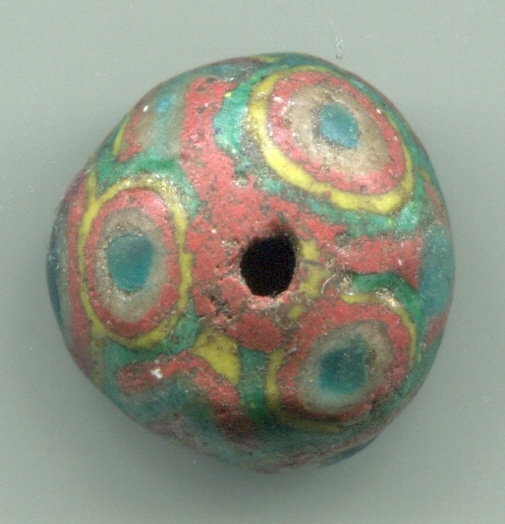 This Bead was found at excavation the Byzantine period 5-8 century of our era. 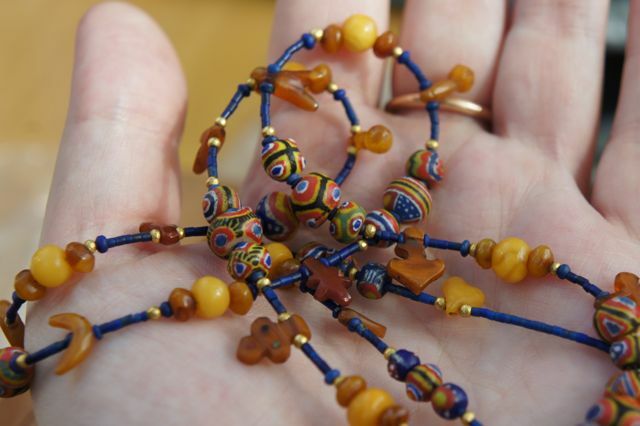 these were all on one string, bought from one of the dealers in African beads who assured me they were "Tibetan". i am thrilled to have these 10 handsome Indonesian-made lampworked Kiffa-inspired beads, as well as the 16 indonesian green florals! 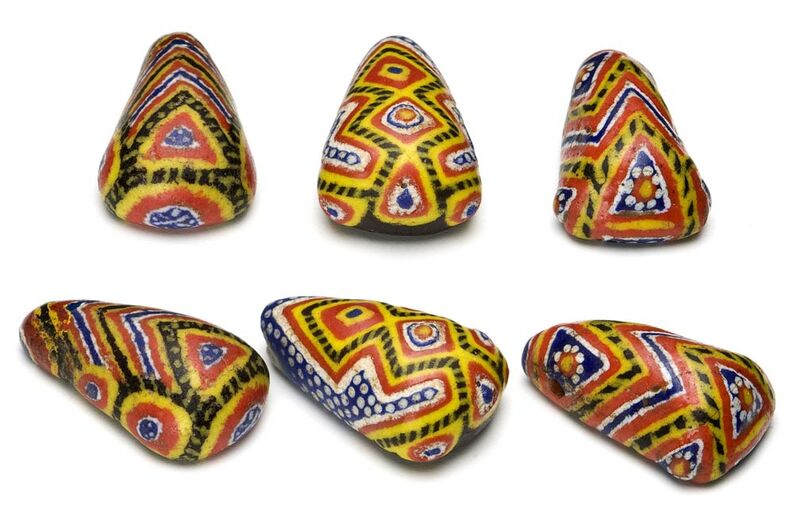 These and similar ones have been popping up all over ebay lately as old Islamic beads. I have a few questions about them. What country are they being produced in? 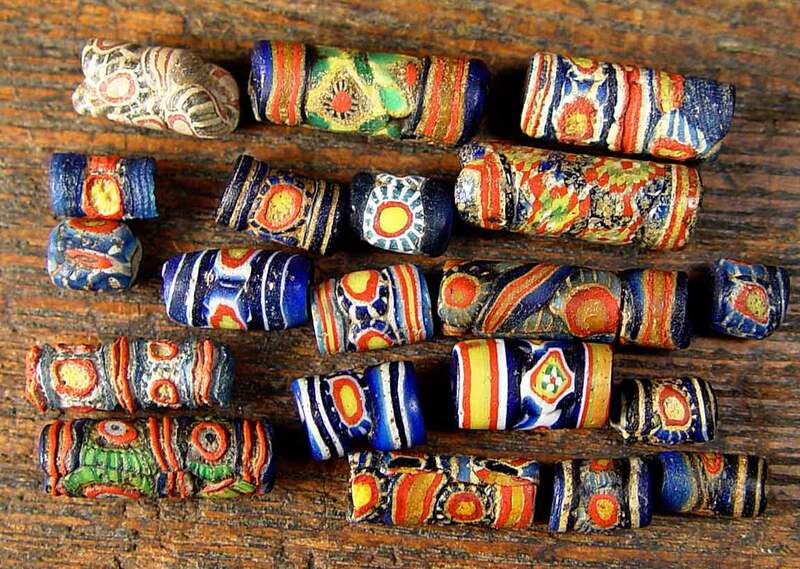 Are they fantasy beads or are they based on old bead types and if so anyone have a picture of an old one. 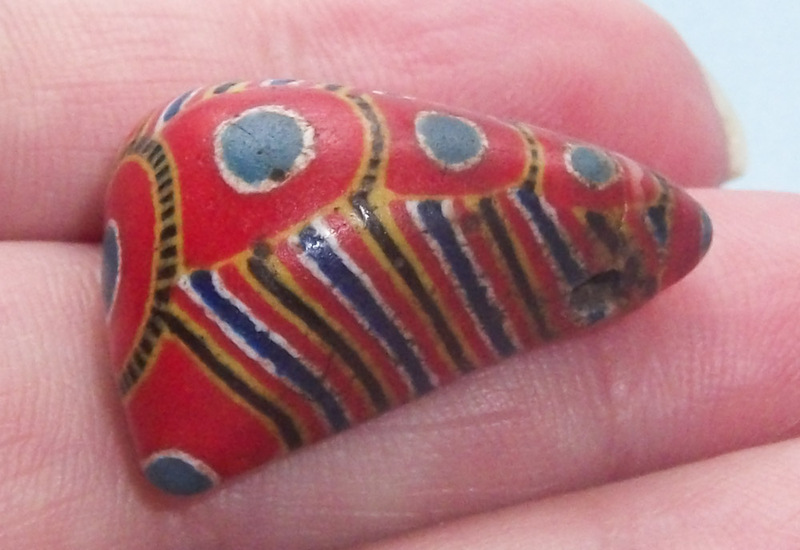 Re: Bead question new sold as old Islamic -- beadweyr Post Reply Edit Forum Where am I? Jim, Jean Picard told me these are Czech lamp work. They come in other colors, red body, white, and others. That's all I know. Re: Jim Johnsons yellow beads -- Joan Post Reply Edit Forum Where am I? 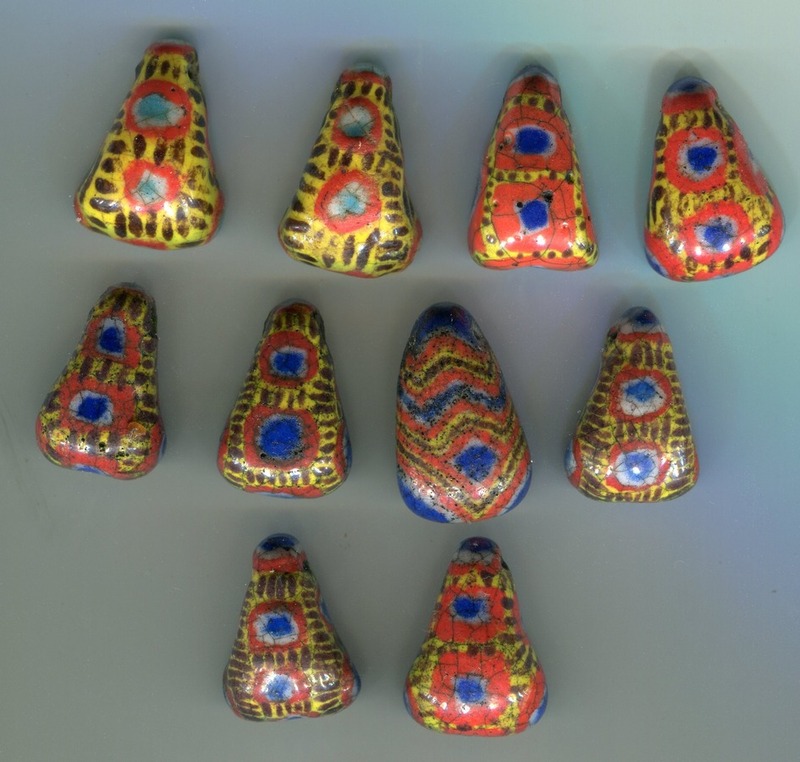 These are the most specific colors and designs of the Czech beads. Re: Re: Jim Johnsons yellow beads -- hans0621 Post Reply Edit Forum Where am I? The one on the end looks like someone was trying to make a Prosser-type molded bead look like a Kiffa, or something?...maybe Floor has seen these before? Re: Pretty sure these are Czech with one painted Prosser -- Rosanna Post Reply Edit Forum Where am I? I am sure Thomas can tell you more, but here are some interesting examples from Stefany's collection that I was able to photograph. First picture shows, like yours, Prosser beads being used as a base for the kiffa decoration. 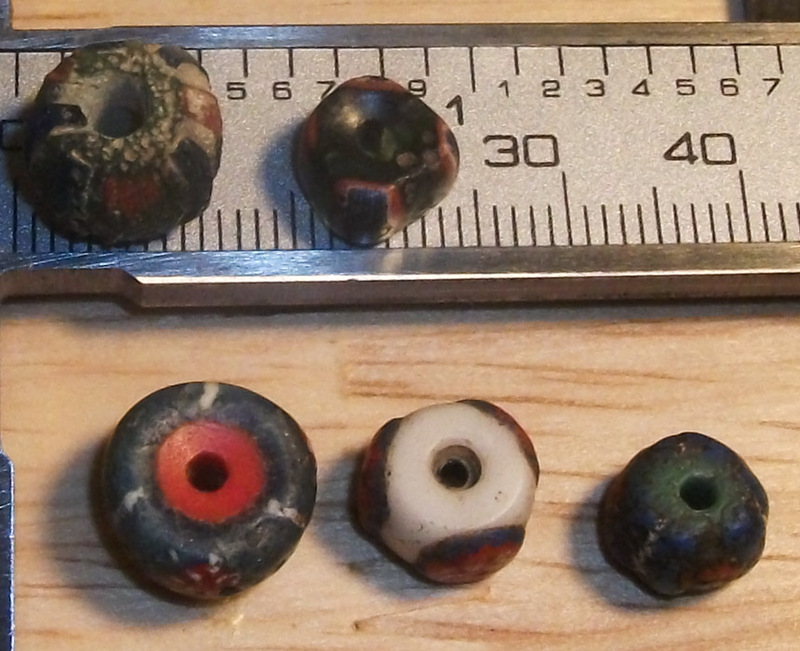 Second picture shows Prosser beads that have been cut. 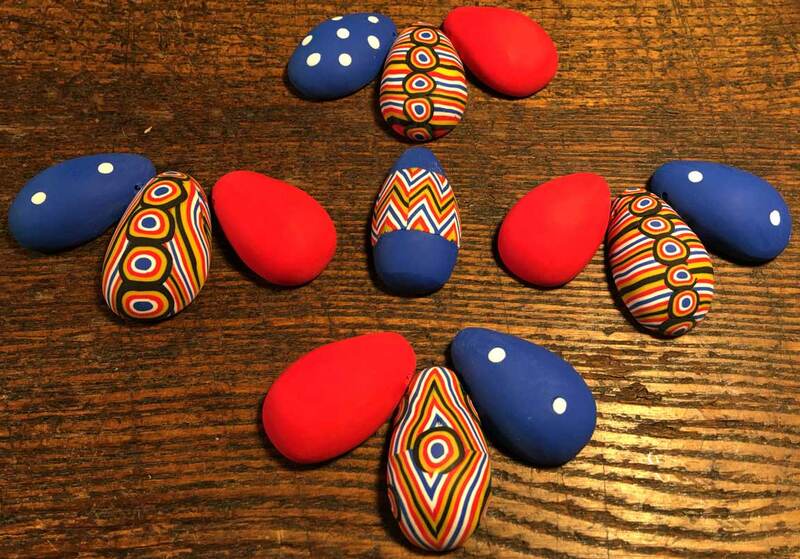 Perhaps so that they are ready for being decorated to be a Kiffa bead. I have never seen too many kiffa beads, so I do not know how many actually use Prossers as a base bead. Would be interesting to find out. Re: clarification needed please -- Rosanna Post Reply Edit Forum Where am I? Re: let's try to clarify -- TASART Post Reply Edit Forum Where am I? We had a great bead-filled day at the Duif, and at our lunch. Great weather, great beads, great company. Some pictures to keep those too far away to join us happy. 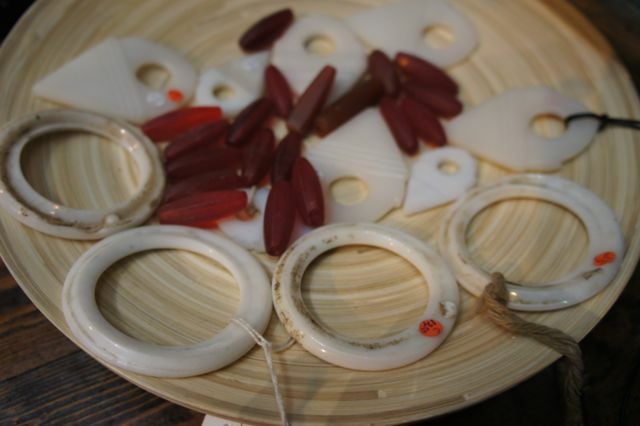 First picture shows white Prosser rings, made to resemble shell rings worn by Mali women as part of jewelry, Prosser talhakimts and some Czech glass beads. Re: Dutch meet up at the Duif -- floorkasp Post Reply Edit Forum Where am I? Re: Kiffa -- floorkasp Post Reply Edit Forum Where am I? Yesterday I was also impressed when I saw these beautiful Kiffa's and amber when we had our lunch and I took this picture. Gorgeous Karin! 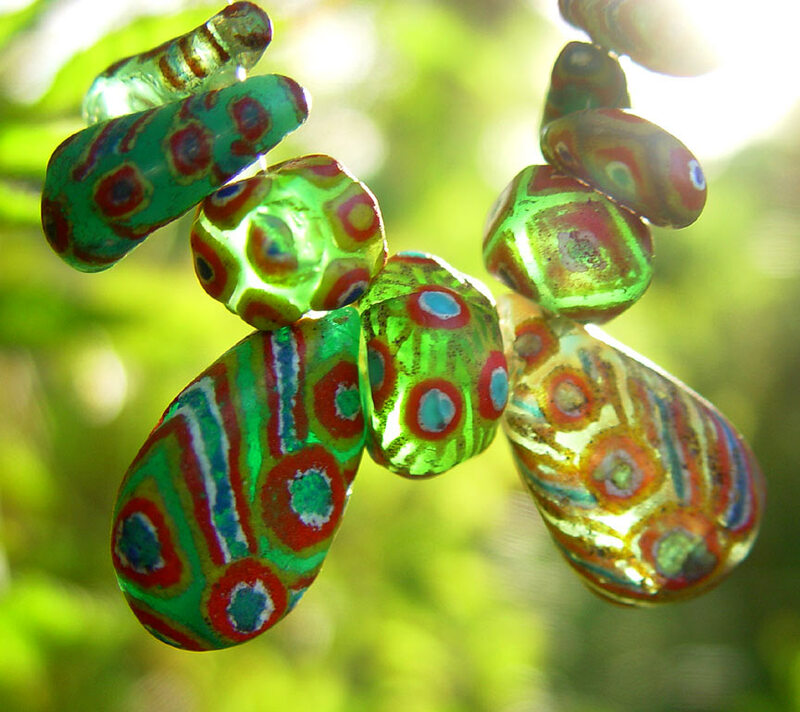 I have enjoyed our Bead Collector Forum since joining, some seven years ago ish (I know... I'm a baby). Lately I have noted a reoccurring thread during conversations with several posters both public, and private (myself included). That commonality being the stifling consternation of posting an error, showing ignorance, even the need to edit and re-edit a post. All so very understandable, especially among the many accomplished forumites I respect so. While possibly I could do more listening and less talking!! Actually my learning needs are more met with the myriad of interactions. There are also soooo many times when I realize I printed an error for everyone to see!! Ahhhhh... Ooopsies. It is hard not to misspeak, or make an error, especially with my lazy typing. Regrettably, I usually try to fit a complete thought onto the subject bar, and often simplify my assertion to make it fit. Alternately, I don't want to invariably start a sentence with the oft needed qualifiers: "From a photo", Without provenance", or "IMHO" etc... I actually hope the qualifiers are inherently understood, as we all have the same cyber limitations. A spoken conversation is so fluid, you can modify a statement so easily, while a written statement feels like such a treatise. Or sometimes I just blow it! Honestly (not pertaining to Will) most of us cannot type as fast, or as accurate as our minds stream. I very earnestly feel that most of the time when I leave out data, inadvertently slight, feel slighted, or that my knowledge is faulty, it stems from either miscommunication, laziness, or bad typing.s... Minus a shunned disruptor here or there we are all here to learn, share, express our understanding and love of beads!! No accusations, no personal direction, I just miss some of you! 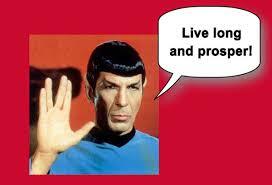 The point is, I want to encourage all our friends here at the BCN to post more, lurk less! Thank you everyone for posting, and a thank you to David, and Joyce too. The end. Re: Friendly discourse...modified... -- jake Post Reply Edit Forum Where am I? It's unfortunate if many fear harsh judgement from others enough to keep them from posting. While it's good to be on top of grammar, I'd rather someone get their posts up without worrying too much about each point being perfectly made......there's a lot to be said for spontaneity and compassion too! And we must remember that English, while it's "our" language here in the U.S., may be someone else's second, third, or fourth language. Jake, you bring up so many valid points! I remember telling you in Tucson at Marisco's.........Life's a river! There are more beads to see and talk about in the very next day, the very next moment! I feel like I must grasp at the wisdom rolling past me the best I can, but there is ever more to come! And this forum keeps it all for me to reference later. I can't say how much fun I have when I search material from the past and get side-tracked with other "stuff" I hadn't thought about in some time. And Mel, what fun it is to see the cool beads you're finding and learning about, from chevrons to Ban Chang to Kiffa and now Ojime....congrats, and thanks to everyone for the tips and pointers. I doubt that I am the only person who finds day to day life getting more demanding all the time. I feel my "straight" job is eating me alive......beads, and this forum, are sometimes the only true pleasure there is in a work day. And I am thankful to you all. 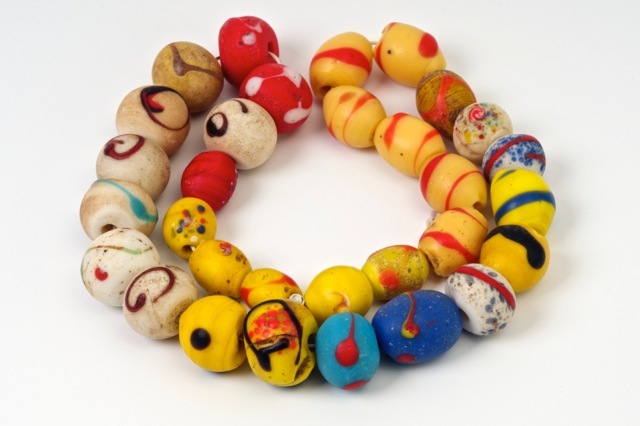 Some people may define themselves as researchers, historians, collectors...some have many decades in this passion for beads, some are newcomers. All are welcome here. I love this bead community, and I love it when people find their place in it. For now, I must carry on with the week ahead in mind, and get some sleep. Maybe I can make more concise posts in a day or two. Thank you, everyone! Re: Ok, I know it's not Kiffa (or is it?) -- Mel H Post Reply Edit Forum Where am I? Re: Some others I could use help with -- Mel H Post Reply Edit Forum Where am I? The ones on the table (Near caliper) look to be Kiffa with European core. They are all beautiful. Re: The ones on the table (Near caliper) look to be Kiffa with European core. They are all beautiful. -- jake Post Reply Edit Forum Where am I? Now off to finish my tea and surf through the archives. in the case of what came first, the chicken or the egg, we will probably never know! 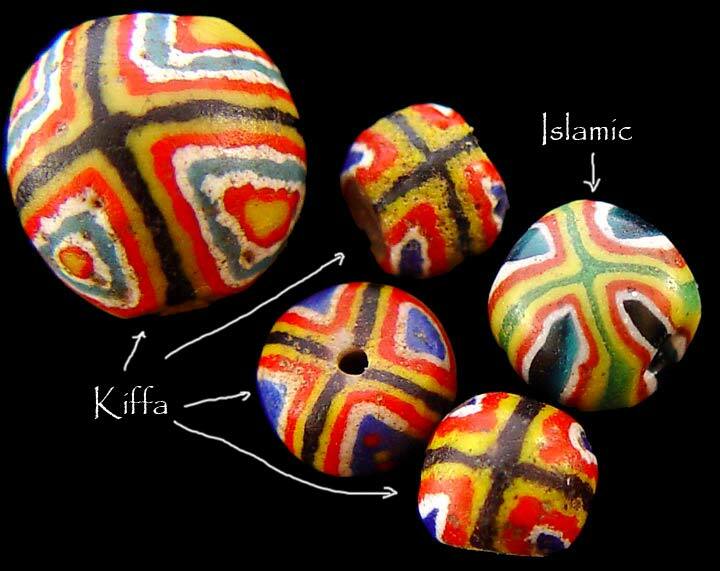 in the case of the Kiffa bead or the Islamic bead we can rest assured that the Islamic beads came first. 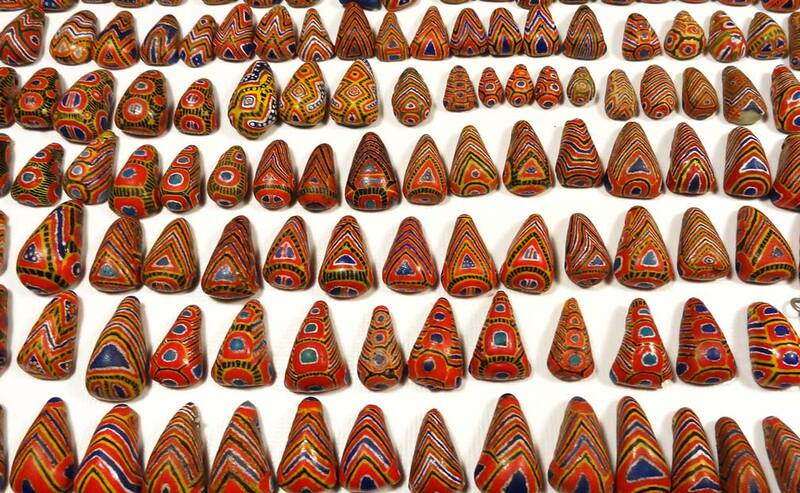 Many Kiffa types copy the Islamic beads in color, pattern, shape and size, I consider the Islamic beads that resemble Kiffa beads pre-courser beads.....here is a shot I did for Ornament magazine with a side by side comparison of the 2 types. 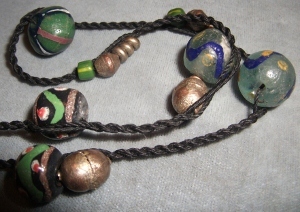 The Powder glass, Kiffa beads are the strand on the left side and the Islamic beads on the right. More to follow, editing pictures is such a chore! Re: Unbroken or really well repaired Kiffa -- Mel H Post Reply Edit Forum Where am I? Re: Tucson 2014, a personal overview.....day 1 -- TASART Post Reply Edit Forum Where am I? Hey everyone, sorry I haven't posted in a while, life has been pretty tough for me the past few months and I have been holed-up waiting for the storm to pass. But, my fortunes have taken a decided up-tick. 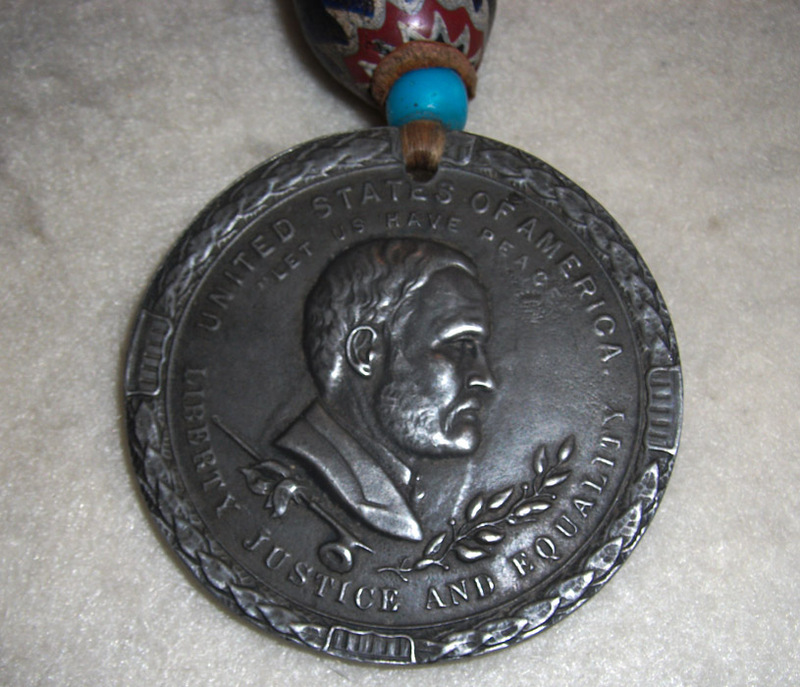 I am attaching some photos of a huge 6-7 layer chevron assemblage with a Peace Medal. I probably need to get a professional appraisal done, what are your thoughts? Re: 6 layer chevron strand w/ Peace Medal - Need appraisal help -- Mel H Post Reply Edit Forum Where am I? Let me know if you guys want any close-up shots. 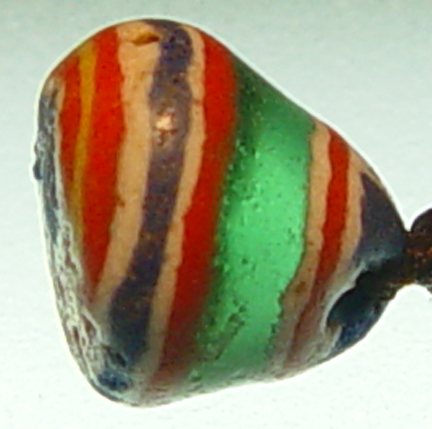 This small (10 mm) glass bead was strung with Islamic banded agate beads. 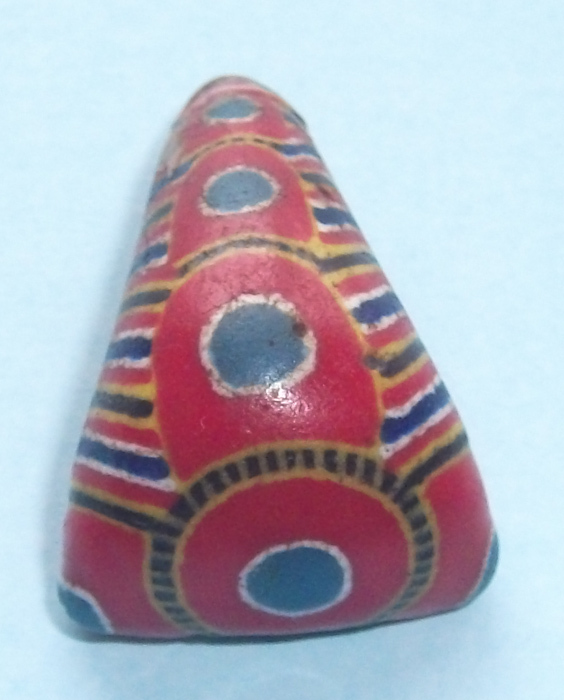 Re: Bead ID please -- nishedha Post Reply Edit Forum Where am I? Re: Oh, I see: both of them are Islamic -- I thought yours was a kiffa (so ignorant). Re: Oh, I see: both of them are Islamic -- I thought yours was a kiffa (so ignorant). -- nishedha Post Reply Edit Forum Where am I? Re: Re: Oh, I see: both of them are Islamic -- I thought yours was a kiffa (so ignorant). -- dannoh40 Post Reply Edit Forum Where am I? Some weeks ago I surfed on Facebook and followed a link to an Italian side, Thomas (TASART) had posted, and found a nice image there, of an African chief, wearing beads...I shared the image and Thomas asked me, if it is from the book “African Kings”, that I didn´t know at this time. I searched the web for the book and offers, and gave feedback to Thomas, but could not decide to buy, because even used ones where expensive, and suddenly Thomas sent a message, that he just bought the book for me from a seller in the US and that he will send it to me, after he got it...Isn´t that great?! Well, this was the second package today, but not only this beautiful book he sent...together with the book came this number from “Ornament”, with the report about Kiffa beads (I always wanted that one! ), a beautiful illustrated magazine from 1971, I had never heard from before and a nice Christmas greeting card...Wow and double WOW, Thomas!! Thank you so much! If I ever can do something likely, let me know! Re: Hi Rosanna~ Yes I cut the red felt…I've been thinking to use a felting needle and combine the sets. -- jake@nomaddesign Post Reply Edit Forum Where am I? If you have some time, I'd love to see a close-up of the beads at the center with the red felt. It is a very attractive design, which I am eager to "steal" if you don't mind! In the meantime, your gorgeous necklace is my new computer wallpaper. Re: Would love to see a close-up -- Rosanna Post Reply Edit Forum Where am I? I am so happy to oblige, of course it is not really my design (N. African). I sure do love all those extra perforations. BTW, on these tassels I am going to remove the shell rondelles, and add a bunch of those Moroccan zebra shells, and several more Kiffa. Do you think it is wasteful to put Kiffa in the back? I also have a couple of really beautiful re-cut (in antiquity) extraordinarily small double diamond phenolics to add to the tassels. As you can see, it would behoove the design to felt needle the two (actually should be three) disks together into one. I would also want to mention, the blue teardrop Kiffa peeking out of one of the tassels has a beautiful red eye on the underside!! In addition I gotta say that, Mauritanian re-ground double diamond phenolics are under appreciated. For those of you who were friends and admirers of Howard Opper and his wife Marie-José, who in recent years have been living in the south of France, with great sorrow, Marie-José has just told me that Howard passed away after a two-year struggle with pancreatic cancer. I was in France just over a year ago, and spent a couple of days with Howard and Marie-José--and we had a lovely time together. I am so grateful for those memories. For those of you who may not know, Howard and Marie-Jo met when he was stationed in Senegal while working for the Peace Corps. 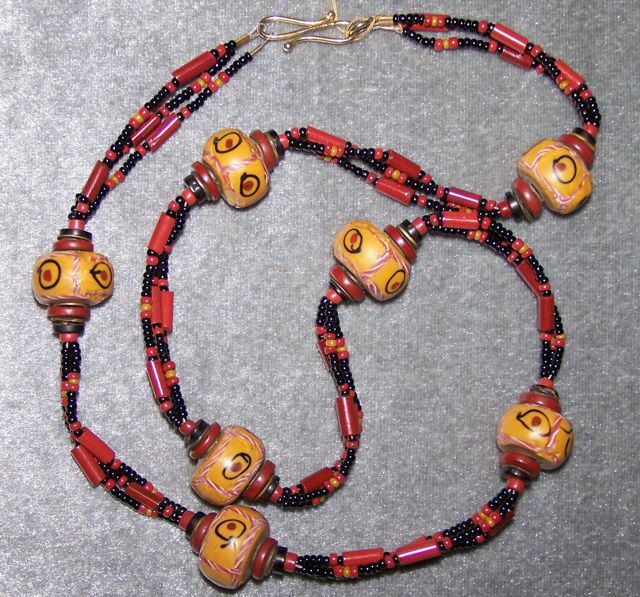 They came to America and settled in Washington, DC in about 1988, and joined the Bead Society of Greater Washington--where Howard served as President in 1990, the year the organization sponsored the Second International Bead Conference. Howard will be remembered as a kind, handsome, likable man, with a sincere interest in beads and their history, and has a glass-beadmaker--having taking up this art just prior to their return to France. 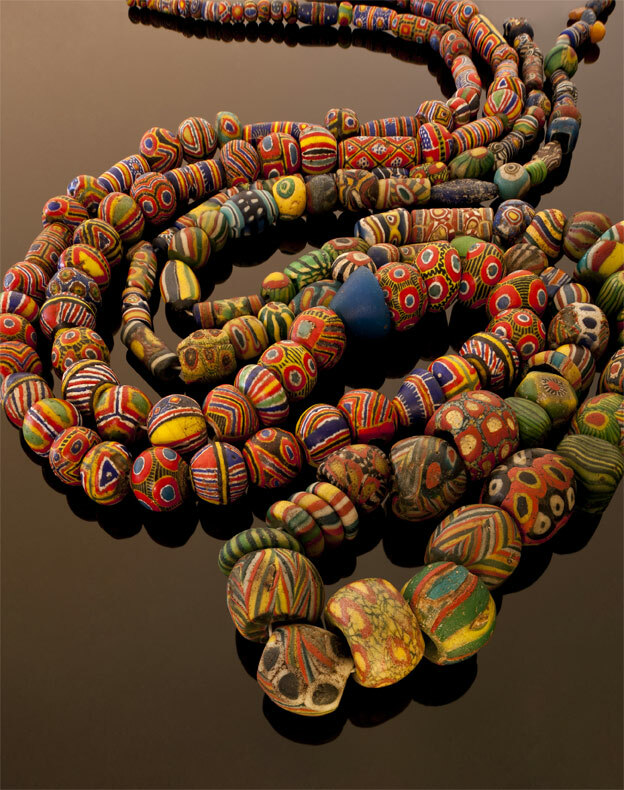 Marie-Jo also indulged in beadmaking, along with other arts. For several years, they managed a charming shop in Collioure (an artist colony), while residing in Banyuls-sur-Mer. 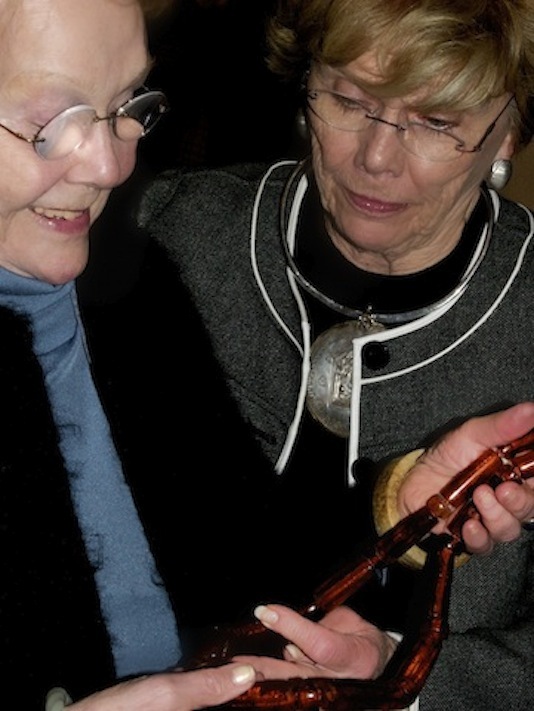 I greatly value the time I spent with them in DC, and that Howard and Marie-Jo always generously shared information, and allowed me to document their collections. 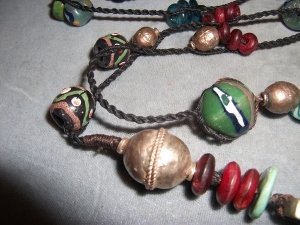 Their original research has been presented in four publications they produced, two being self-published, on Kiffa beads and Czech beads; and two having been presented in Beads (the journal of the Society of Bead Researchers), on French glass-beadmaking, and the archaeological recovery of trade beads in Senegal. It is very sad to lose a friend--and more-so when that is someone who gifted the world with charm, enthusiasm, honesty, and real friendship. Just having them so far away, in recent years, has been unsettling. But the prospect of never seeing Howard again is a great loss. My sincere condolences to Marie-José. I know Howard's many friends feel similarly. Re: Sad news announced this morning, -- Joyce Post Reply Edit Forum Where am I? How very sad I was to read Jamey's message about Howard. 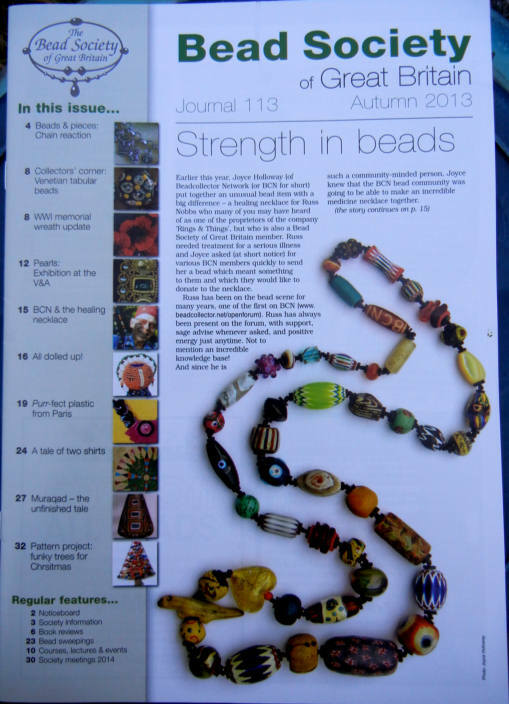 I was pleased to receive the latest issue of the Bead Society of Great Britain's Journal and find my necklace on the cover. 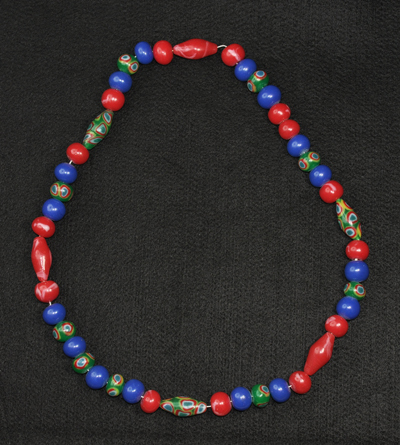 This is the wonderful necklace Joyce strung from the beads many BCN members contributed. These beads and the sentiments behind them helped Dee and I as I overcame cancer this year. My stem cell transplant was 43 days ago in Portland. We are home, sleeping in our own bed, cooking in our own kitchen and I'm back at Rings & Things working part time with the African and Indonesian beads I love. The beads and necklace made a difference. I appreciate all your support. By the way, our "black friday" discount sale has been very successful with African goods. We are wiped out of a number of beads I bought years ago. Older price plus discount made them too good to pass up. I'm digging through my stash looking for strands and art to add to the mix. 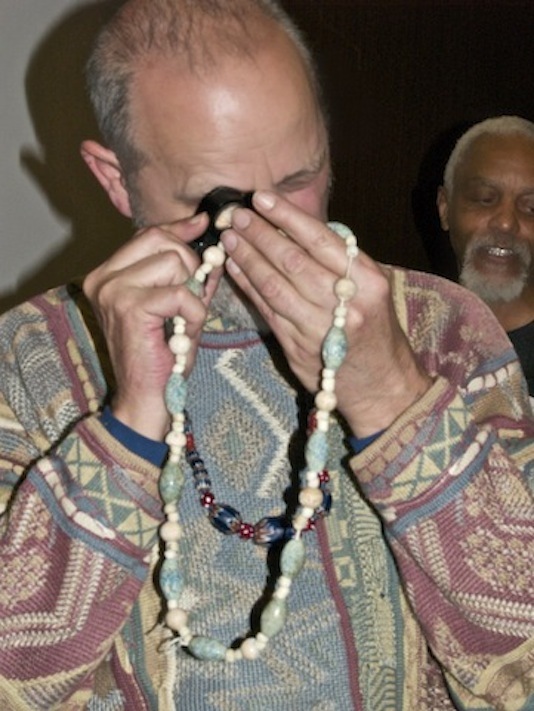 Re: BCN Healing Necklace on BSGB's Journal cover -- Russ Nobbs Post Reply Edit Forum Where am I? Gratitude and love to all! The Russ Medicine Necklace is a wonderful symbol of positive healing power, a "community necklace". I am so very glad you're doing great, Russ, and getting back to the work you love! 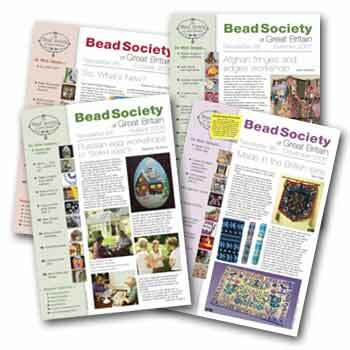 The Bead Society of Great Britain does a wonderful quarterly journal; I urge everyone to join. 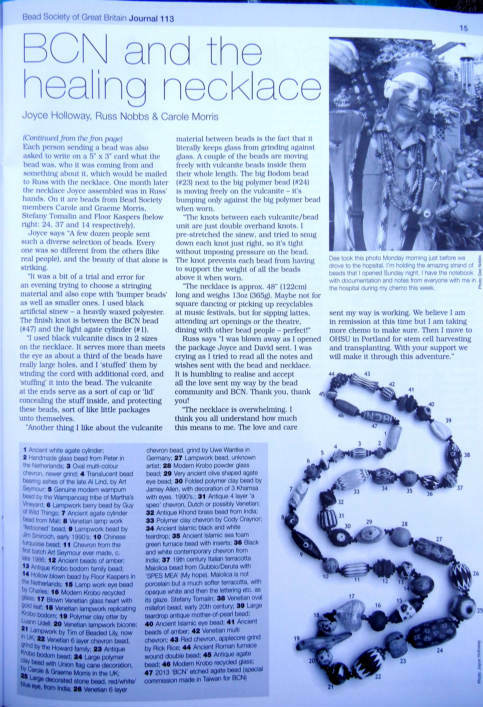 The current issue also has a nice presentation by Stefany on Venetian fancy tabular beads, a sequel article by Jurgen Busch on Kiffa beads, and an article about the pearls exhibit at the Victoria and Albert Museum through Jan. 19, 2014. Time after time, the BSGB journal has something for everyone, which is stellar, especially when one remembers that it is a volunteer effort! Just got back from Santa Fe - a very nice treasure-hunting adventure and my first visit there. My main destinations were the two Whitehawk shows - Antique Ethnographic Art and Antique Indian, plus the The Santa Fe Show, the Traveler's Market, and a smattering of antique stores. I also visited the Georgia O'Keeffe Museum, and took a guided nature walk at the Hyde Memorial State Park. 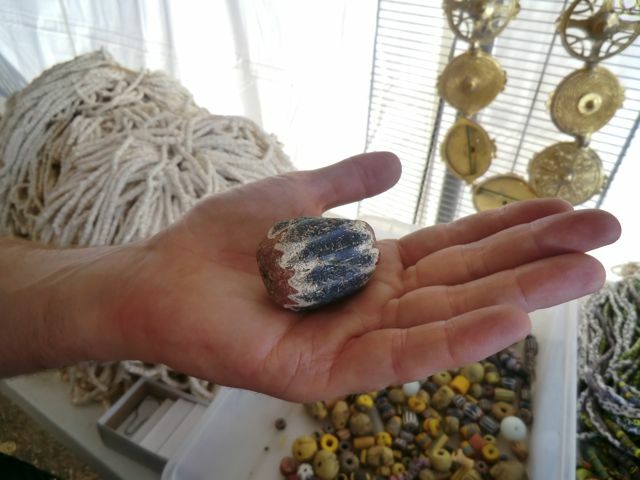 There were not a lot of antique Venetian or other trade beads to chose from, but I had fun seeing the area, walking the downtown boutiques, and checking out two of the outdoor flea markets with Junona and her husband Bruce, who happened to be visiting Santa Fe at the same time I was. Unfortunately I did not get a chance to meet Sarah, who was in town very briefly and had her time booked solid. I could not take pictures at the shows, but took shots of various beads and exhibits at the Traveler's Market. I also took pictures of wild flowers at the park. Many of the flowers are tiny, and reminded me of taking photos of beads, so I've included a few of the flowers along side some of the beads I purchased on my trip. Hope you enjoy the travelogue! Re: Reporting in on my Santa Fe trip -- Rosanna Post Reply Edit Forum Where am I? A beautifully done gold bail for a kiffa bead, and some crocheted beads, a "fair trade" item made in Morocco by women as a craft business. These beads are available by the packet of mixed designs and I bought two packets. 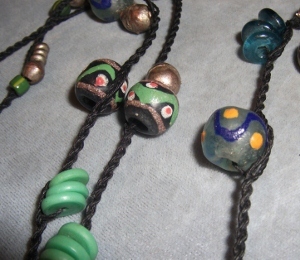 The beads pictured were strung by Earl as an example to show them off. Very pretty! 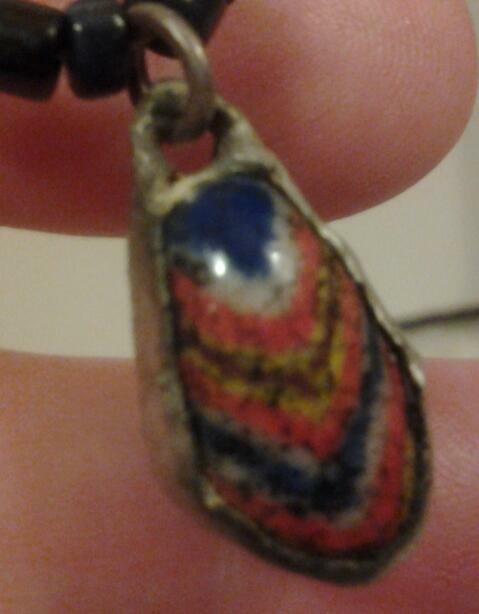 Is this possibly a kiffa bead? This puzzles me for a while now. 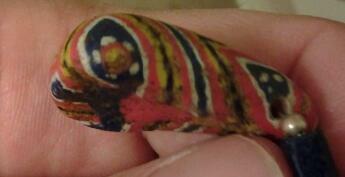 Size is: 16mm long, 10mm wide and 8mm thick. It came from Mali some ten years ago. 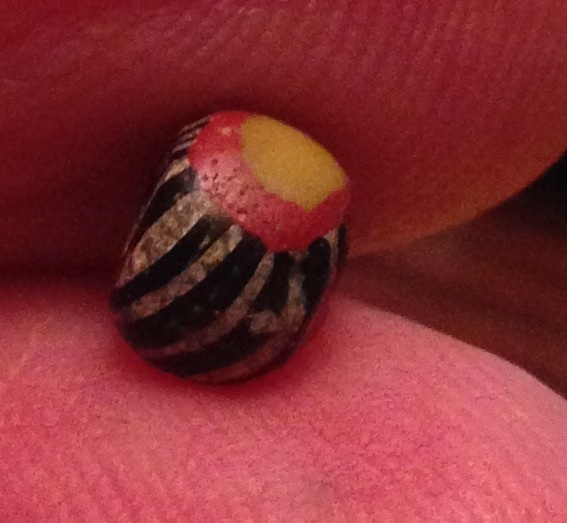 The damaged part of the bead reveals the inside that has a brown color and looks like clay(in real life, not in the picture) to me. 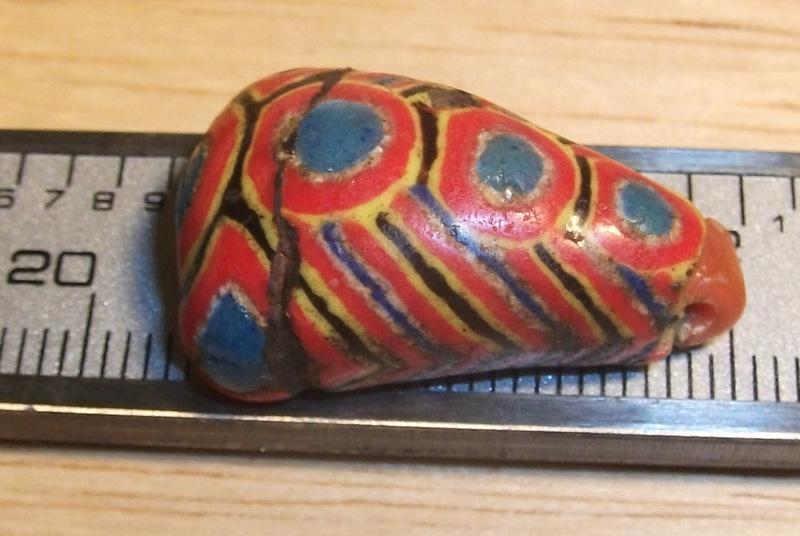 Re: Is this possibly a kiffa bead? -- Hendrik Post Reply Edit Forum Where am I? Now the bead looks like a core covered with murrinis. Hello to all, I was assembling these pictures for a future purpose and thought they would make a nice weekend show & tell. 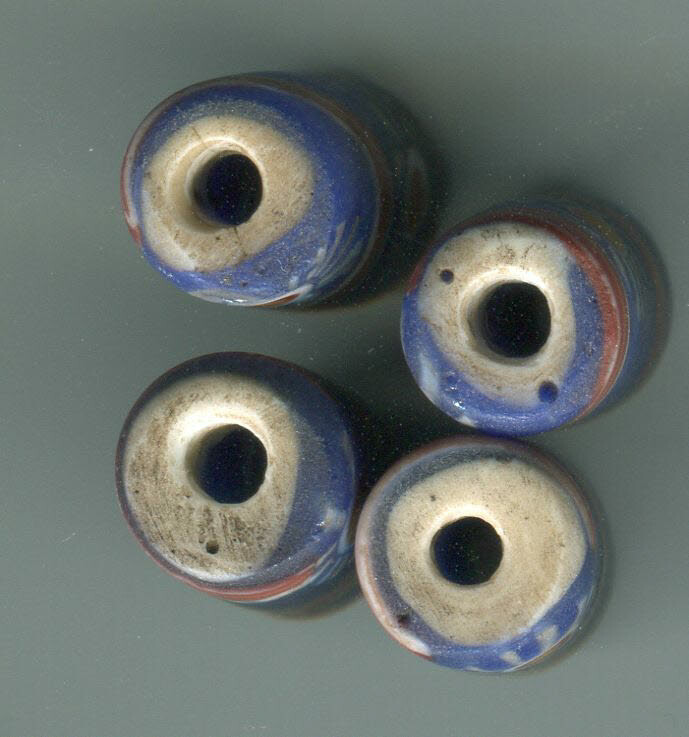 These first four beads are most likely from Fustat bead works (ancient Cairo), circa 900 to 1100 AD more or less. The first three beads are 18 mm in diameter and the last one is 23 mm. Re: Mosaic Glass Eye type beads... -- mosquitobay Post Reply Edit Forum Where am I? Kiffa new or old ? 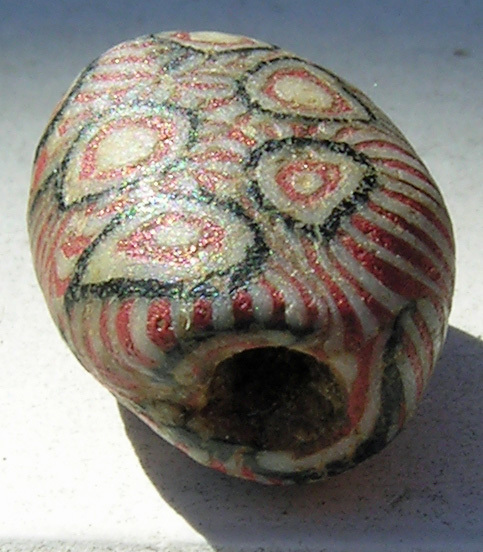 A simple question about this bead that needs your expertise ... new or old kiffa bead ? How do you know? What are the identification points? Re: Re: Kiffa new or old ? -- beadstore.com Post Reply Edit Forum Where am I? Aesthetically, there is just no comparison. Re: How do you know? What are the identification points? -- beadiste Post Reply Edit Forum Where am I? Here's a small selection of the Picard's kiffa. And scroll down at the tasart link. The images are still on the home page, but we did take off the instant PayPal button. Please post here if you'd like me to send you our PayPal eddress for a donation for a blind pick, and/or a BCN dzi bead. Many thanks to all! Currently there are 2 donors tied for the Jazz bead which goes to the winner on May 12. My bedtime May 11 will be the close of the blind pick opportunity, and the winner of the Jazz bead will be announced the morning of Mother's Day, May 12. Here are the blind pick beads before Art wrapped them up. Re: BCN fundraiser news 5/5: 8 more days and 4 more Seymour blind picks available -- Joyce Post Reply Edit Forum Where am I? I wanted to offer these beads for sell for BCN. Joyce said to put them on the trade pages. I tried and couldn't successfully navigate the site. Thought I entered all the information correctly. There are few bead trades on the site, perhaps there is something I am missing. Anyhow, these beads will be available with J/D help soon, If I have overpriced them, I hope Tzarart (my nickname for said sweetie!) will let me know. If they are underpriced, it doesn't matter, Jake generously gave them when we exchanged beads fast and furious several years ago- he got a couple of his pemarakas for me. 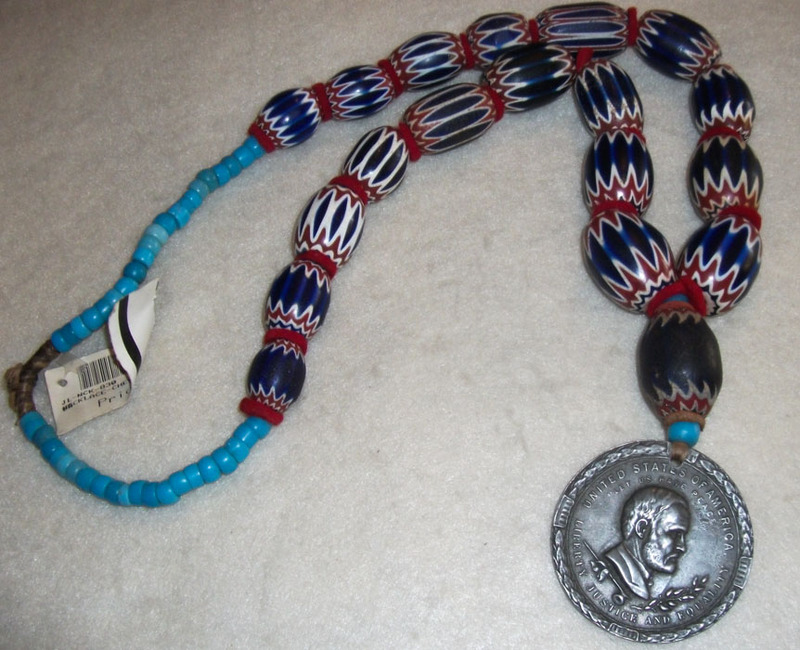 Donate for an amazing strand or one historical bead! As Carole Morris says_Cheers! If you were a beautiful, blue eyed, natural blonde looking for a job in the 1950's, what would you do? Would you choose work which would enable you to circle the globe several times each year? Would you spend your free time shopping for beads? One bright flight attendant working for Pan Am Airlines did just that. Naomi Lindstrom is her name. Last night Jamey Allen present this world class collection. And after thirty something years, he continues to curate and design for her. I asked Naomi if she was selling. She says "No, but I am interested in buying more"! Naomi is shown on the left with her sister. And here are a few images from "the tip of the iceberg." Re: Re: Sorry, this is the best I could accomplish last night. -- Frederick Post Reply Edit Forum Where am I? You mentioned "She says "No, but I am interested in buying more"! Re: Thanks much!!! but one more question... -- tofsla Post Reply Edit Forum Where am I? One of the things I love about beads is that there are millions of very beautiful examples that just about anyone can afford. Sure, at any given time there are small segments of the market where fashion rules. Zi is one of them right now, driven - in part, at least - by the Chinese plutocracy's mystification of everything it is in the process of wiping out in Tibet. But prices don't always keep on increasing. With zi perhaps they will, at least for as long as it is still thought to be possible to distinguish fakes from authentic beads, but the history of art markets is full of bubbles that have collapsed. 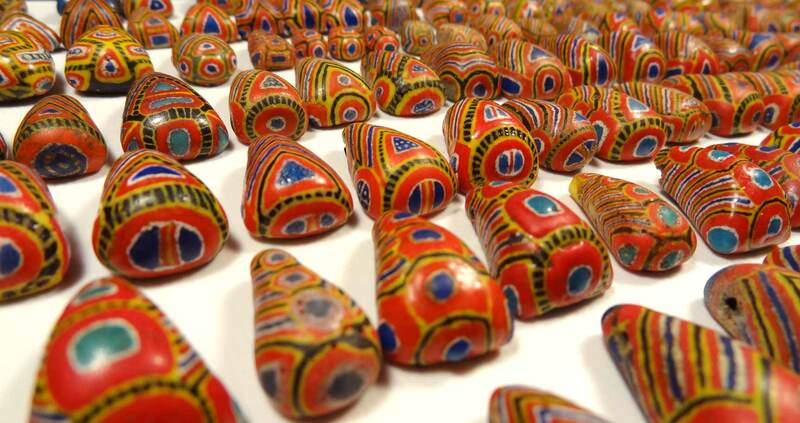 For the most part, bead prices seem to have remained on average quite stable. If you compare the prices that Robert Liu gives in his book Collectible Beads there's generally not a whole lot of difference between then and now. And perhaps, looking at the demographics of the market, prices may actually drop in the next ten or fifteen years. All taste is a mix of socially informed convention and deeply personal drives. The two bead types that personally I find the most beautiful, Phoenicians and Kiffa, still offer examples that I can buy for the price of a good, or sometimes a mediocre, dinner. It amazes me that that is the case, because these beads, which are quite rare and fragile, give me pleasure for much longer. Everybody on this forum has different tastes. I would never even have discovered Phoenicians or Kiffa without Thomas and Gabriel, and I'm grateful to them for getting me hooked. But if there's one collector here who inspires me it's Finfan, who lives - he tells us - on a quite limited budget and still manages every year to buy a lot of beautiful and interesting beads. A few weeks ago we had a break in the weather. The temperature rose above freezing, the wind died down. 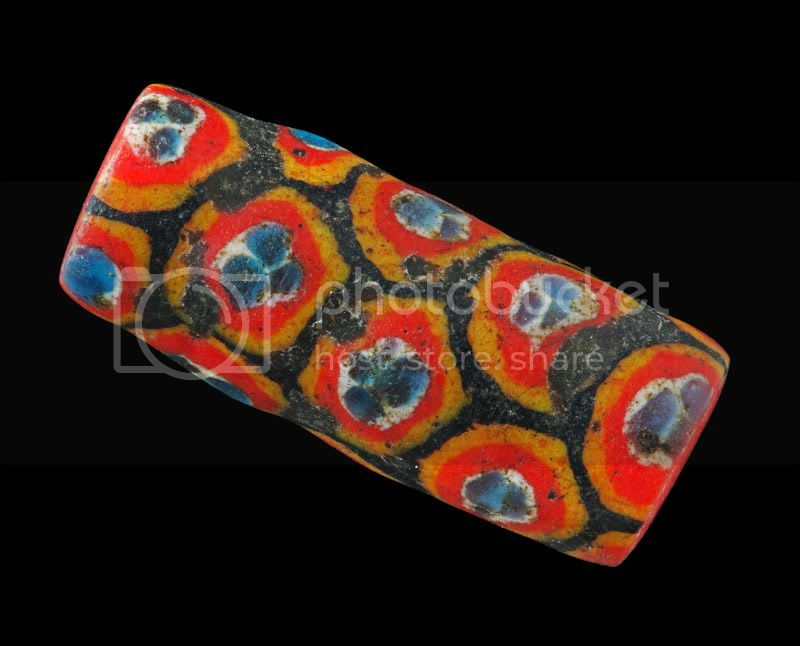 So I took a box of beads outside and took five photographs of mixed Venetian beads from the African trade. 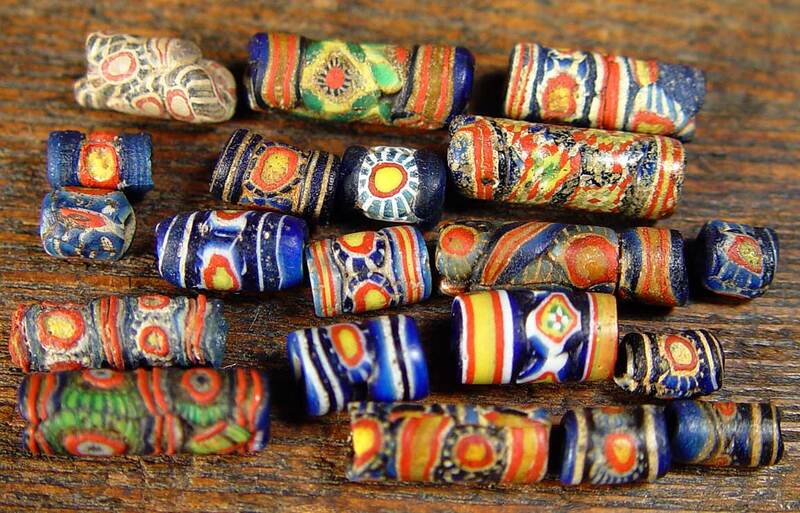 These bead are from the late 1800's to the early 1900's. Huhhh... Wow Thomas, I did not know that... Can you please inform me more? Thanks! Re: second row from the inside -- TASART Post Reply Edit Forum Where am I? Re: Huhhh... Wow Thomas, I did not know that... Can you please inform me more? Thanks! -- jake@nomaddesign Post Reply Edit Forum Where am I? The word "radioactive" in another post got me wondering, how often are beads radioactive? Like from containing a naturally radioactive mineral. 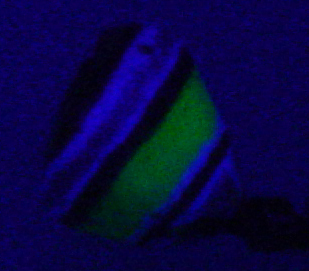 I don't mean glowing under UV/blacklight, but detectable on a "Geiger counter". Re: Truly "Radioactive" Beads? -- buriedinbeads Post Reply Edit Forum Where am I? Uranium used to color glass will cause it to glow green under a UV light, and will also set off a geiger counter and (according to the info from Virginia Blakelock at Beadcats in the link) fog the film on a radiation detection badge. The radiation level is supposedly low-energy alpha particles, lacking the poop to pass through paper or the layer of dead cells covering our skin. 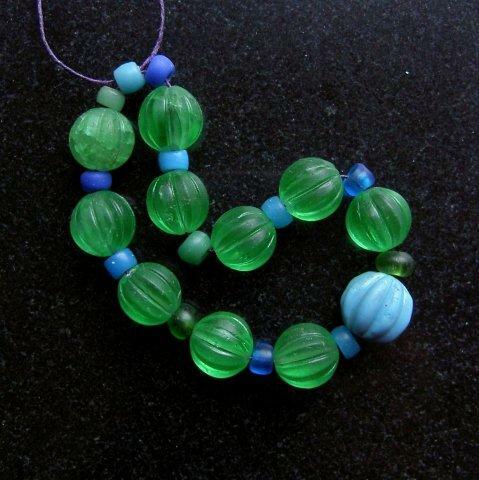 It's been in use for at least a hundred years, especially in Czech pressed glass beads - some of the old Kiffa beads have uranium glass for their cores. The term "vaseline glass" is often used for the greenish yellow variety, after the old petroleum jelly color. You can see in the photo attached how the yellow beads appear to glow, even in the low light in which I photographed them. That's because they actually are fluorescing, i.e., emitting light in response to incoming light energy. 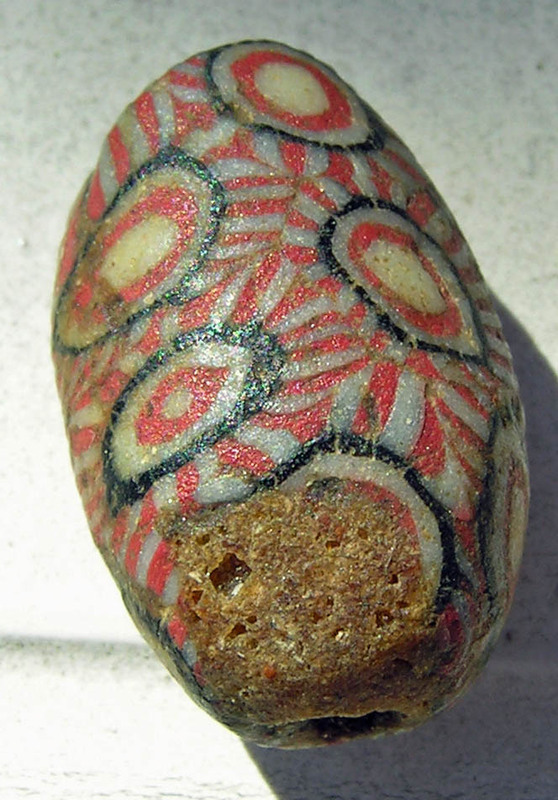 Just arrived home and have only a few pics from the first two days of bead hunting to share. First is a strand of brick red fancies from The Bead Shop in Laguna Beach, CA, where I stopped on my way to Tucson. 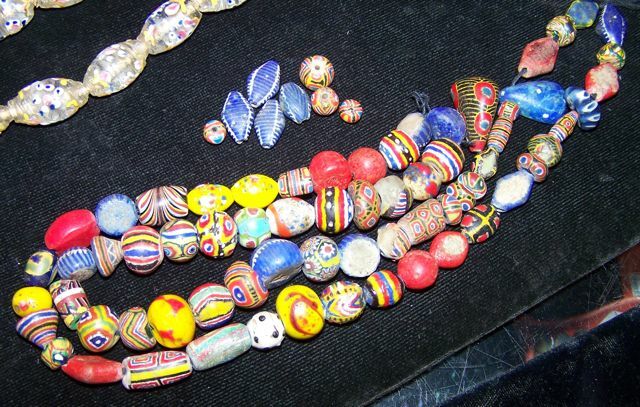 Peggy Smith has a nice selection of Venetian trade beads, Kiffa, conus shell, and other collectible antiques. I have some pics of her store which I will post later. 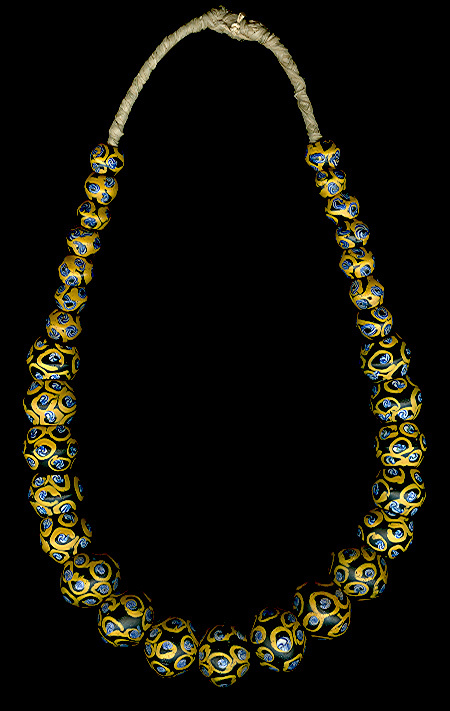 Second is a "find" - a nice necklace with seven rare Venetian fancy beads from the African trade. I have one of these beads, in beat-up condition, so I was thrilled to find seven in very good to excellent shape on a newly composed necklace. Found at a booth in the Gem Mall Show in Tucson. Re: Taste of Tucson -- Rosanna Post Reply Edit Forum Where am I? 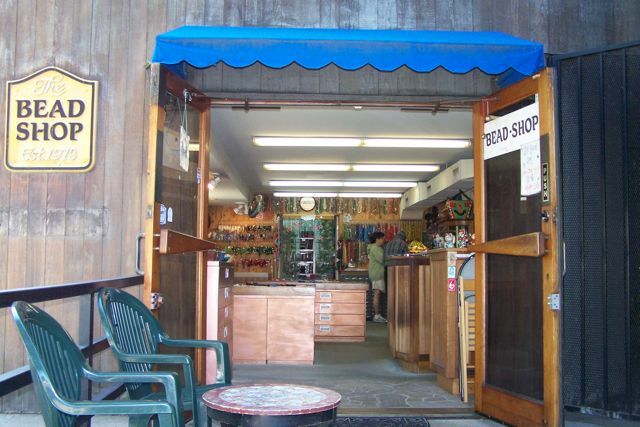 Some pics of the The Bead Shop in Laguna Beach, CA. I think the owners are looking for a buyer for the store so they can retire - maybe your bead dream come true? 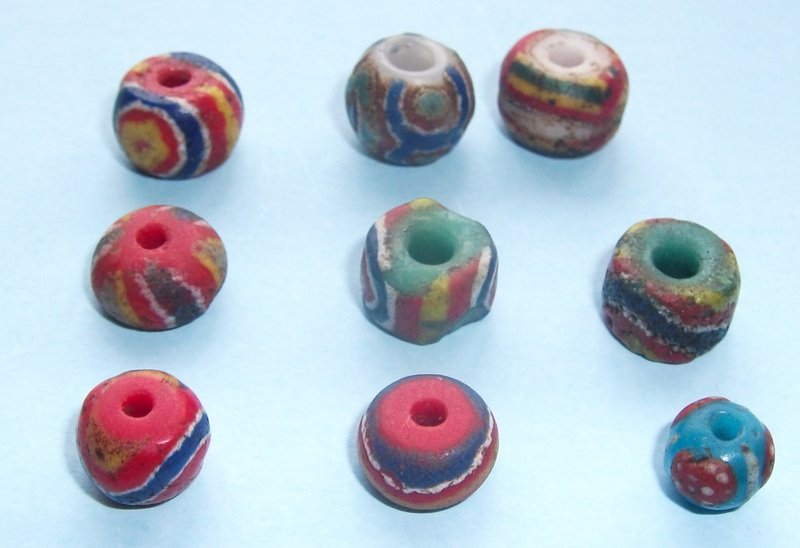 There was a good selection of trade beads and other interesting items, in strand and singles. Worth checking out if you are in the LA area! These pictures are just a small sampling of the merchandise. Re: The Bead Shop in Laguna Beach -- Rosanna Post Reply Edit Forum Where am I? 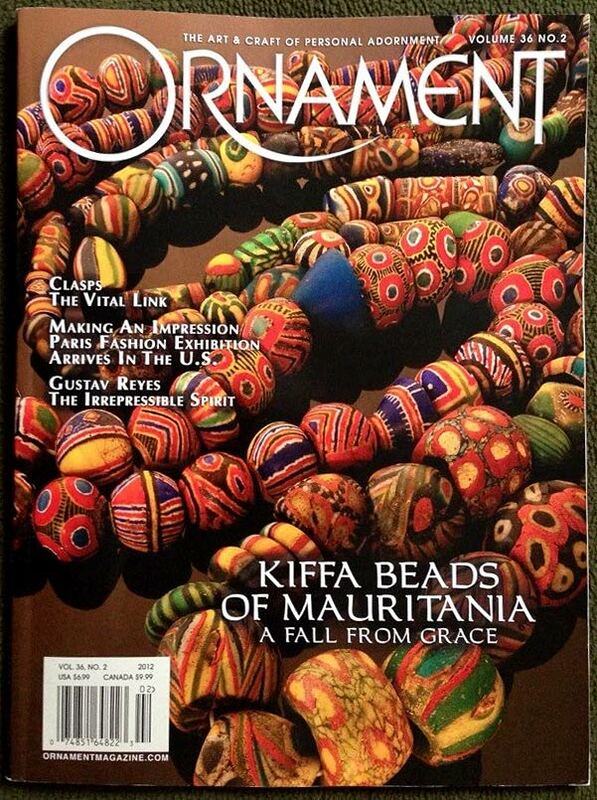 we have been super busy getting ready for Tucson, not much time for photos as well, plus this issue of Ornament magazine, Jan 2013 will have a cover with beads from the Kiffa and related collection, shot by my brother Alex and myself, inside is an article about kiffa by J Busch also more Kiffa pictures, one of them seen in this post......Hope to see you all there!!!! Kiffa are still my favorites! Re: Tucson next week.....plus -- TASART Post Reply Edit Forum Where am I? Re: Just got my copy of the new Ornament -- TASART Post Reply Edit Forum Where am I? 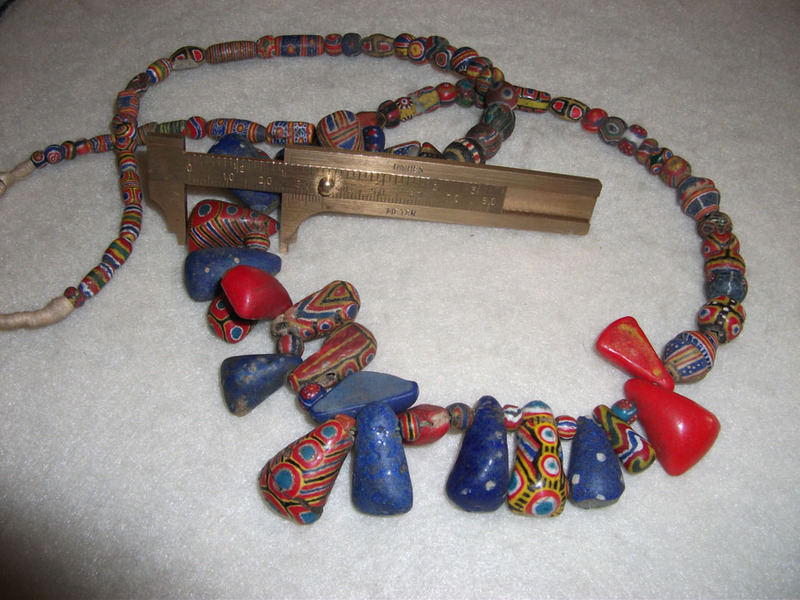 the picture they used on the cover, a side by side view of both Mauritanian Powder glass Kiffa beads and ancient Islamic pre-coursers.....my example of the "Chicken and the Egg"
Lovely beads and cover, Thomas! Yes, the "fall from grace" is an interesting choice. The beads themselves have not fallen from grace at all - they become more desirable each passing year. It's unfortunate that the skill was not passed down - the new versions clearly show this loss. Re: You saw it here first..... -- Joyce Post Reply Edit Forum Where am I? Dazzling! Here are two more Thomas images. Many fine Kiffa! 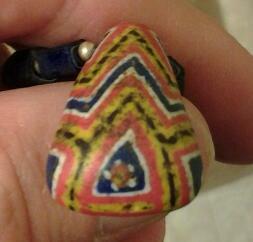 I came across this bead in a box of mixed ancient beads that I have had for a few years that I never really look at. I thought it was really nice and wanted to know if anyone had any information on it. Re: Bead info please -- beadweyr Post Reply Edit Forum Where am I? Help with ID - imitation Venetians, etc - Kiffa? Mauritania? Found in a thrift store, so I have no background info. 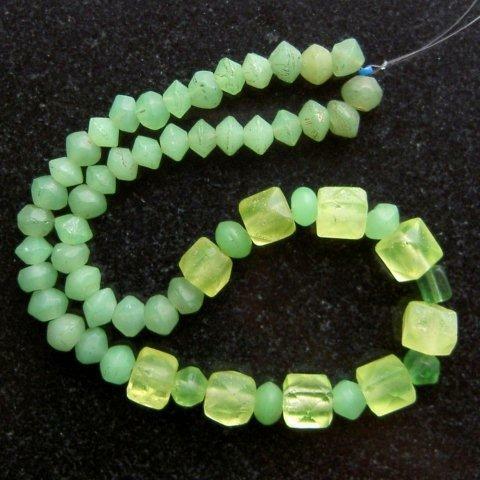 I really like the black, imitation "Venetian" beads, they even used a speckled, multi-colored glass slurry to give the banding on the black beads the look of aventurine without any sparkles. 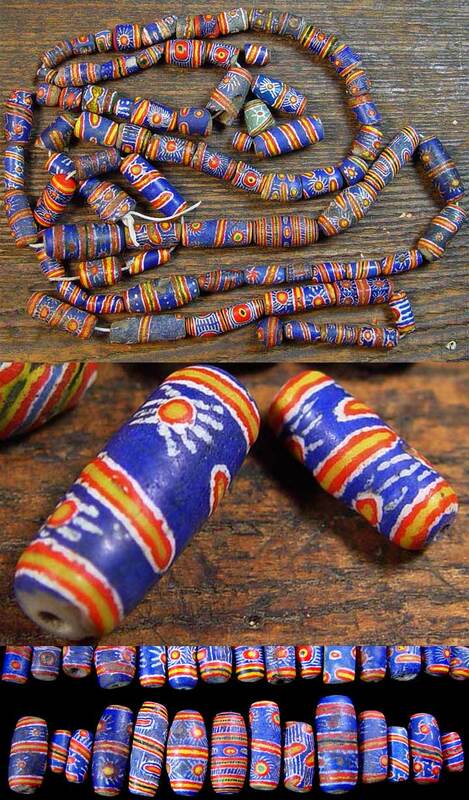 The translucent blue glass beads have the color of bottle glass, which makes me wonder if these could be Kiffa? 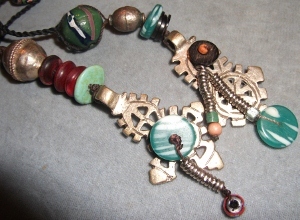 There are also various Czech beads and some turquoise stone beads in the mix. Can I get some opinions on origin and age? Looking forward to hearing your opinions and thanks in advance for your help. More photos - Re: Help with ID - imitation Venetians, etc - Kiffa? Mauritania? Re: Help with ID - imitation Venetians, etc - Kiffa? Mauritania? -- Mel H Post Reply Edit Forum Where am I? More photos #2 - Re: Help with ID - imitation Venetians, etc - Kiffa? Mauritania? Most of the post I have made in recent days have popped up double. I'm checking and trying find out why. Re: Testing, The first woked, let us see if this one works... -- Dog Bone Crazy Post Reply Edit Forum Where am I? Re: Testing -- Dog Bone Crazy Post Reply Edit Forum Where am I? 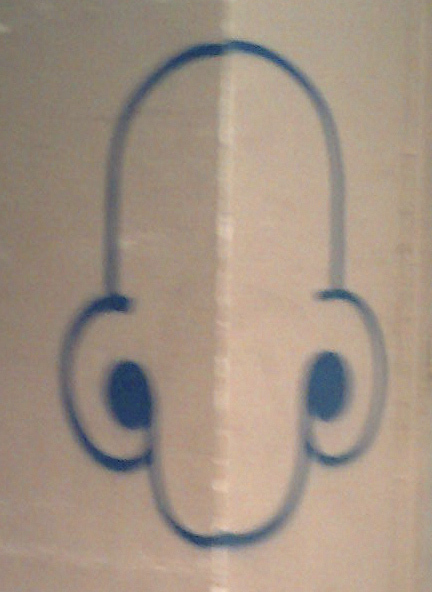 This is a good sized street graffito I saw, photographed(1st. pic)and Photoshoped(2nd pic)a little bit. I deem it great art: see how it was painted exactly on the edge of two meeting walls! 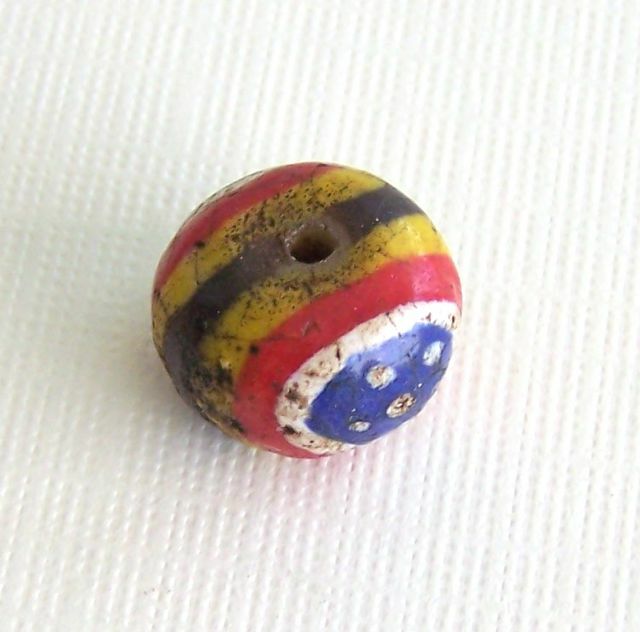 Wouldn't it make a very n*I*c*E pendant-bead? Now: would any Forumite dare to make it complete (i.e. design the back and sides of it?). Re: Excellent -- Frederick Post Reply Edit Forum Where am I? Re: Thank you Fred, you are such a gentleman..... Tibetan Gao, and Purse I collected in India~ -- jake@nomaddesign Post Reply Edit Forum Where am I? Fantastic strand, beautiful patina and wear, I think the double diamond are a reground shape? Carl? Nice repurposed tassel, some Kiffa, I do have more Kiffa to add. I also particularly love the one Bohemian glass with silver. Ethiopia? 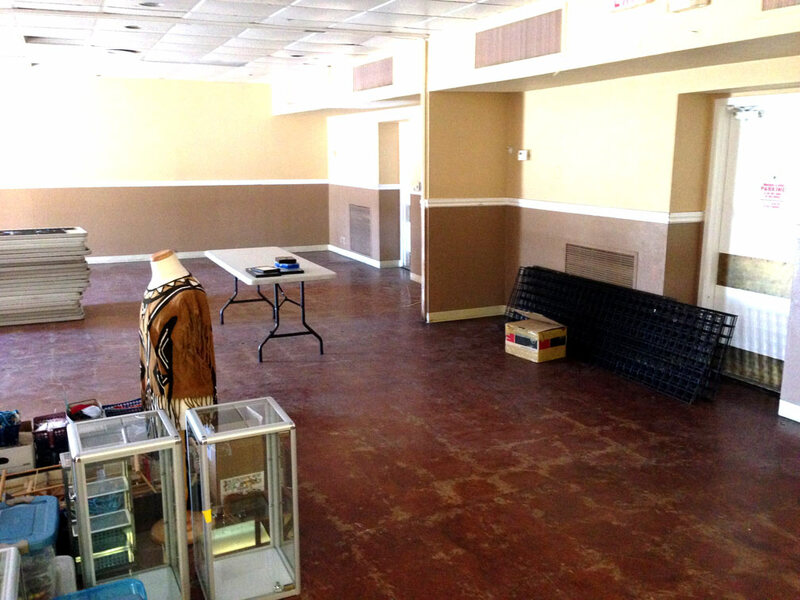 Bead Collector Network needs our help!!!!!!!!!!!!!!!!!! I found out the other day that the server fees for the BCN are once again coming due, this is a site that is solely supported from gifts and/or grants, all of which have dried up to date, now Joyce is faced with a decision: archive and shut down or beg for funds to keep going! 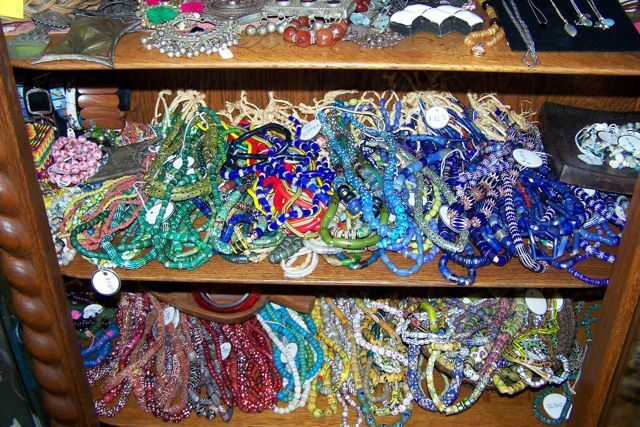 Re: Bead Collector Network needs our help!!!!!!!!!!!!!!!!!! -- TASART Post Reply Edit Forum Where am I? A few bead collectors from Northern California took a trip down to the Picard Museum yesterday. Thanks so much for hosting us, John and Ruth, and to Rosanna, for pulling us all together! Rosanna, Fred, Jaret, Carol, Janet and her husband (apologies, I did not get his name) and myself all had a really great afternoon at Picard Museum. 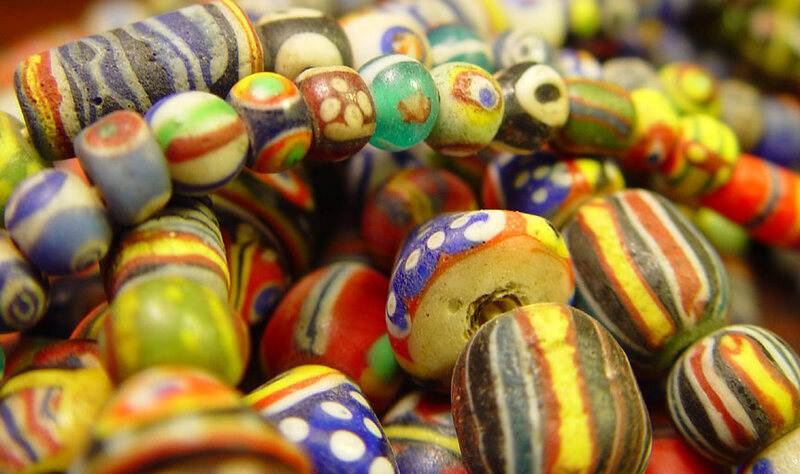 If you love trade beads, it is an IMPORTANT visit to make. 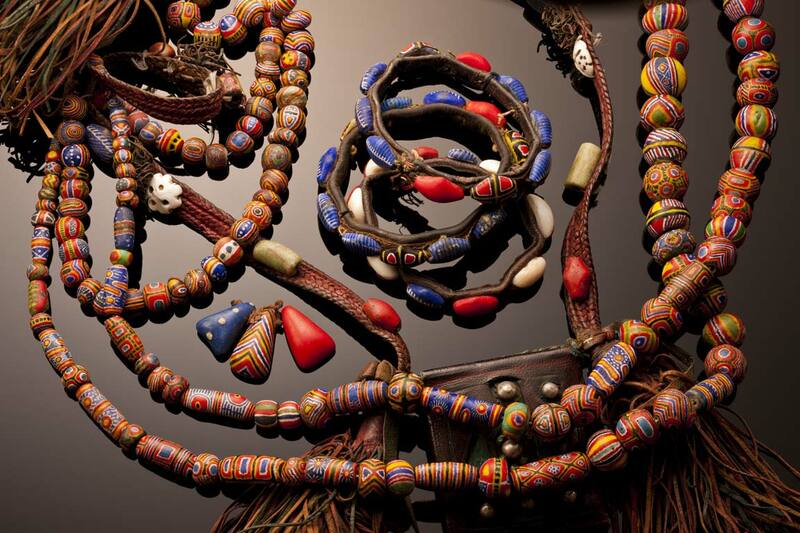 There is no place like it, as the Picards have made it their life work to collect and display all imaginable examples of beads from the African trade. I go there again and again, each time I am so glad I did. 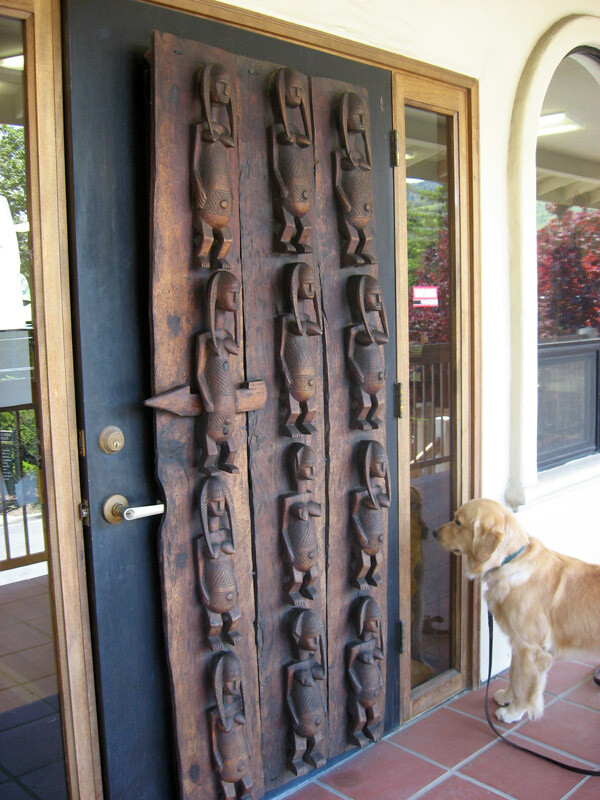 Here's the door. Janet's dog is still waiting for her to come out! 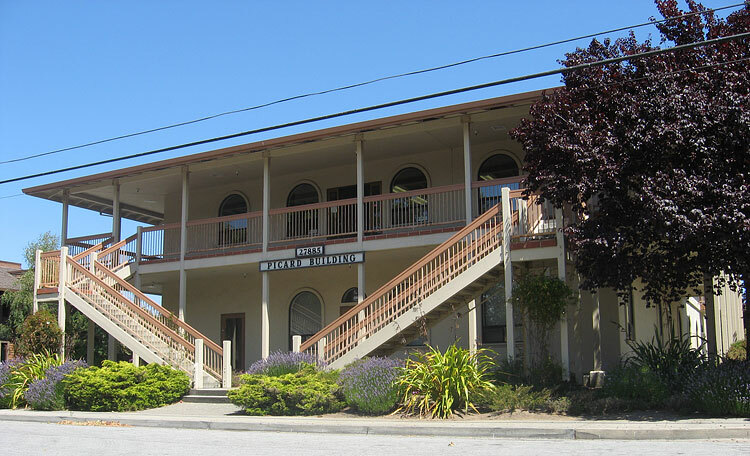 Re: The Picard Trade Bead Museum in Carmel Valley, CA -- Joyce Post Reply Edit Forum Where am I? Re: Some pre-weekend Bead images -- TASART Post Reply Edit Forum Where am I? Re: been a while since I posted Kiffa beads -- TASART Post Reply Edit Forum Where am I? Got to see Rick (Rice) Rotten at the Baskets and Beads opening. 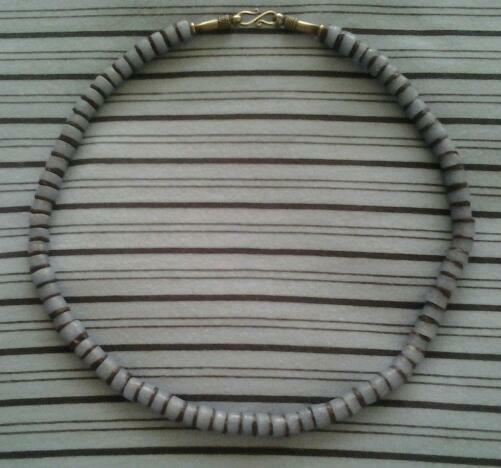 Shoul have taken a pix of him in his black chevron necklace. Here's one of Jake's pieces that is in the show. I gave him a couple of beat up carnelians and he quietly built this magnificent! Re: Bead Show Photographs -- Carole Post Reply Edit Forum Where am I? 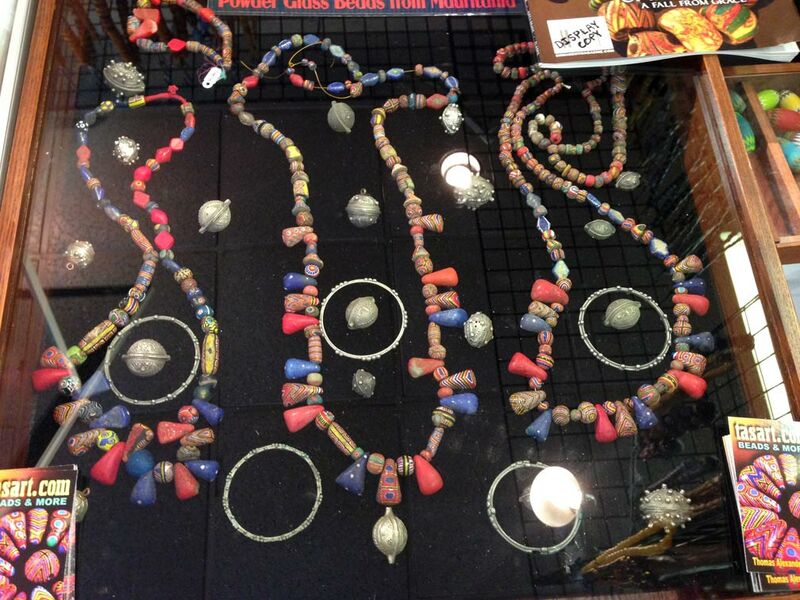 I had the honor of meeting Martha, the curator of the show, and we had several bead play dates. 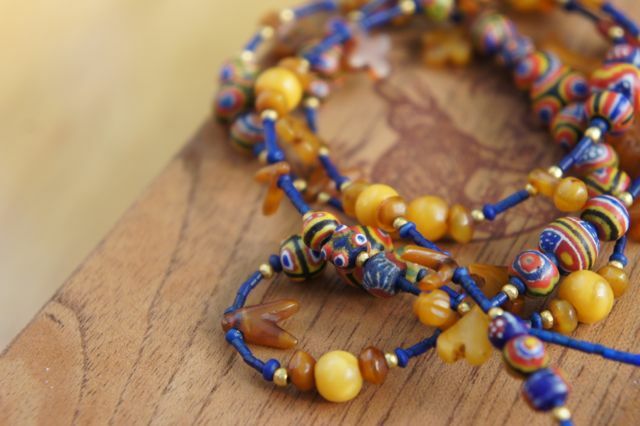 She has a wonderful collection with unusual beads. Her kiffa strand has many wonderful beads. 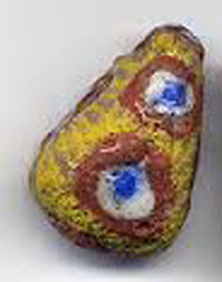 This is one of her kiffa beads in the exhibit. Either Martha can post her necklace or I will try to get a pix of the kiffa exihibit. 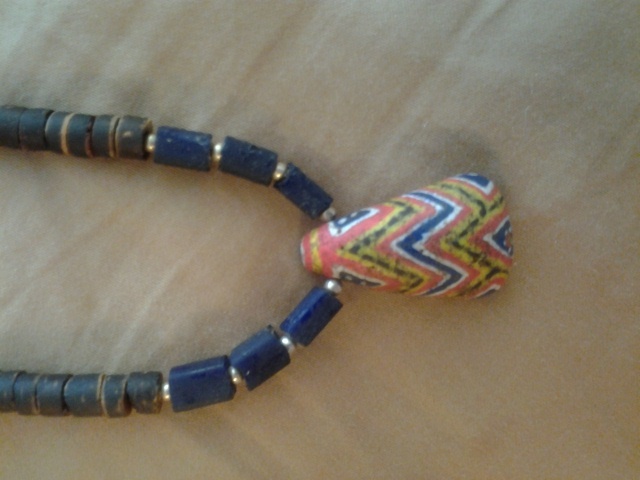 I bought this necklace from Kabba a couple years ago and didn't get any information on it. Martha, aka madame martha, who recently signed up on BCN and is the curator at the Global Museum in Fort Collins, Colorado, might be interested in showing it in the upcoming Beads and Basket exhibit. Beadbox (Matt Ridely), who I want renamed Bead Beagle, got together with her a while back, talked beads. I don't think Martha thought she had enough beads but Jake, Matt and I and Rick Rotten, in absentia, descended on poor Martha's assistant, beads in hand and ready for a show. We now have a show in May! We were also given the services of a Tasart quality photographer (hey-this guy photographs snowflakes!) to photograph our beads! I am in bead heaven. I saw some of our beads on a large flat screen tv and lost my breath. Martha has a killer Kiffa strand with a lot of unusual beads. 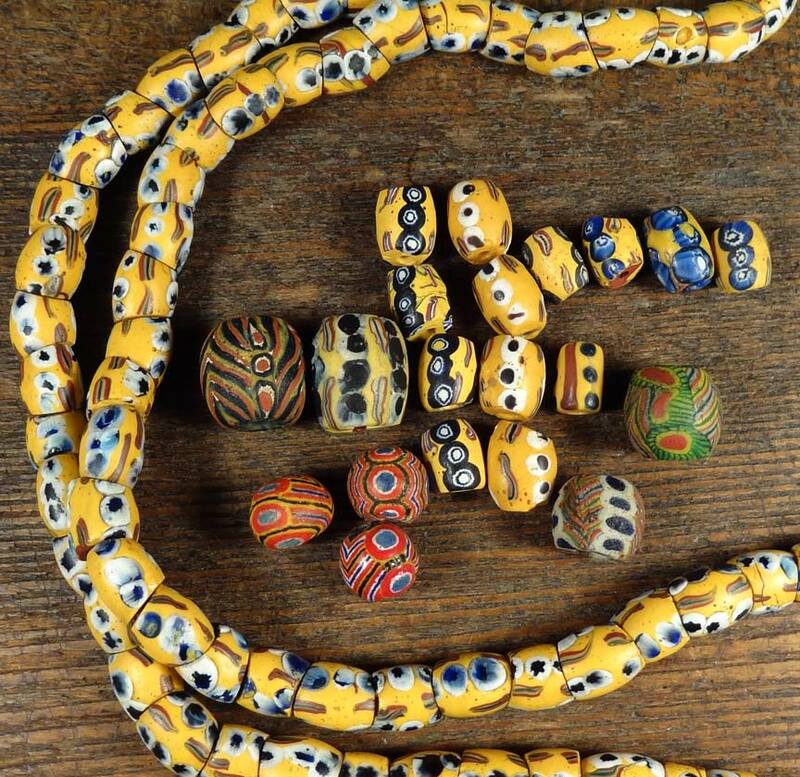 She has a great collection and I am glad Matt found her to make the us three Colorado bead amigos a tidy four! I want to post some beads that should be verified for the show. I can't wait to post my very small seal bead collection, that Mike so expertly photographed. I have wanted to post them since Jamey posted his primer. I know one to be fake but question three others. All the photographs are breathtaking and I can't wait to post! More to come. 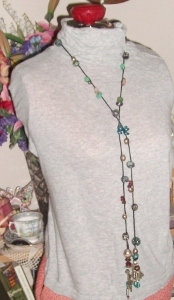 BTW, does anyone recognize this necklace? Here is a 50 inch long strand of Venetians from Degumay. For me as a first timer at Tucson, this strand was like a dream. First photo is the entire strand in all its beauty. 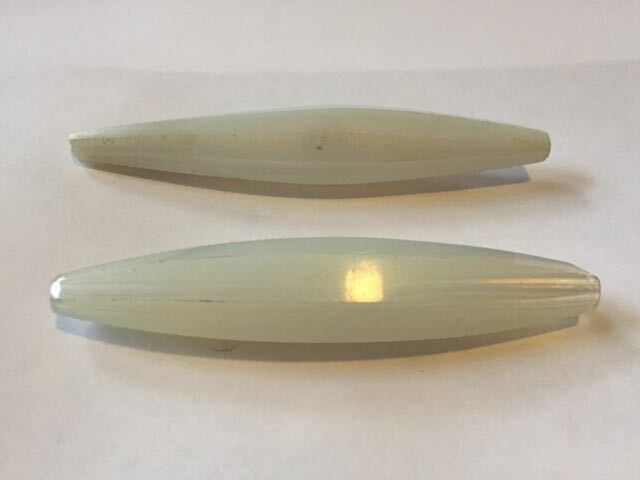 The second photo shows some of my favorites from the strand, including the long (20mm) yellow with the strange white/black eyes - which I think are murrine but the black portion has indistinct edges, almost like powder glass or really rough composite construction. Any thoughts? More beads in following posts. 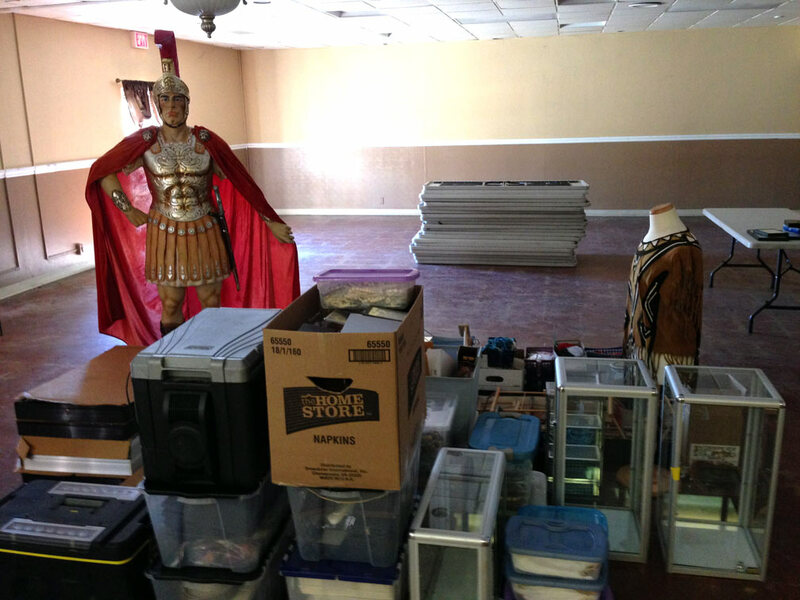 Re: Tucson Treasures - very long Venetian strand -- waneeho Post Reply Edit Forum Where am I? 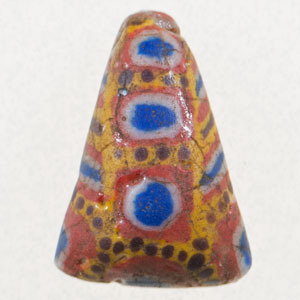 This bead is shown in two sizes on p. 242 of Middle Eastern and Venetian Glass Beads, by A. Panini. The legend says, " Large barrel-shaped lamp beads with longitudinal linear elements make up this degraded strand. They are vaguely reminiscent of the prestigious Middle Eastern mourfia aynifaine, from which Venetian glassmakers certainly took inspiration to satisfy the precise demands of the African market". 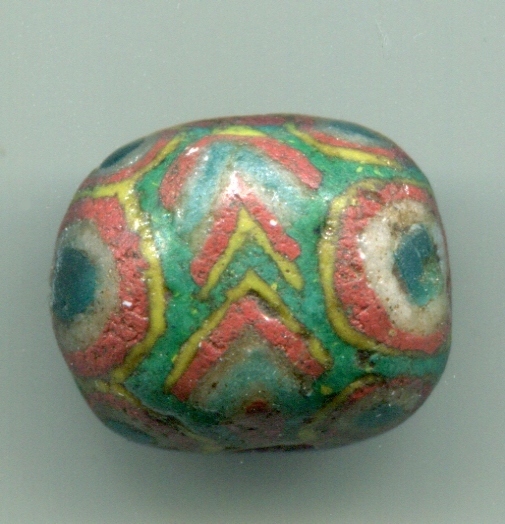 Panini defines mourfia aynifaine as 10th to 15th century mosaic beads with eye decorations. Re: Strange Yellow barrel with white/black eyes -- Rosanna Post Reply Edit Forum Where am I? Came across this one today I thought it was kinda cool. I love Repaired beads. 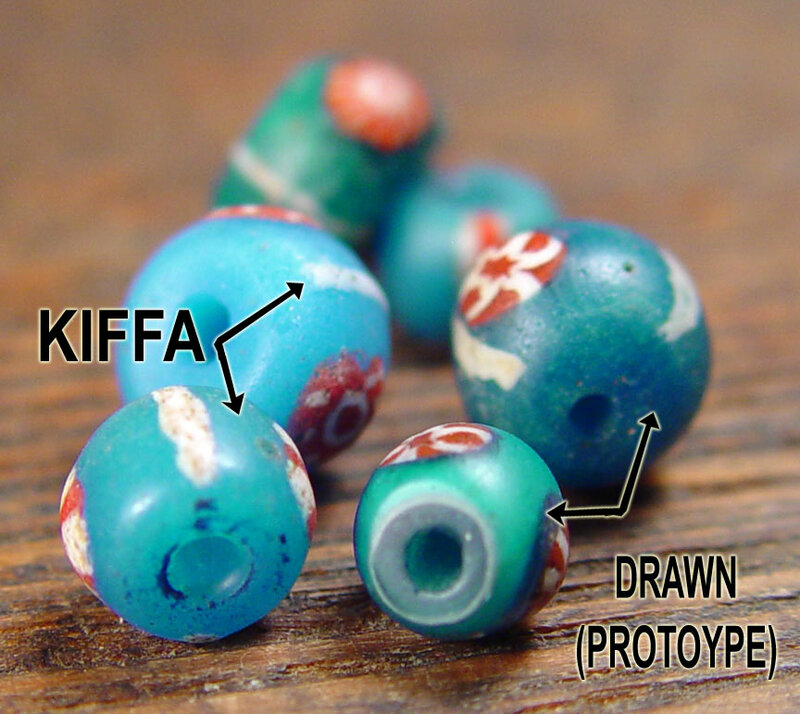 More info on these kiffa-inspired beads? 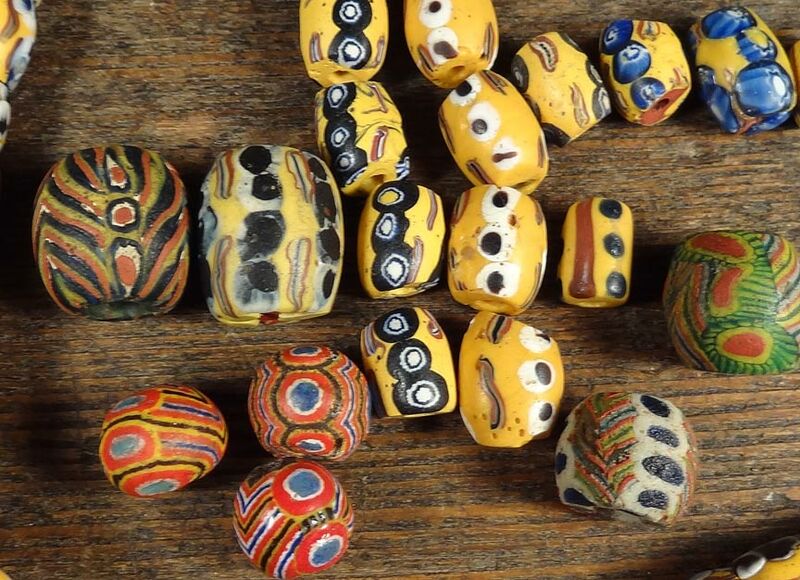 I purchased these beads in Accra recently. Does anyone on this forum know more about these? Would love some information on where they may have been produced and when. 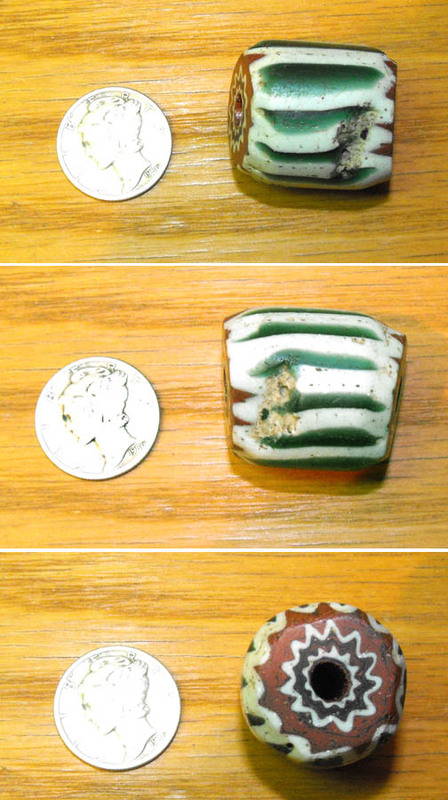 The photos show the top and bottom views of the bead. Each bead is about an inch long or a bit more, but I can get back tomorrow with exact measurements if needed. Thank you! 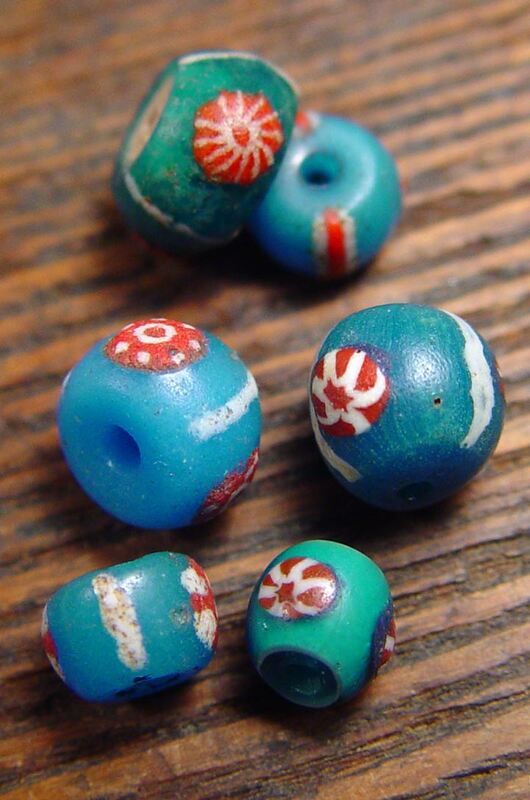 Re: More info on these kiffa-inspired beads? -- Preethi Post Reply Edit Forum Where am I? Here are the strands that Hands of the Hills had last year at the Grant Inn show. I didn't see any this year with HoH. Thomas probably has examples from 3 different batches. Not tired of Tucson yet? Then have a look at some more pictures. 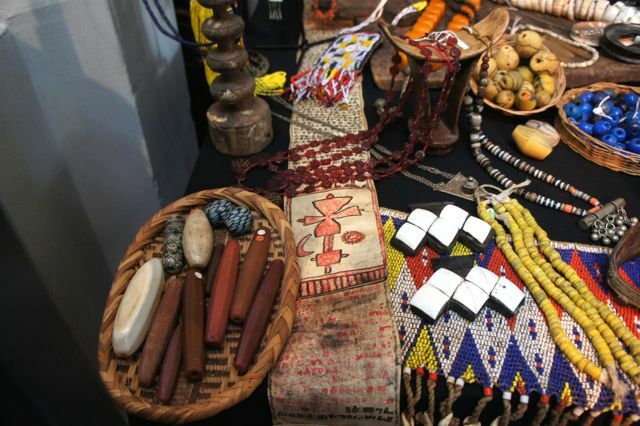 First, a panoramic shot of Degumay's booth at the African Art Village. Second, a big busted up chrevron from him. Re: little blue in second picture looks like it might be a kiffa type?? -- Stefany Post Reply Edit Forum Where am I? Re: Re: little blue in second picture looks like it might be a kiffa type?? Proto type -- TASART Post Reply Edit Forum Where am I? ...and, still there are more. But, they are all single Kiffa's and of the more recently made variety. ...while it's not a bead, I thought some may enjoy. Thanks to the Tuareg person that created it. It's a reminder of the time I spent there admiring so many beautiful beads...that helps to qualify this posting...yes? I think I was most intrigued by the tiniest agate beads and the big fat Kiffa's. The triangular Kiffa's there did seem to be quite a bit more robust than others I have seen. ...which came with a strand of more recently made Kiffa's had been broken, it was the only one. As I had just completed my one and only stained glass window, some of you may have seen it, I thought of how I could salvage the bead. I used the grinder to grind it down around the last complete stripe, then topped it with a jump ring and wrapped it with the copper foil that you wrap around the glass pieces, and then covered the foil with the soldering material. I know it's crude, but it deserved to be saved. 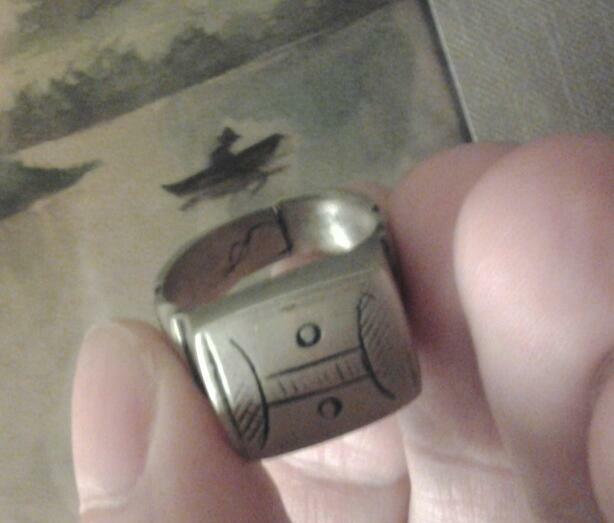 And had Thomas been my neighbor I 'd have enlisted his help and asked if we could do it in silver. ...here are a sampling of Kiffa's. Two are from Claire(Mountainamma), one is from David across the pond(I'm sure those in the know know to whom I am referring, one is from Russ Nobbs(well Rings&Things), two are from Africa Direct, and one is from Jan Skipper. And, when I spoke on the phone with someone from Rings&Things I asked if I was getting an antique Kiffa...I was told yes. Well, it is not an antique in comparison to the one from Africa Direct and the one from across the pond. I do know the difference. Sorry to be redundant for those that have heard this...I have visited the Bead museum in Glendale Arizona and the Bead museum in Washington DC. 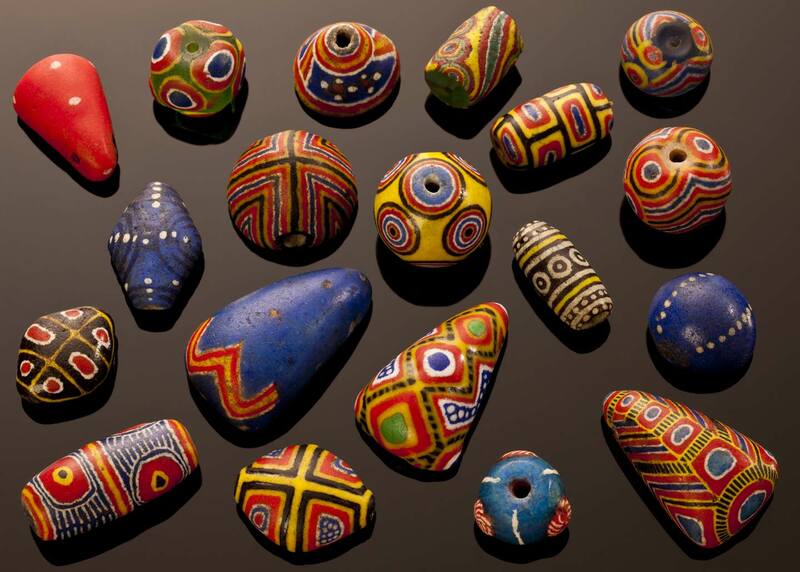 I have seen ancient beads at a Museum in St. Petersburg and in NYC at the Met. I have perused many a bead site on-line and pretty much know where to obtain a lot of different beads. I say this for those that tell me to google things and to go and get experience. I may not have your experience....what I have is mine. And, once again, I buy something because I love it. It's the bottom line and the top priority. And, I love all of these Kiffa's...and I have many more. After reading Art's recent post about his culls, I thought it would be nice if everyone that has a special Art bead or more that they would like to share ............ Lets start a thread. 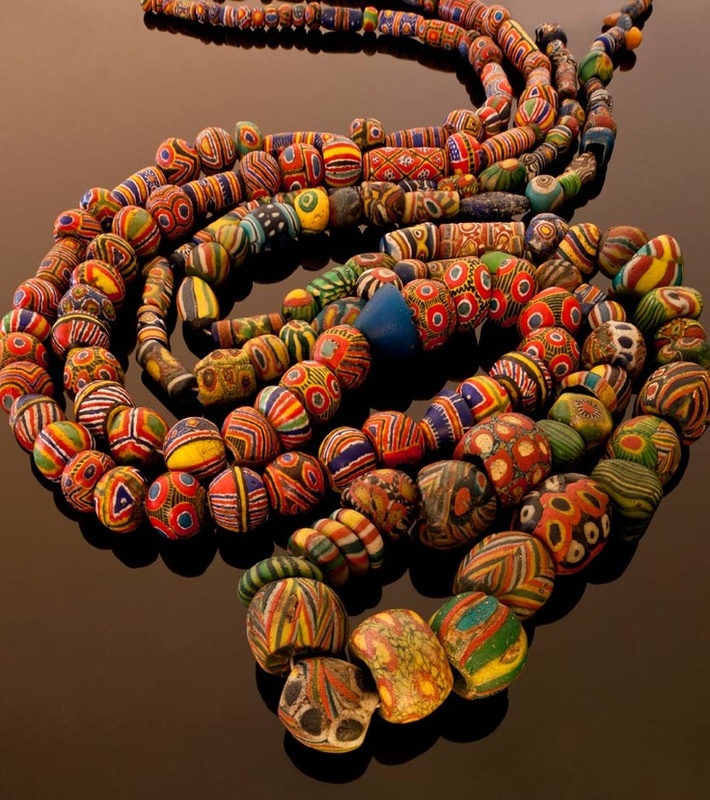 Suzi and I have an incredible collection of Art's wonderful beads that we love sharing with people when we have guests that have never seen his work, we always get plenty of oohs and awes and the people leave with a true appreciation of Art’s special talents. 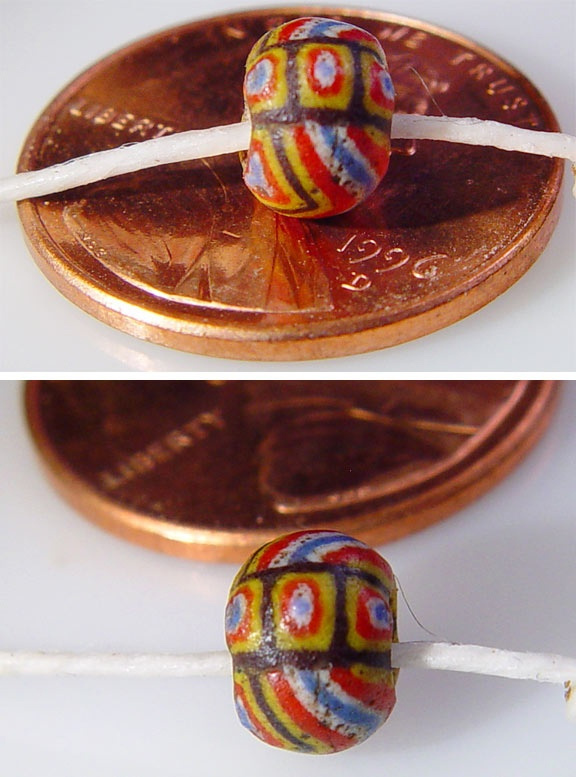 If you have an Art bead or beads to share please post it. 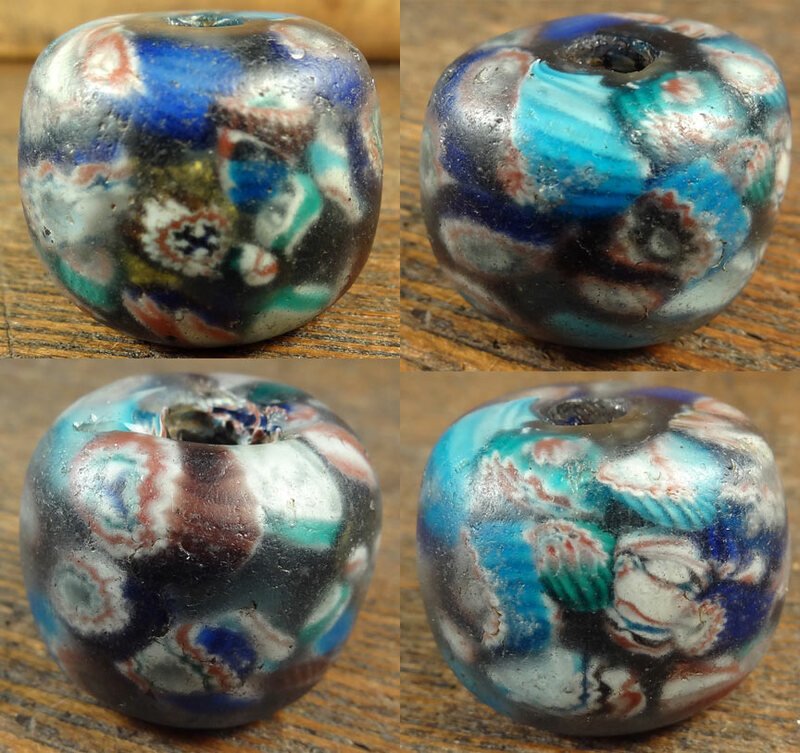 The bead I am posting is one of my favorites and came to us the first time I met Art, after many hours of talking and looking into the wee hours of the morning Art got out “Pandora’s Box” which had mostly very large beads, this bead was so wonderful I just had to have it. Re: Art's BEADS!!! -- lopacki Post Reply Edit Forum Where am I? Actually, I collect very few beads other than the ancient Asians that I think I need for my research into early trade patterns in Southeast Asia. The only exceptions are some kiffas - thanks to TASART who got me hooked - and the occasional Art Seymour creation. 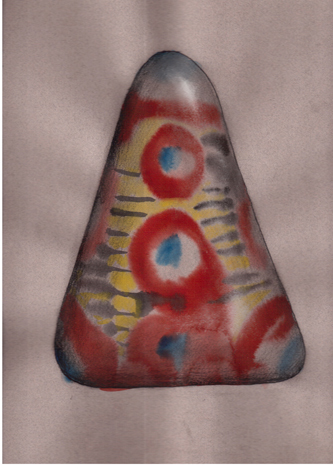 Here's my personal favourite - one of his signed jazz beads (33.5 mm, 18 points, 8 layers). Every time I look at it, I marvel at how perfect it seems to be, and at the same time how full of fun. ...does anyone else match their beads with their clothing? May we see some of your better matches? 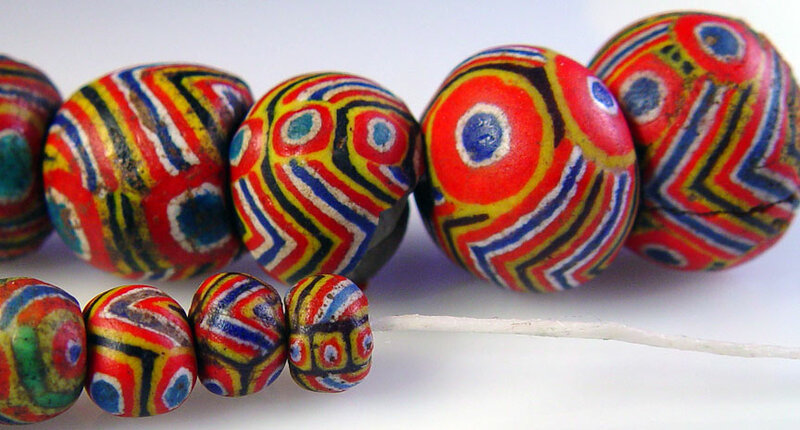 Well, aren't they Krobo beads? See, still a learning post. Re: Just a wild thought... -- Beadster Post Reply Edit Forum Where am I? Cobalt carbonate and cobalt oxide are earth minerals used to create blue colors in glass and ceramic. Cobalt is a very stable mineral, a strong colorant, and consistently remains blue in differing environments of temperature and atmosphere during melting processes. Any cobalt blue glass object that is ground up into powder will be blue when the powder is packed and fused. There are many sources of blue glass. It is far more likely your little beads were formerly jars and bottles. Re: cobalt blue colorant -- birdi Post Reply Edit Forum Where am I? 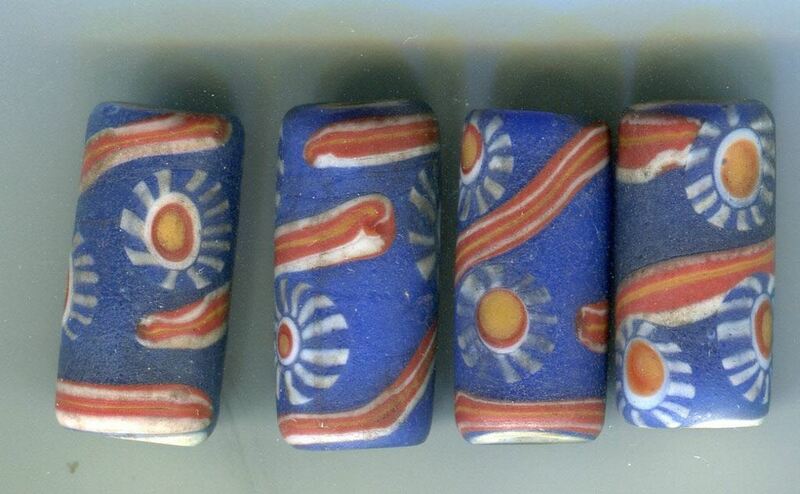 Did the beadmakers that made the glass cores for Kiffas ony use jars and bottles? 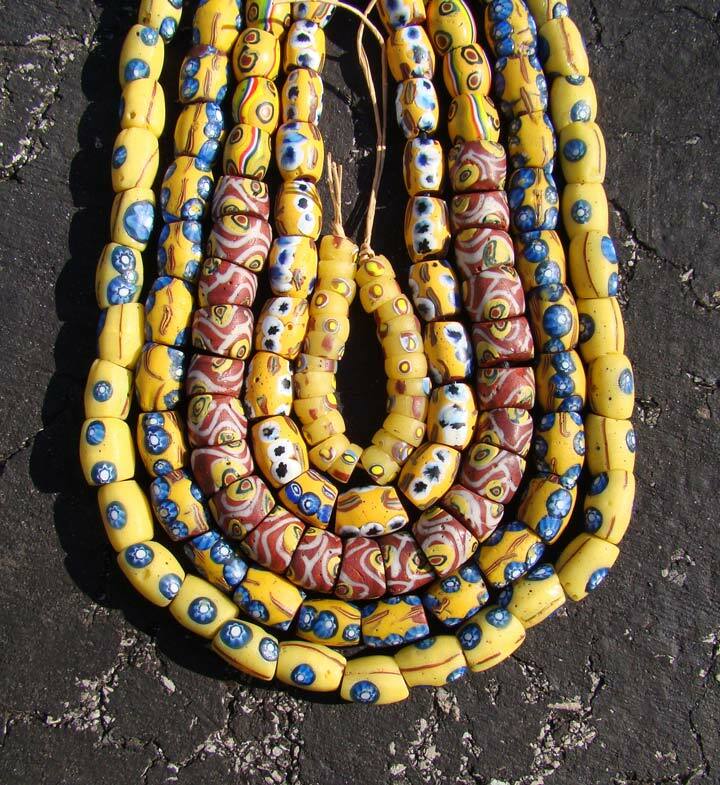 And, don't beadmakers in Africa even stick others beads such as greenhearts into molds for other beads such as the Akosos? I believe they even cook beads in Africa...no? So, I wonder your reasoning for saying it is "far more likely" my "little beads were formerly jars and bottles." Do the words "far more likely" always apply in a place where a bead is more valued if the core is showing such as with a bodom or where a bead such as a morfia is broken into pieces and distributed among family members? And, it's not that I mean to be argumentative...not that one shouldn't have a good spirited argument about one's passions...but, just to say is it really so hard to fathom someone crushing up a strand of beads that perhaps they do not find desirable. Funny, I was wondering how many people were aghast as I did wirework around my ancient eye bead shown in the "have you ever" thread. It may not have been the smartest thing to do..and I'm not really happy with that particular necklace. And, I know that in redoing it, should I cut the wire...I should proceed very cautiously. ...and I asked for the special with a double side of Nueva Cadiz and a Coconut Heishi chaser. Re: I was at this little cafe in Mauretania... -- Beadster Post Reply Edit Forum Where am I? 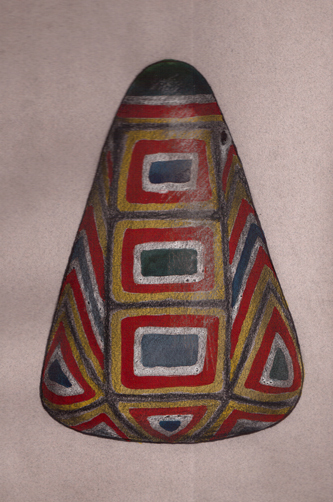 Re: Nice floral design inside bottom triangle design on the Kiffa bead -- TASART Post Reply Edit Forum Where am I? A better view for you Thomas. 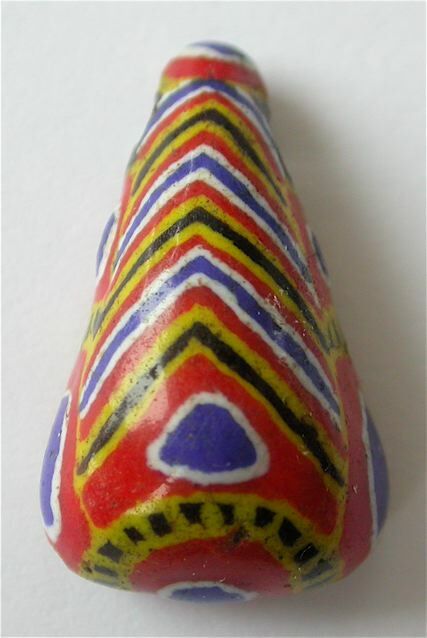 Re: Re: Nice floral design inside bottom triangle design on the Kiffa bead -- Beadster Post Reply Edit Forum Where am I? LA Bead Society Fall Bead Bazaar this weekend.......Kiffas! I'm coming down with lots of my beads and some old collectible beads I'm parting with . Anyone up for a Sunday Show & Tell...? I am back home from several weeks of travel. I have been playing catch up with the post on the BCN. My some very exciting photographs of great things. Here is my much posted scan of my graduated strand of Venetian bicone black fancy eye "king" beads from the early 1900's. Re: Anyone up for a Sunday Show & Tell...? -- Dog Bone Crazy Post Reply Edit Forum Where am I? some weeks ago I was generously blessed by Joyce first, who sent me a beautiful package with an old Chevron cane (and a huge new Chinese Chev. cane and very nice oval Chinese Millefiori, copies from Venetians...), and two weeks or so later another gift arrived from John and Ruth P., with the large red Venetian Chev. from the same time period. Re: Just a short one for me.... -- uwe Post Reply Edit Forum Where am I? From the inside out, it's cobalt blue, opaque red, cobalt blue, white, opaque red. I love the beads made from it - and I think some beads as well as cane may be still available from the Picards. Uwe does a fantastic job grinding! The two discs are perfect on simple silver hoops. 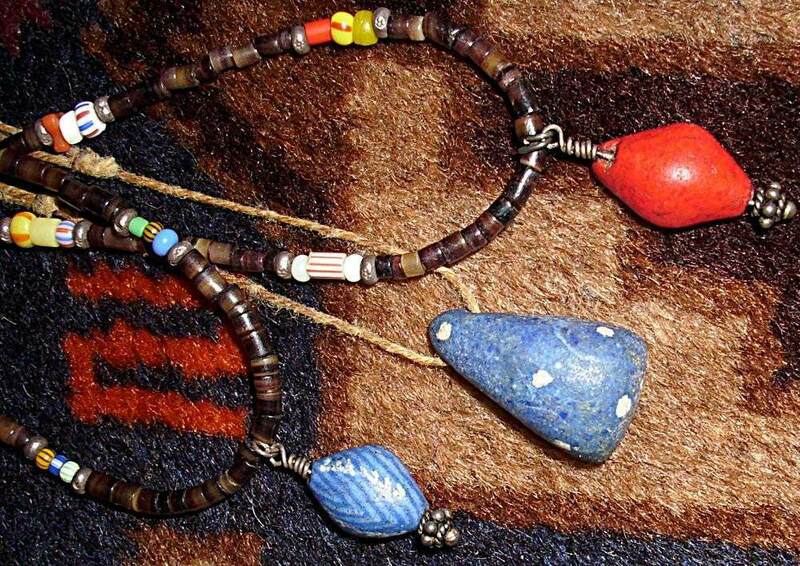 With the other 2, I recently strung a necklace with the only polychrome Kiffa triangle I own. 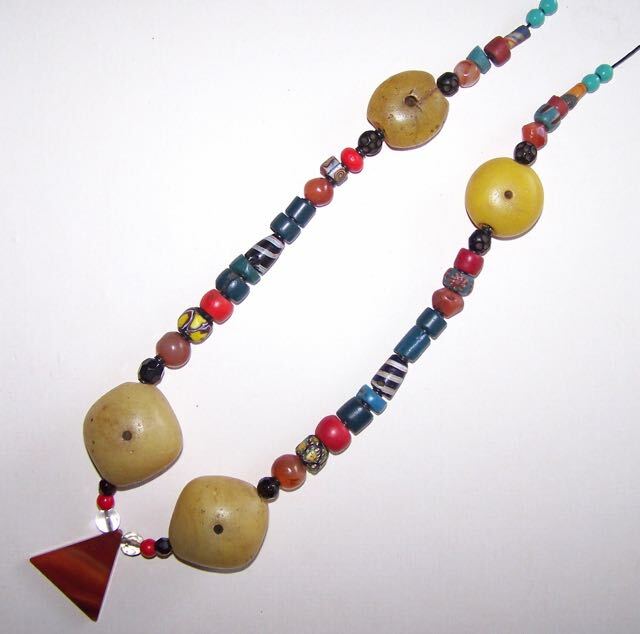 I put it on heavy black artificial sinew, with a knot on each side of the triangle (but not tightly) to prevent the weight of the other beads from bearing down on the Kiffa triangle. Since Kiffa are of powderglass, and the perforation is very close to the back "wall" of the bead, I want to be as careful with it as possible. 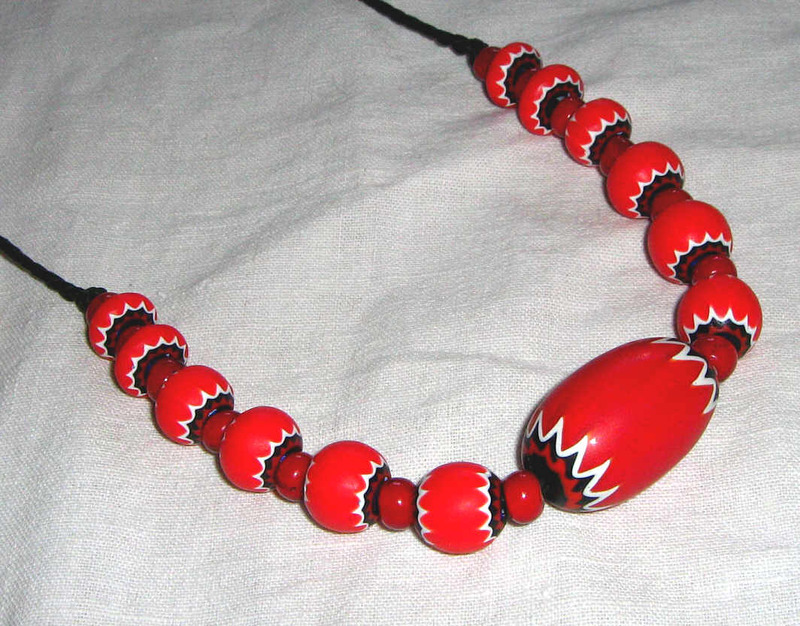 The red rosetta discs by Uwe on this necklace are really special, because he also drilled a little suspension hole just about 4mm away from the outer edge of the beads! I can't figure out how he did it. So, I made a suspension loop for each of these by threading seven 2mm sterling beads through the hole of each bead. Then when I strung the necklace, there are two 2mm sterling beads strung where I placed the suspended rosetta disc, so that they swing freely. There are bead gifts from 3 people on this tiny necklace. Besides that, beads purchased from at least 4 separate sources. Which is why I don't get in a big hurry with these projects...no matter how small. Thanks again, Uwe, for these fabulous little labor-intensive treasures! The red disc earrings were worn to see Foghat and Blue Oyster Cult last month! Mr. DBC, great to hear from you and thank you for Sunday S & T. Did you make it to the Friendship rendezvous last month? I imagine Art and Basket Bob were there, possibly Nicole, Bully and a few other African dealers? I'd love to see images if anyone has any. 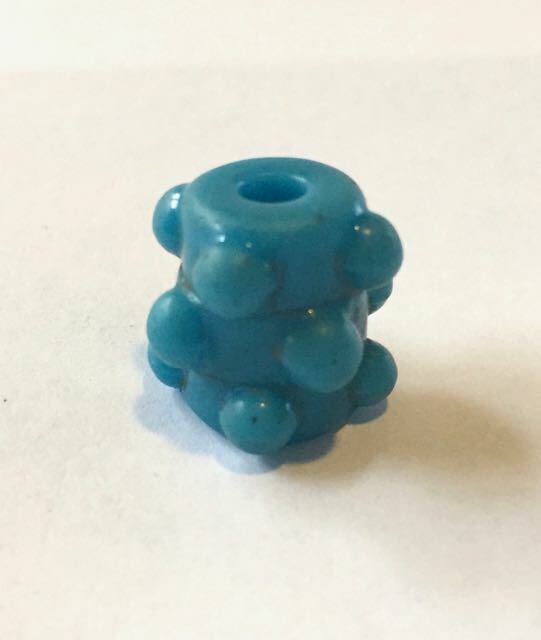 Could someone please identify these beads for me! Re: What are these? -- tcar8502 Post Reply Edit Forum Where am I? Bead ID please ... sorry, small photo. 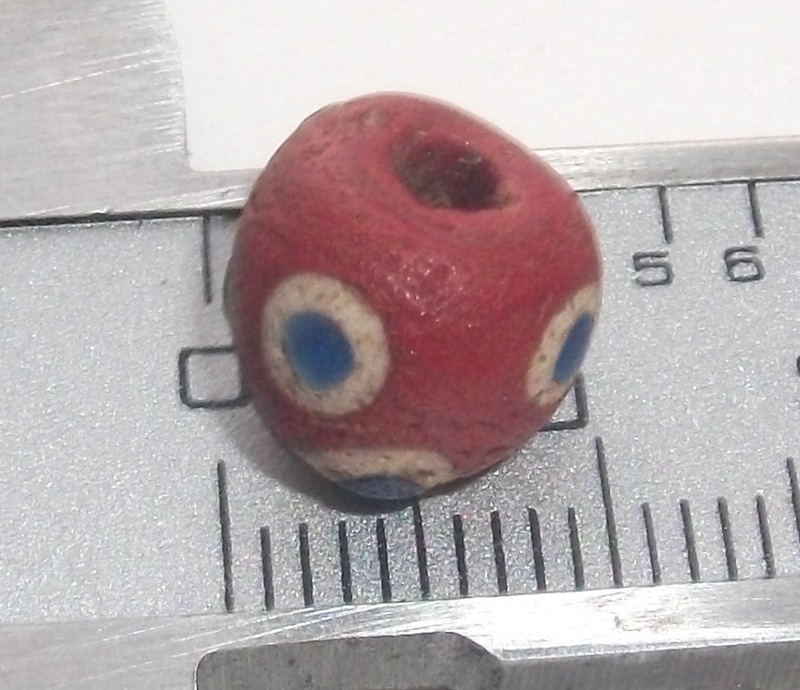 Re: Bead ID please ... sorry, small photo. -- plaza Post Reply Edit Forum Where am I? 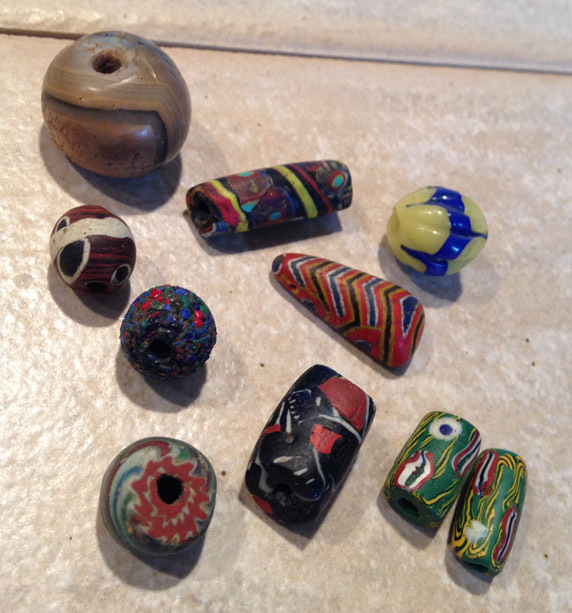 some of my favorite bead varieties, Kiffa pre-coursers of course!